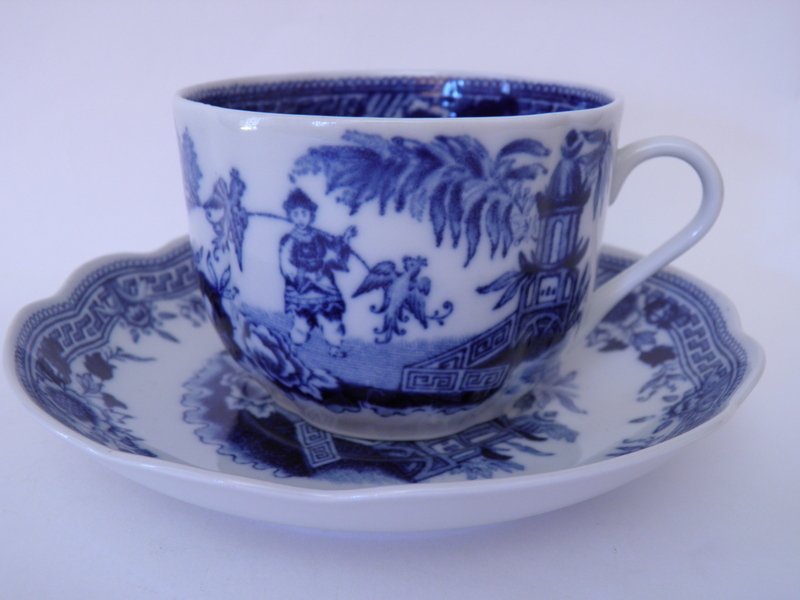 Tea cup & saucer China tea by Domino model, Arabia, decoration Dorrit von Fieandt. 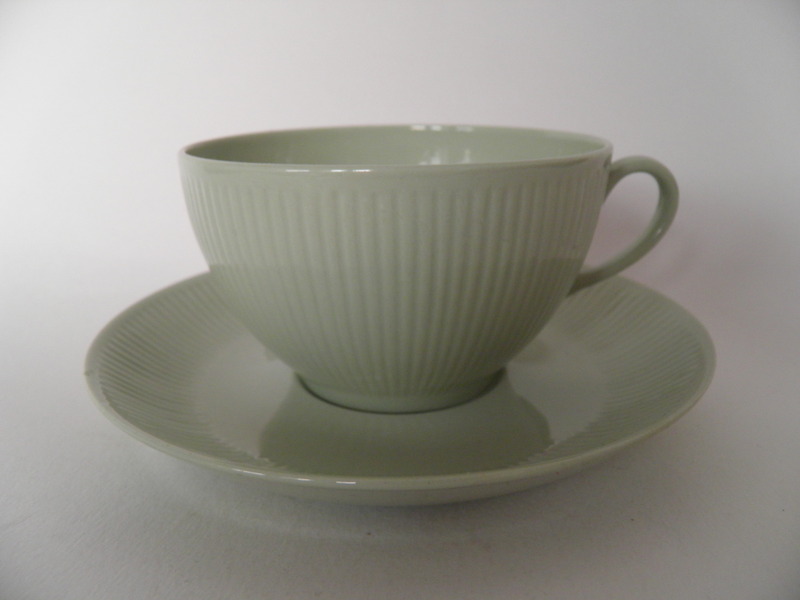 Mint brown 24h tea cup and saucer by Arabia. 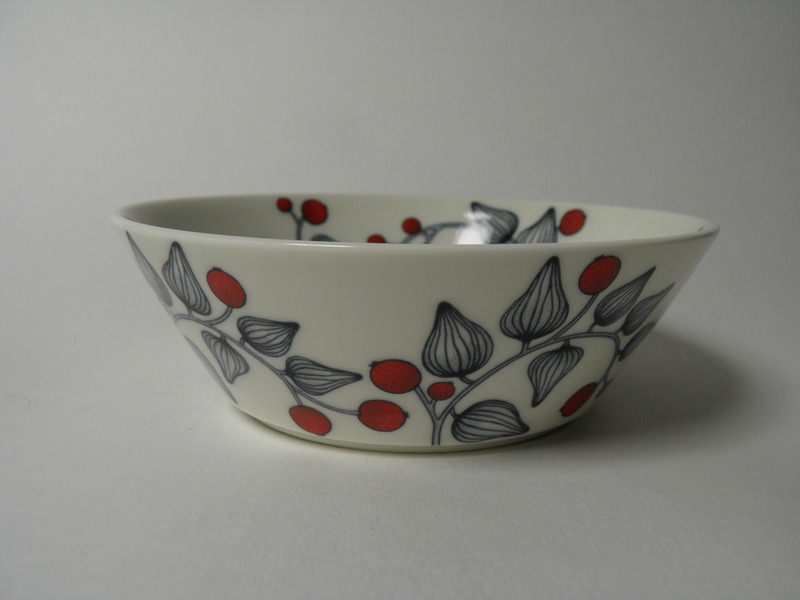 Designed by Heikki Orvola. Brown 24 h side/salad plate, Arabia, Heikki Orvola ja Kati Tuominen-Niittylä. 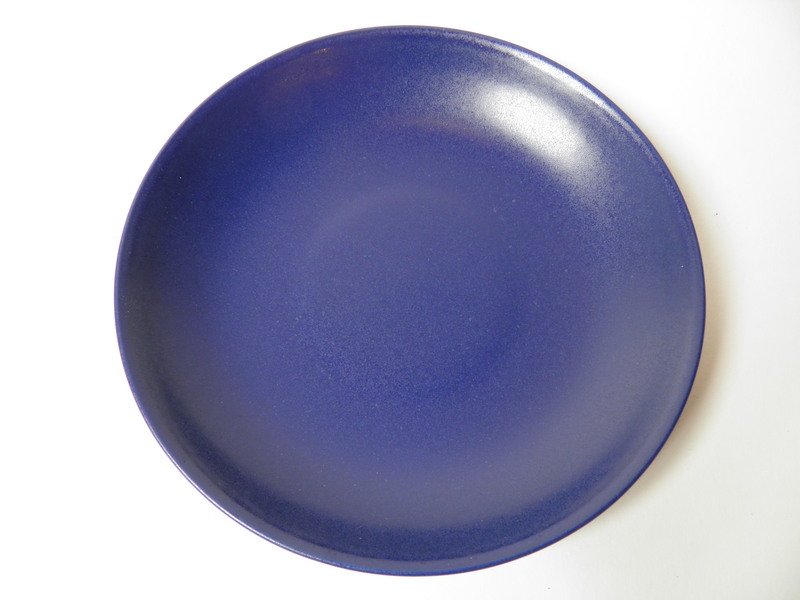 Darkblue plate by 24h -series, Arabia, Heikki Orvola. 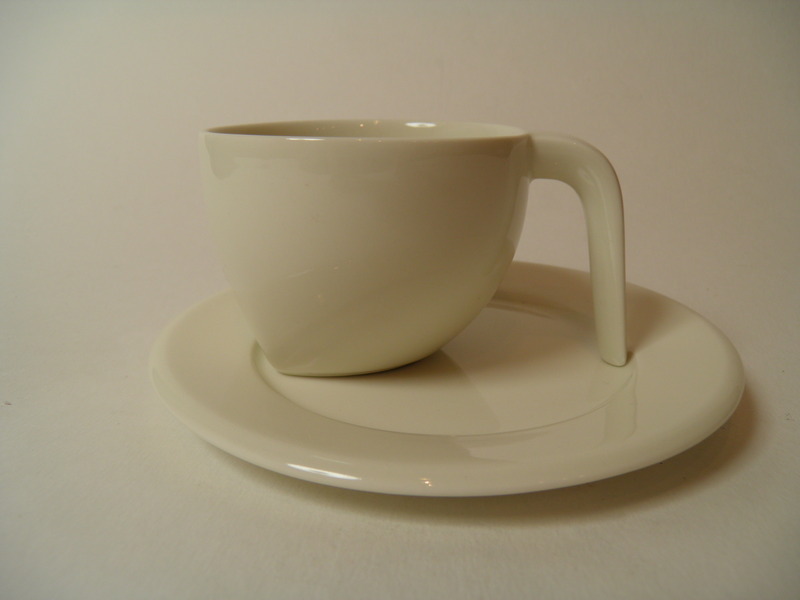 Mint coffee cup and saucer by Arabia Airisto -series. Designed 1983 by Inkeri Leivo. 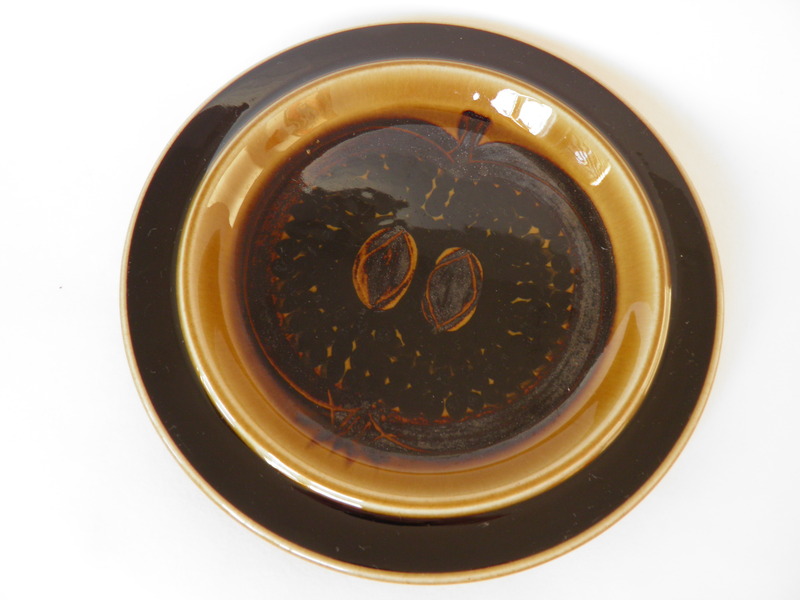 Mint plate named Airisto by Arabia. Designed by Inkeri Leivo. 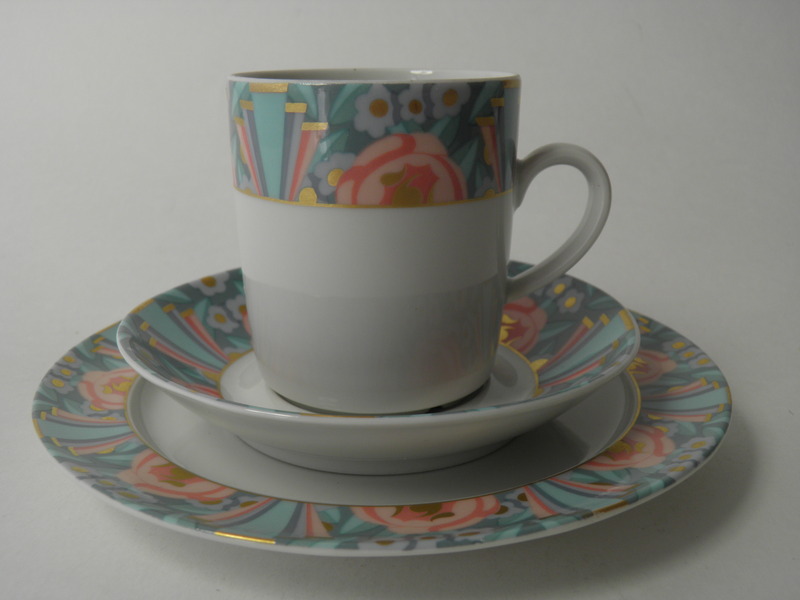 Mint, high model teacup and saucer Airisto. Designed by Inkeri Leivo. 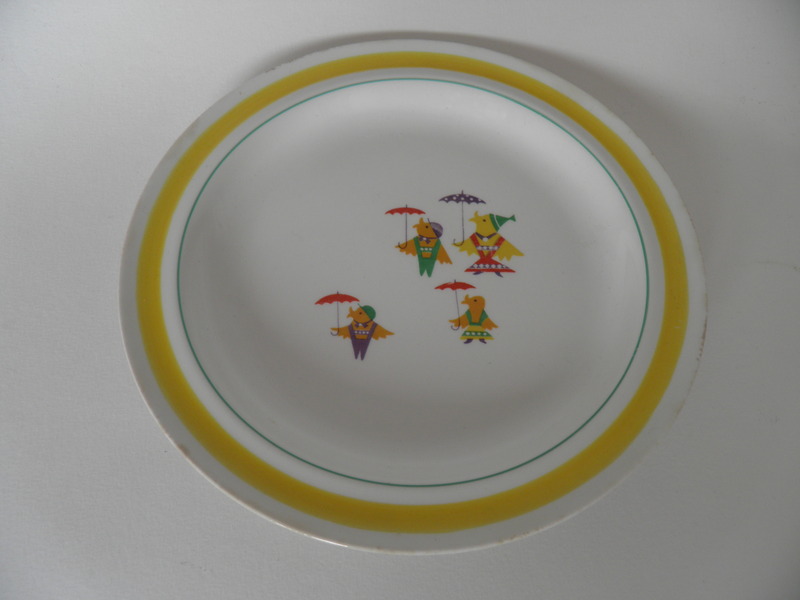 Alexia plate by Floria -series, Arabia, Howard Smith. 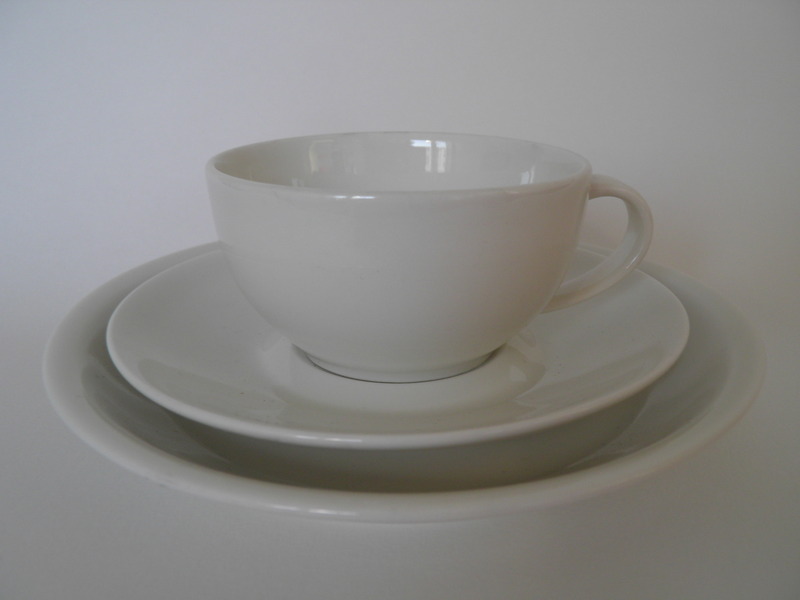 Coffee cup & saucer & side plate by Amoroso -series, Arabia design, Rorstrand, Heikki Orvola. 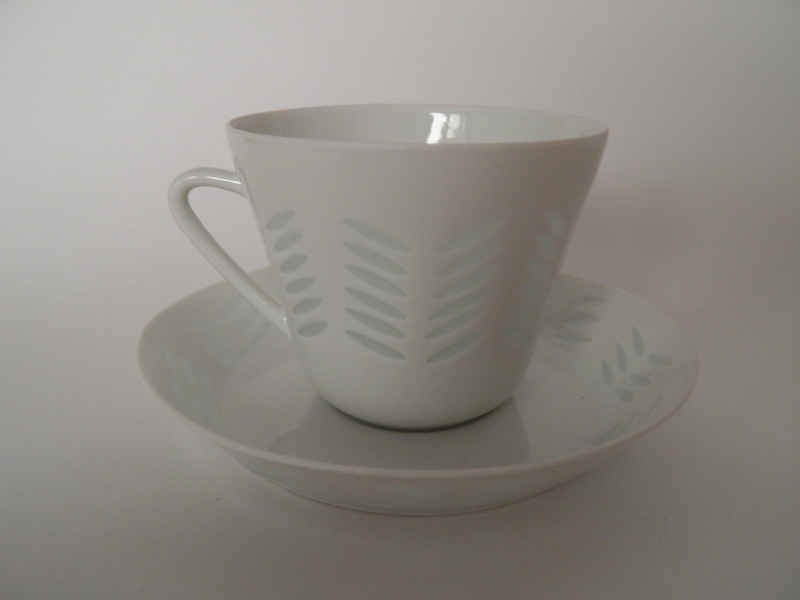 Coffee cup & saucer by Amoroso -series, Arabia design, Rorstrand, Heikki Orvola. 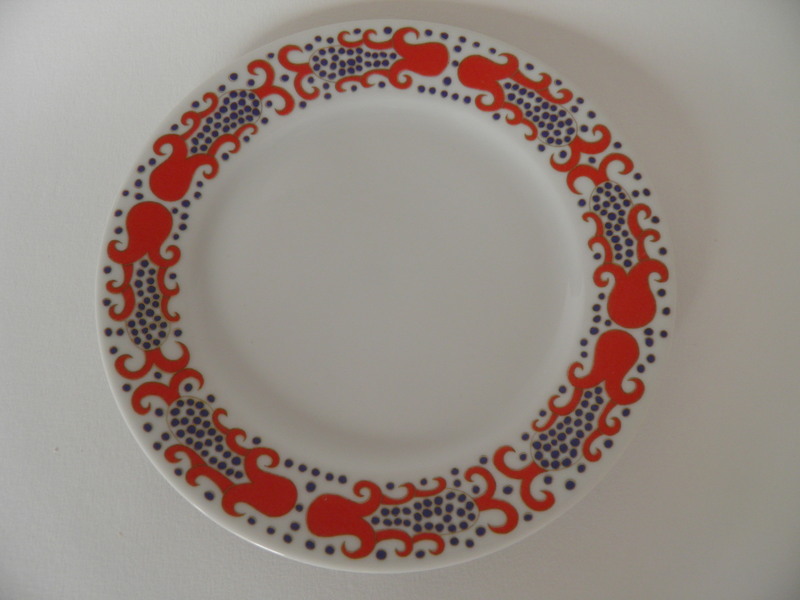 Dinner plate by Amoroso -series, Arabia design, Rorstrand, Heikki Orvola. 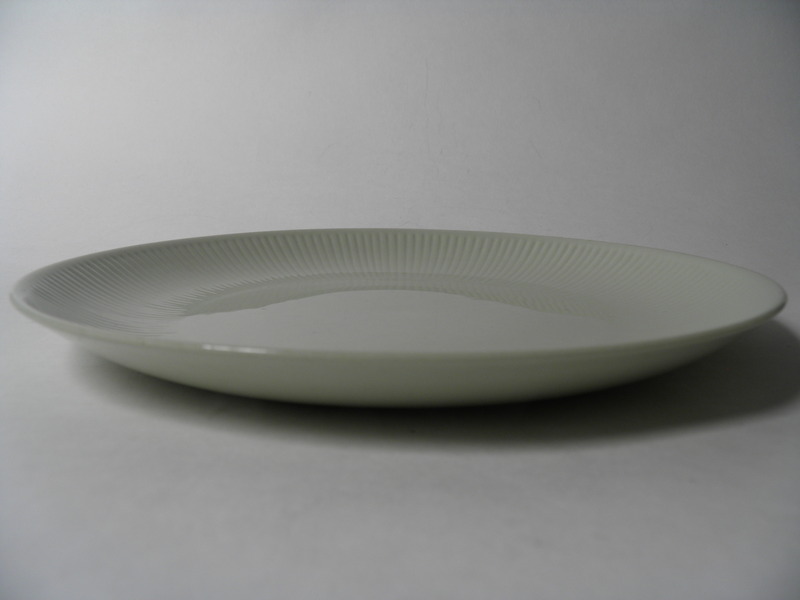 Soup plate by Apila -series, Arabia, Birger Kaipiainen. 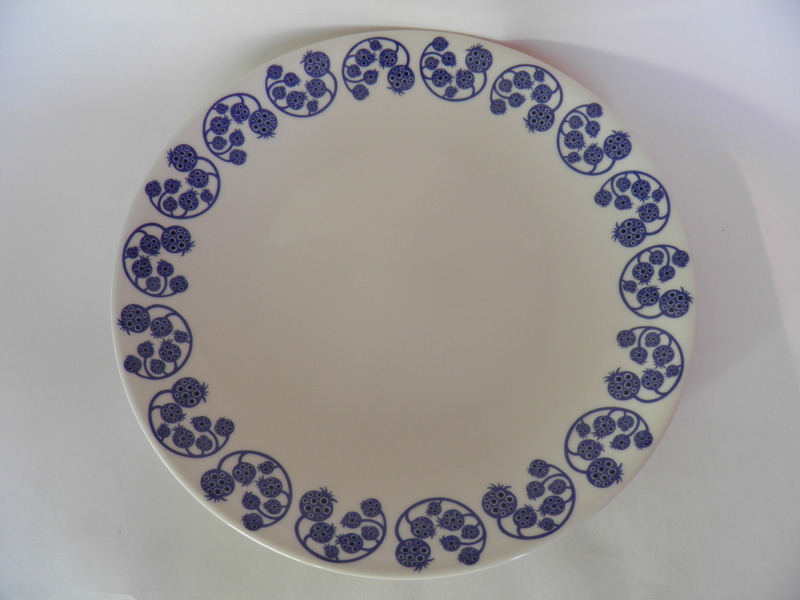 Apila dinner plate, Arabia, Birger Kaipiainen. 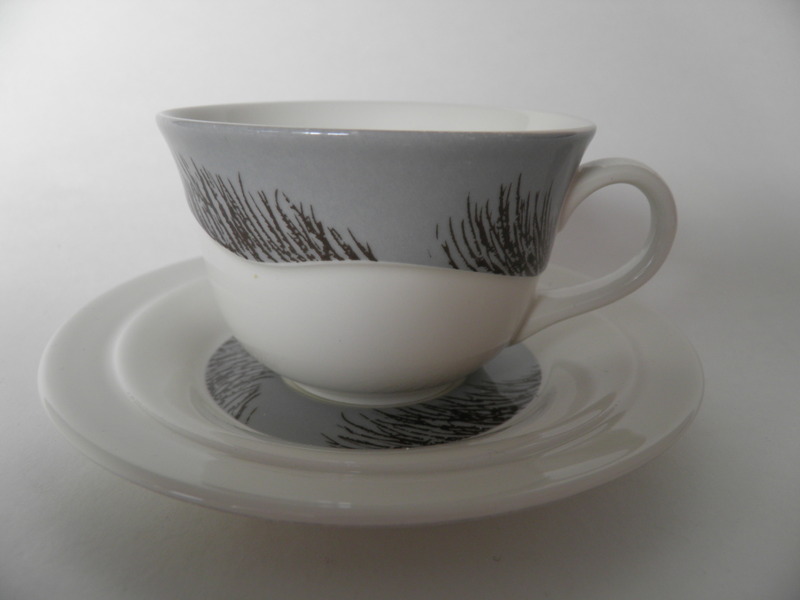 Coffee cup & saucer by Arctica Poetica -series, Arabia, decoration Dorrit von Fieandt. 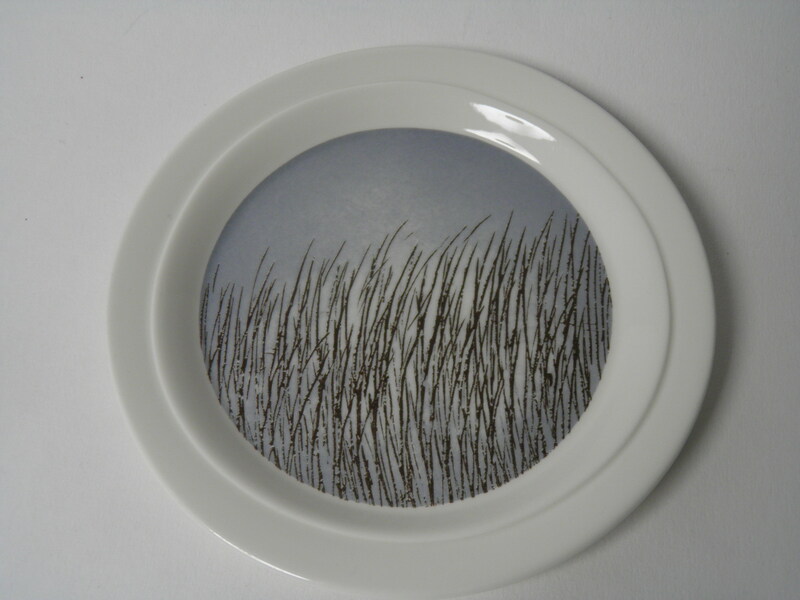 Dinner plate by Arctica Poetica -series, Arabia, decoration Dorrit on Fieandt. Tea cup and saucer by Aslak -series, Arabia, Inkeri Leivo. 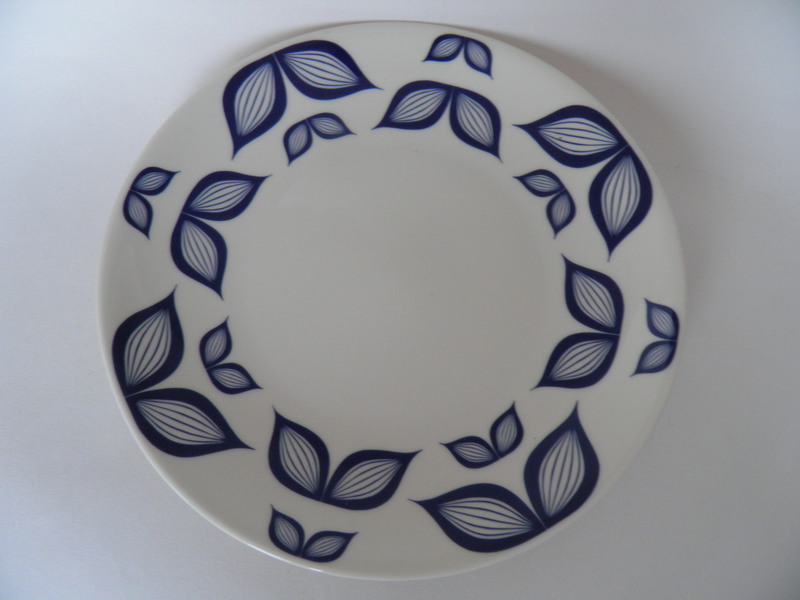 Dinner plate by BeBop -series, Arabia, Heikki Orvola. 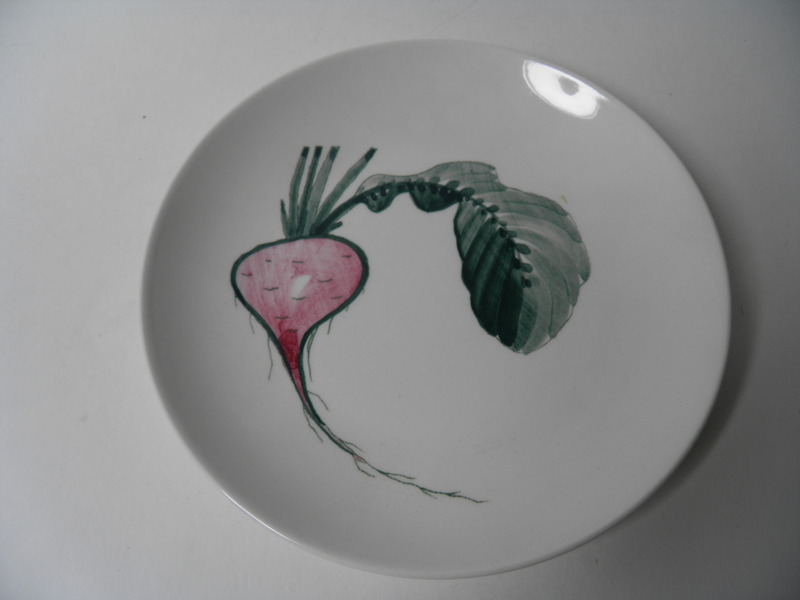 Handpainted plate Beetroot by Vegetable -series, Arabia 1955-1957, Anja Juurikkala. Blueberry plate, Arabia Seasonal Product. Blue Riikinkukko breakfast set, Arabia, Raija Uosikkinen. 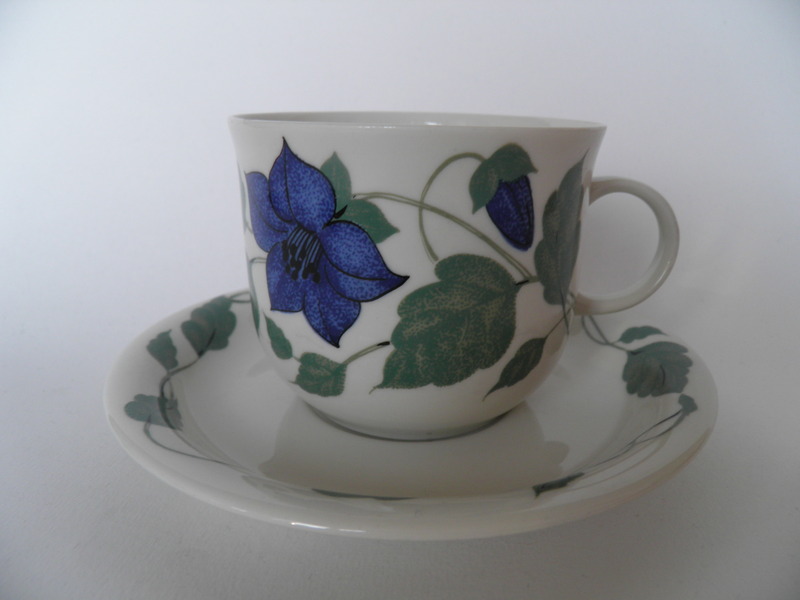 Big, handpainted cup & saucer, Arabia, Esteri Tomula. 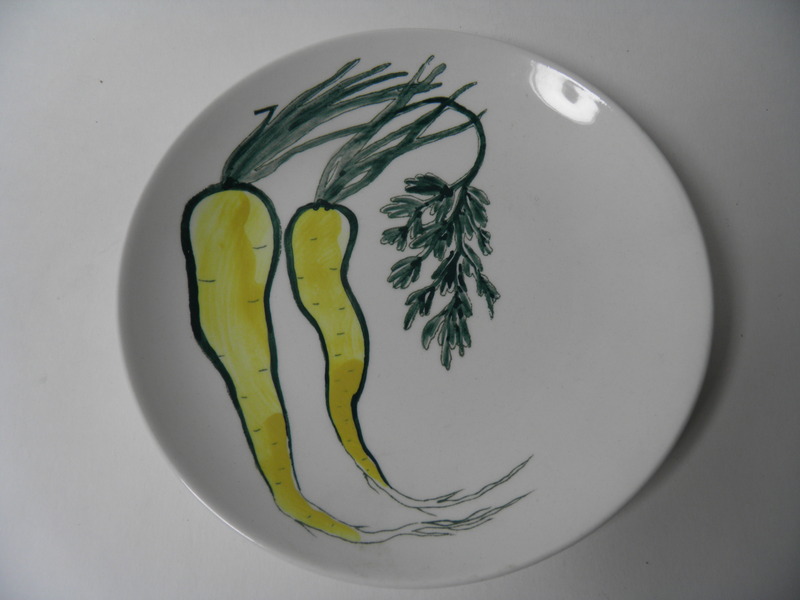 Handpainted plate Carrot by Vegetable -series, Arabia 1955-1957, Anja Juurikkala. 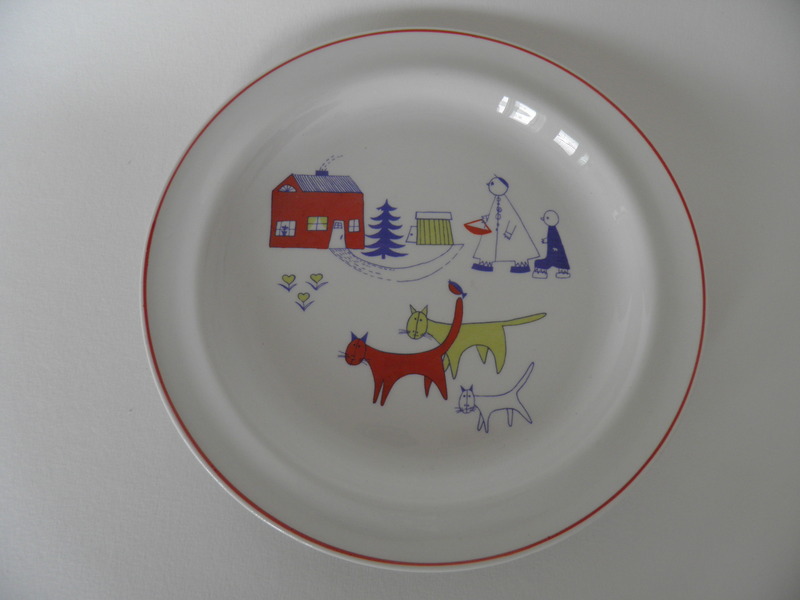 Children's plate Matin Matka, Arabia, Raija Uosikkinen. 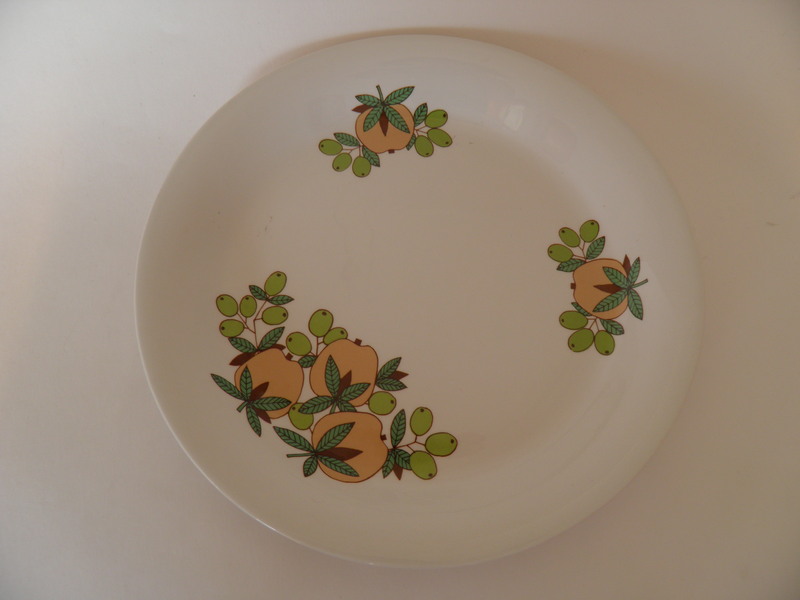 Flat children's plate Winter Wren - Peukaloinen - by Arabia. Designed by Gunvor Olin-Grönqvist. 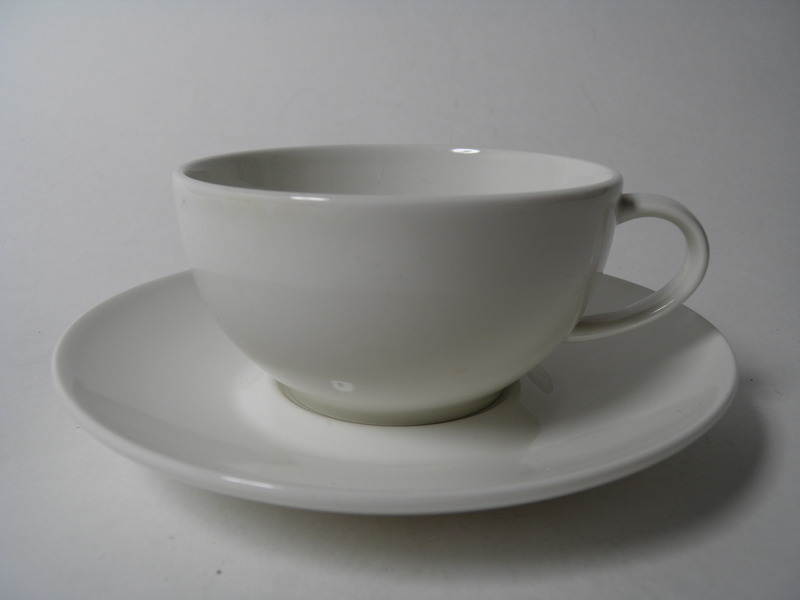 Arabia's coffee cup and saucer by China -series. Good condition. 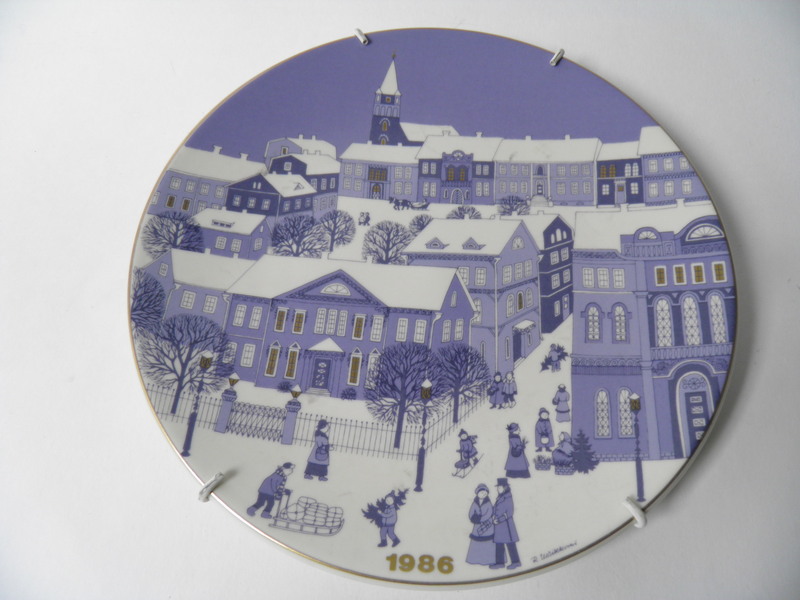 Christmas plate year 1976, Arabia, Raija Uosikkinen. Claudia plate by Floria -series, Arabia, Howard Smith. 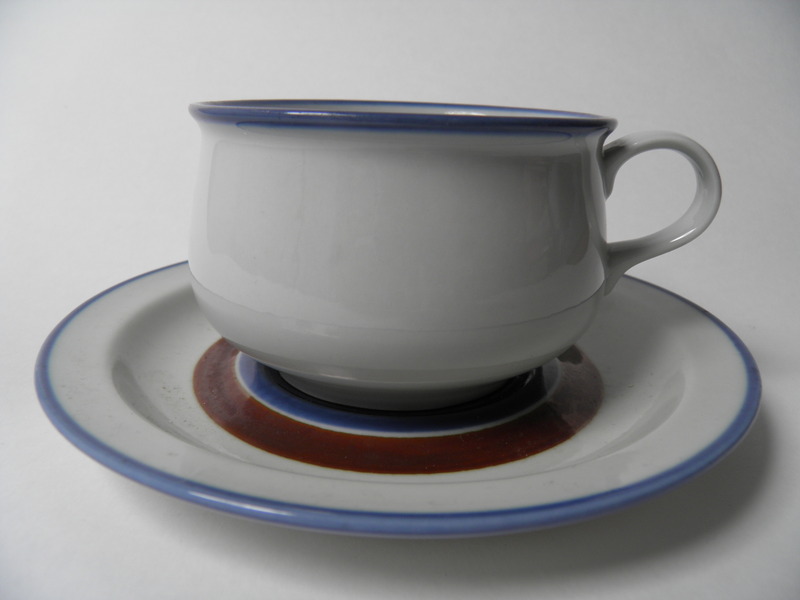 Coffee cup & saucer with bluegrey decoration, Arabia. 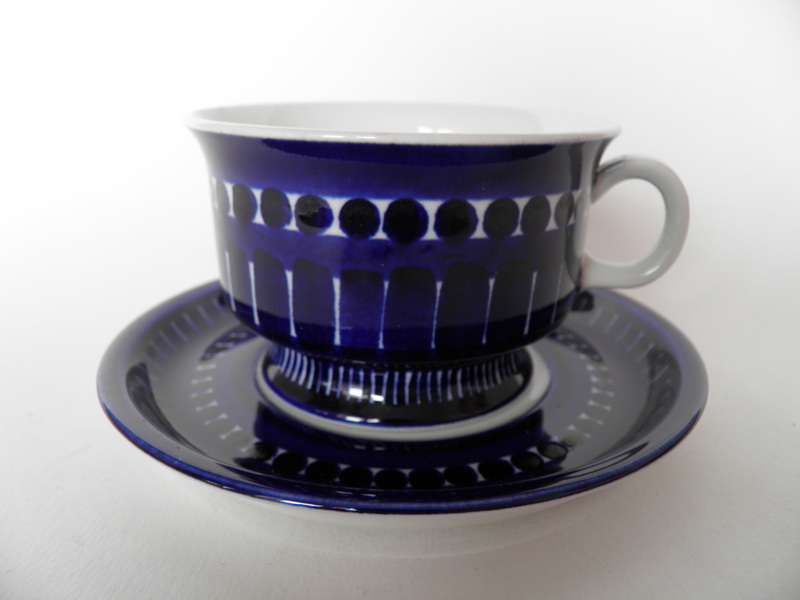 Small, blue-white coffee cup & saucer ND model, Arabia, Ulla Procopé. 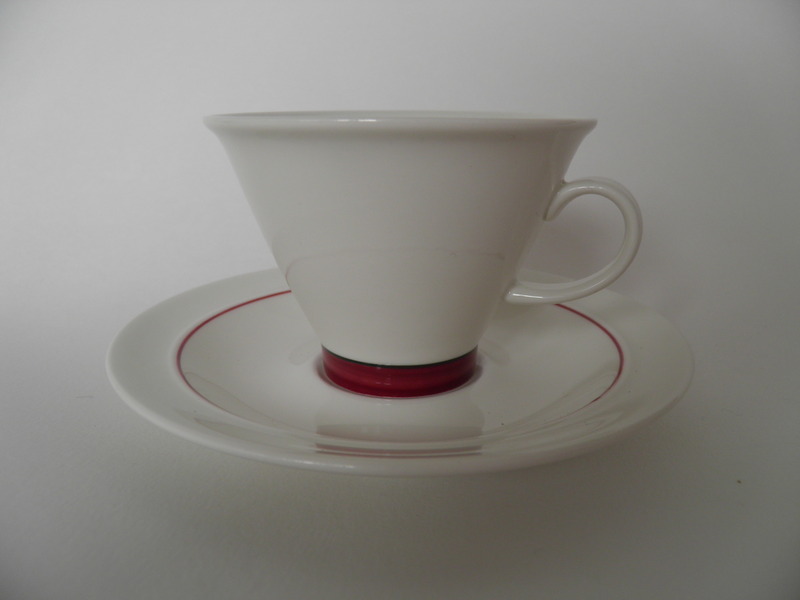 Small, red-white coffee cup & saucer ND model, Arabia, Ulla Procopé. 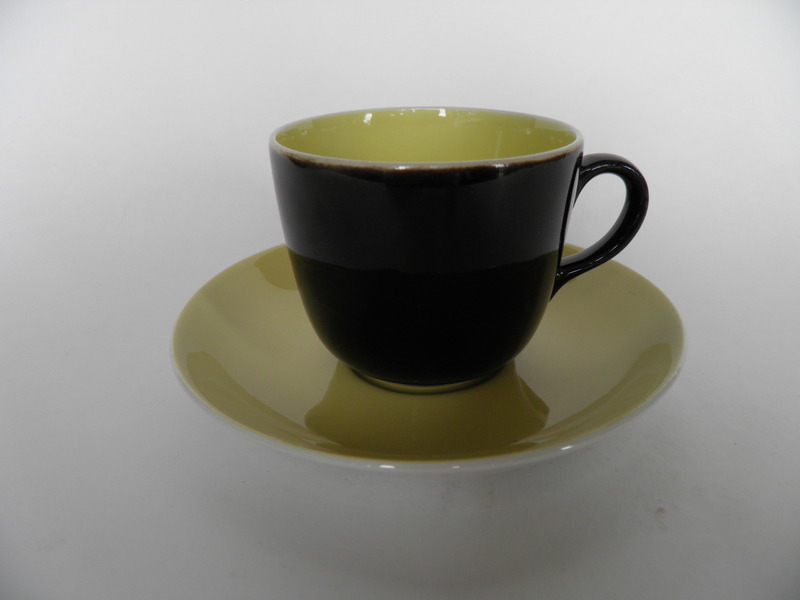 Coffee cup and saucer with yellow circle by Arabia. 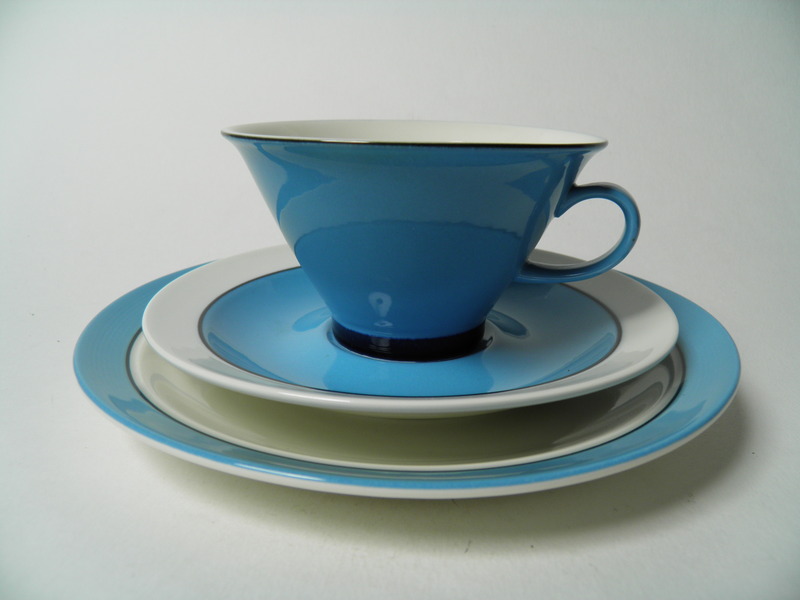 Mint, blue Combo tea cup and saucer by Arabia. Designed by Howard Smith. 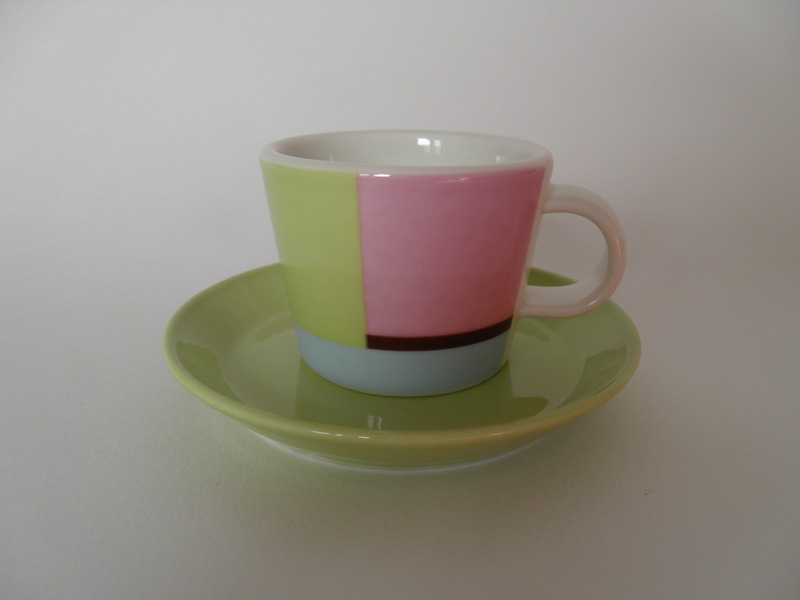 Mint Domino coffee cup with saucer and cake plate by Arabia. Designed by Kati Tuominen-Niittylä ja Pekka Paikkari. Tea cup & saucer by Domino -series, Arabia, Kati Tuominen-Niittylä and Pekka Paikkari. 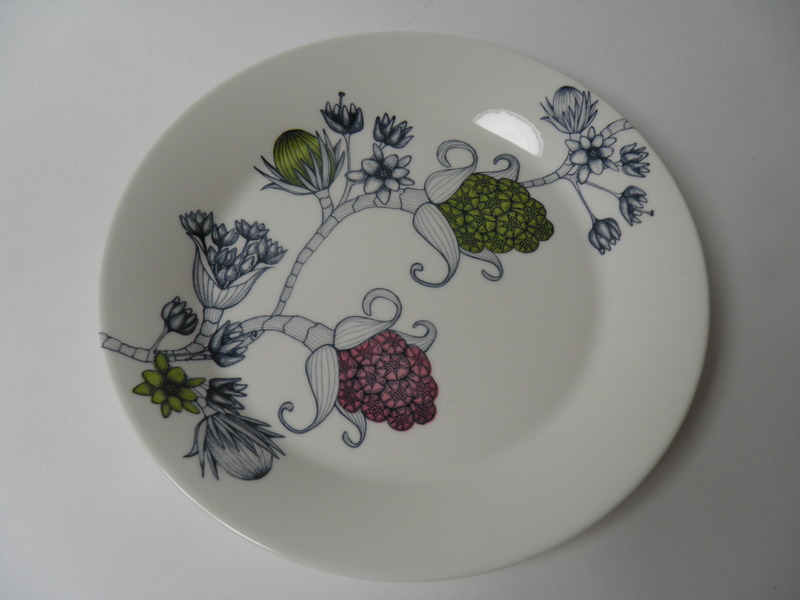 Deep plate Eden by Arabia. Designed by Raija Uosikkinen. Good condition. 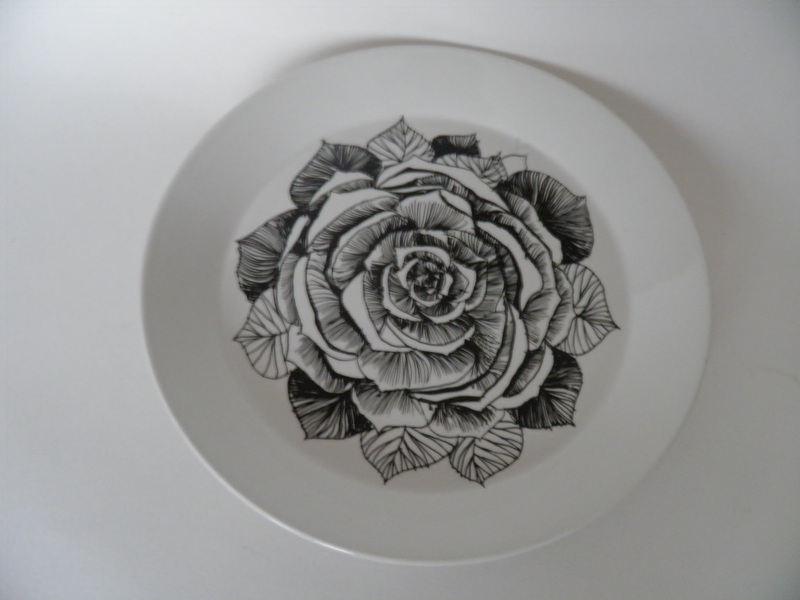 Eden dinner plate by Arabia. Designed by Raija Uosikkinen. Good condition. 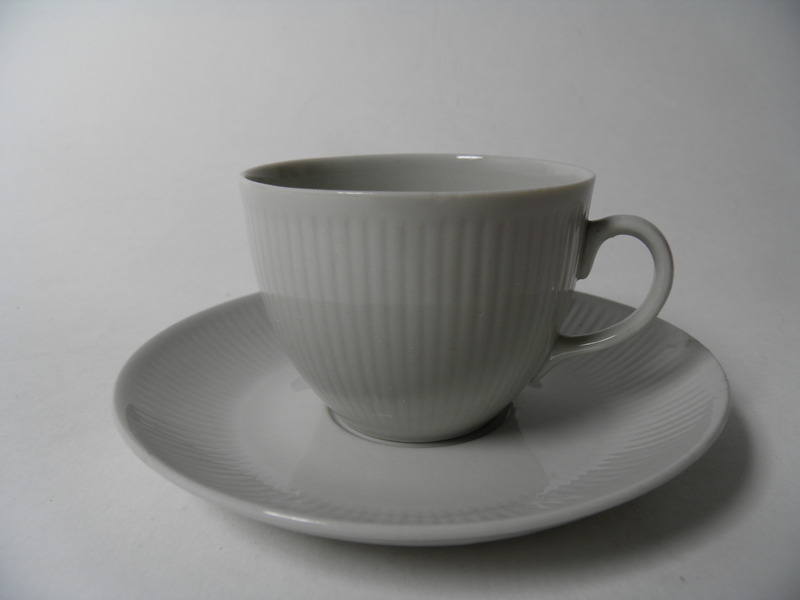 Ego coffee cup and saucer by Arabia / Iittala. Designed by Stefan Lindfors. 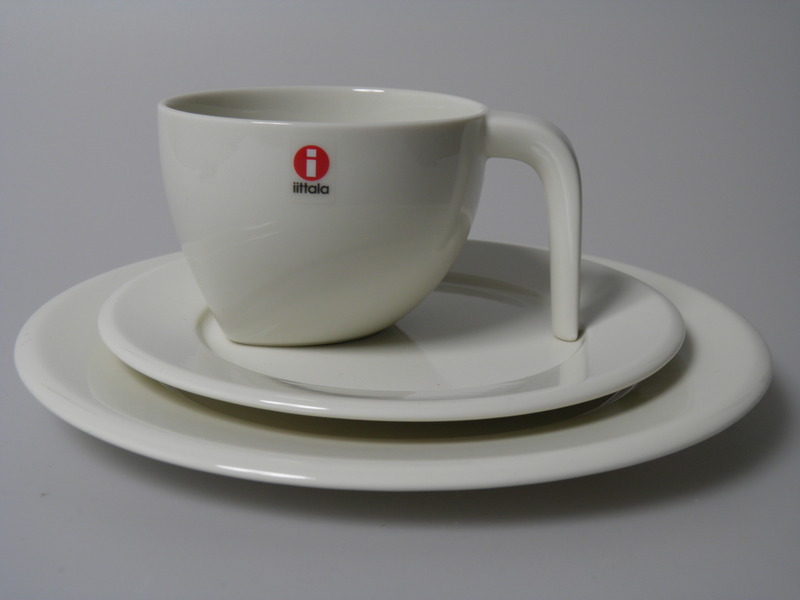 Coffee cup & saucer & side plate by Ego -series, Iittala, Stefan Lindfors. 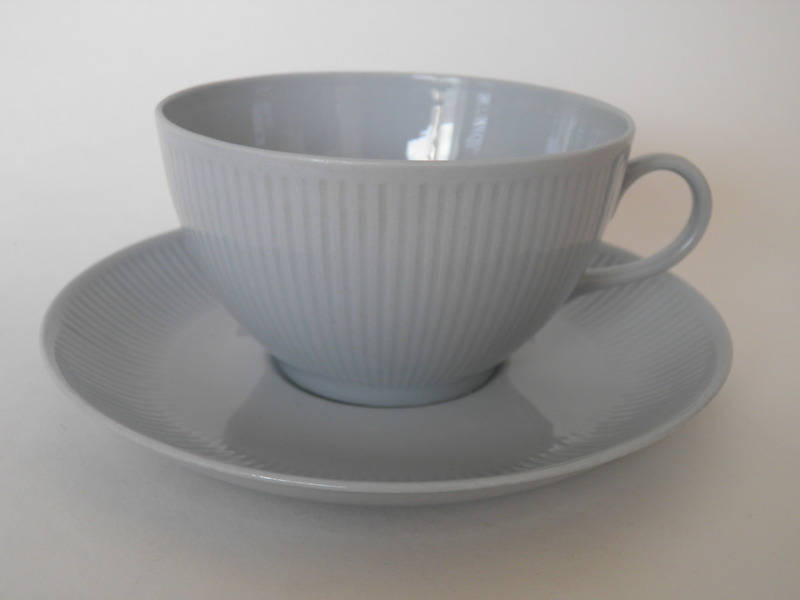 Mint Ego espresso cup and saucer by Arabia / Iittala. Designed by Stefan Lindfors. 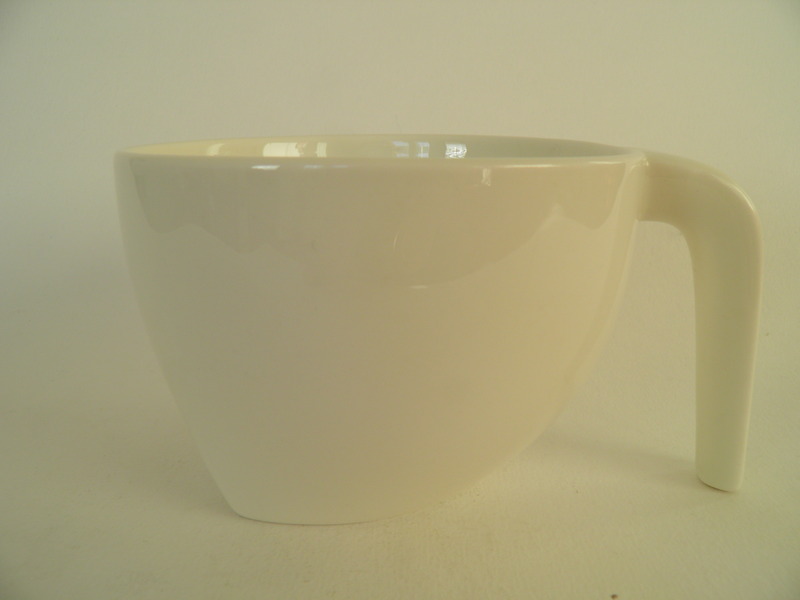 Large Ego cup, Iittala, Stefan Lindfors. 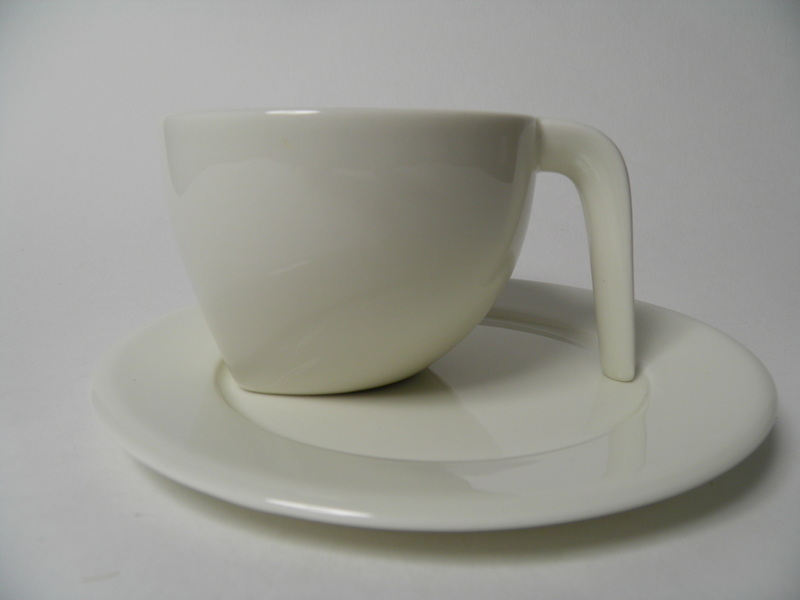 Ego latte cup and saucer, Arabia, Stefan Lindfors. 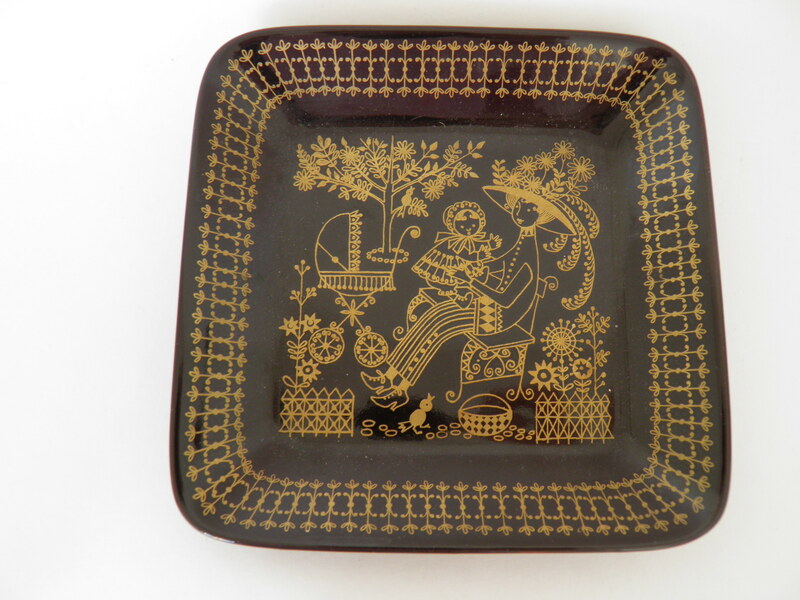 Mint, black square plate with golden decoration by Emilia -series of Arabia. Designed by Raija Uosikkinen. 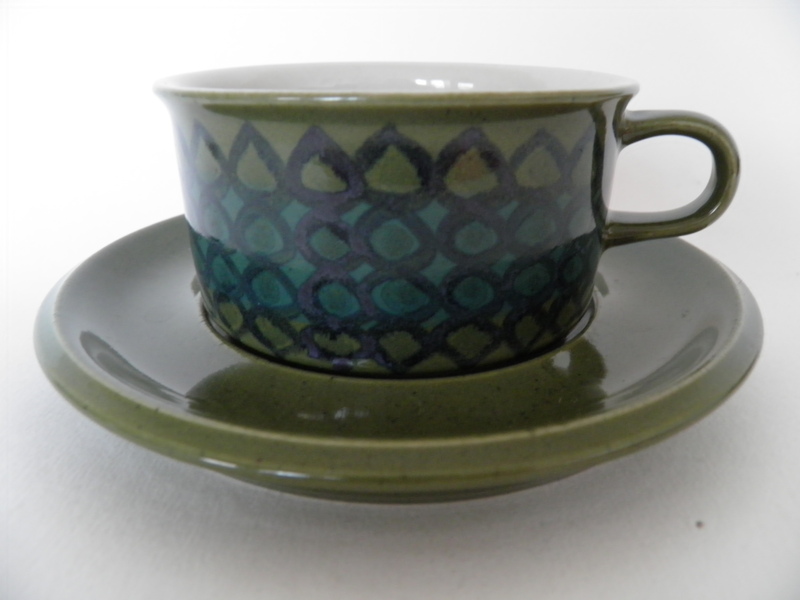 Green coffee cup & saucer & sideplate by Esmeralda -series, Arabia, Laila Hakala. 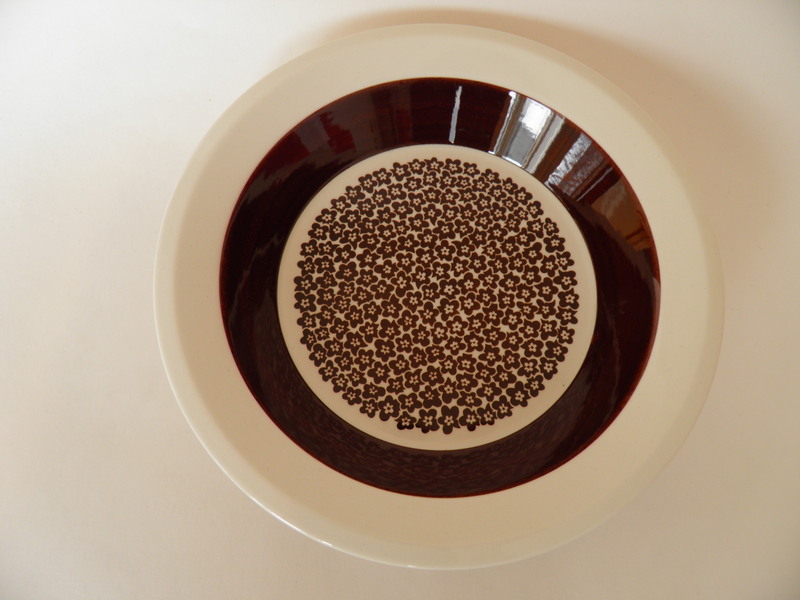 Side plate by red Esmeralda -series, Arabia, Laila Hakala. 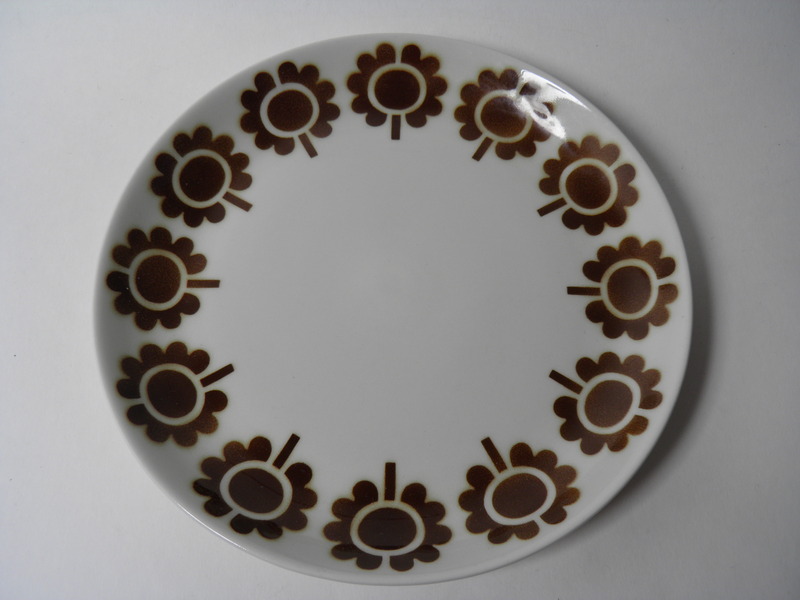 Side plate with brown flowers by Faenza -series, Arabia, Inkeri Seppälä. 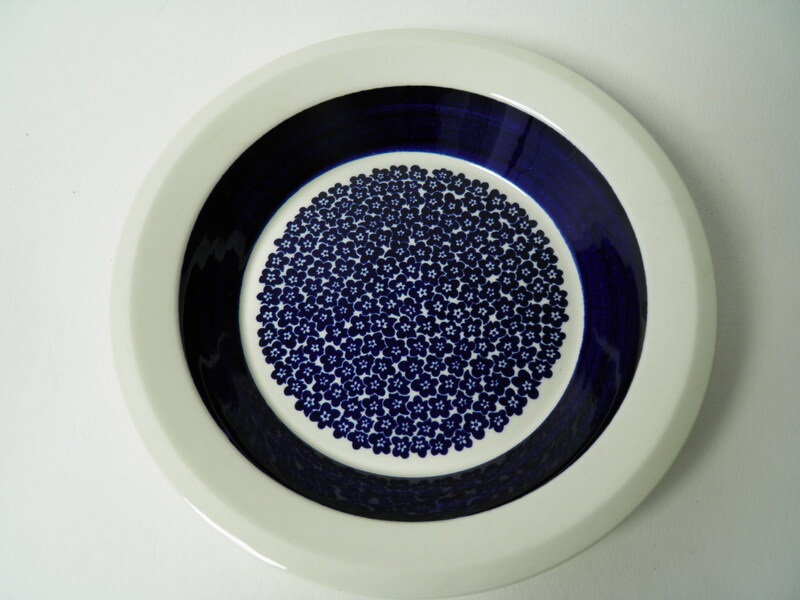 Blue soup/deep plate by Faenza -series, Arabia, decoration Inkeri Seppälä. 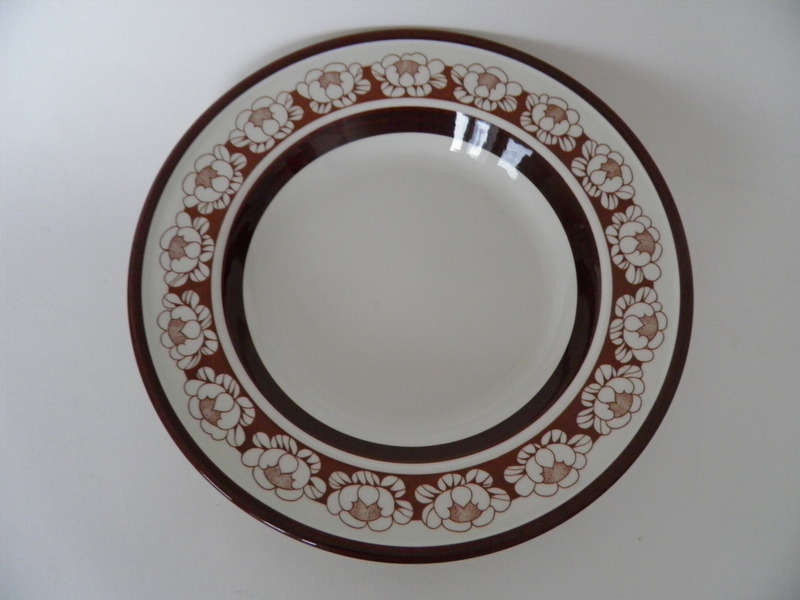 Faenza soup plate with brown flowers by Arabia. Designed by Inkeri Seppälä. 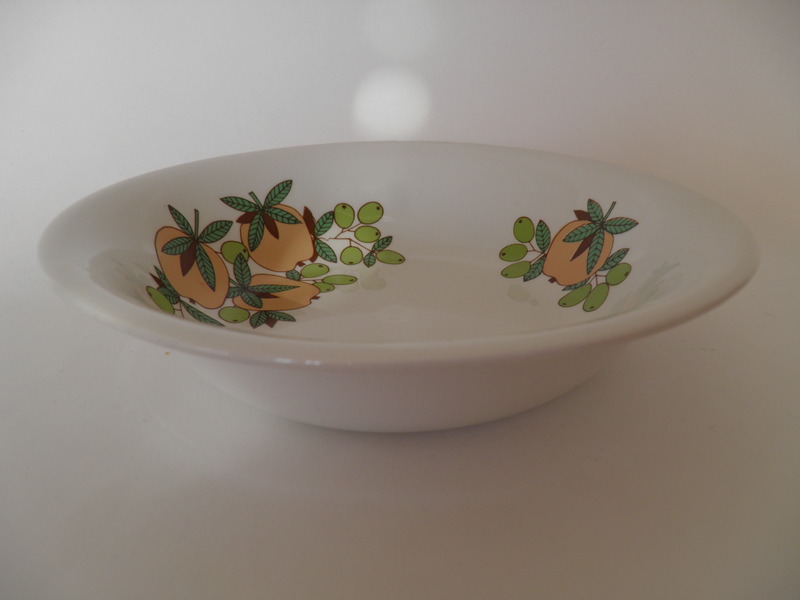 Mint, rare porridge plate Faenza by Arabia. Black stribe decoration. Blue Kitchen (Sininen Keittiö) father's cup & saucer, Arabia. 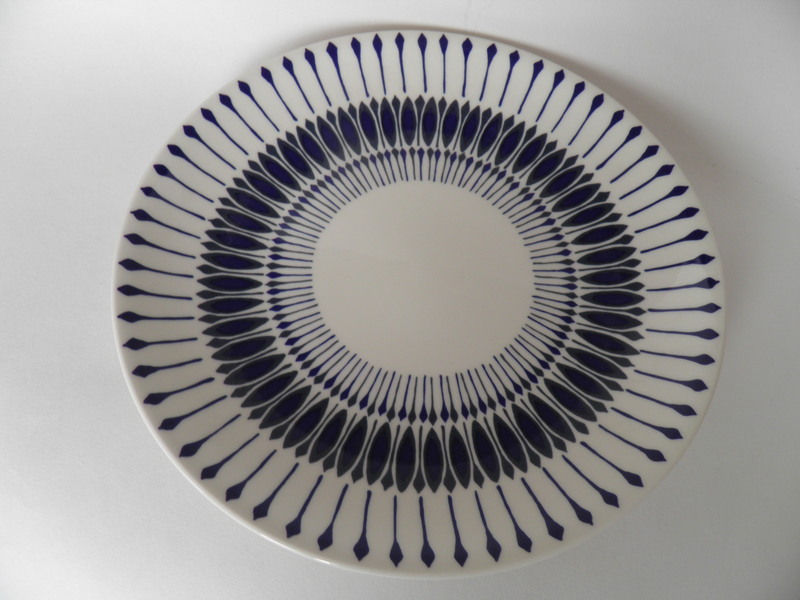 Filigran side plate, Arabia, Raija Uosikkinen. 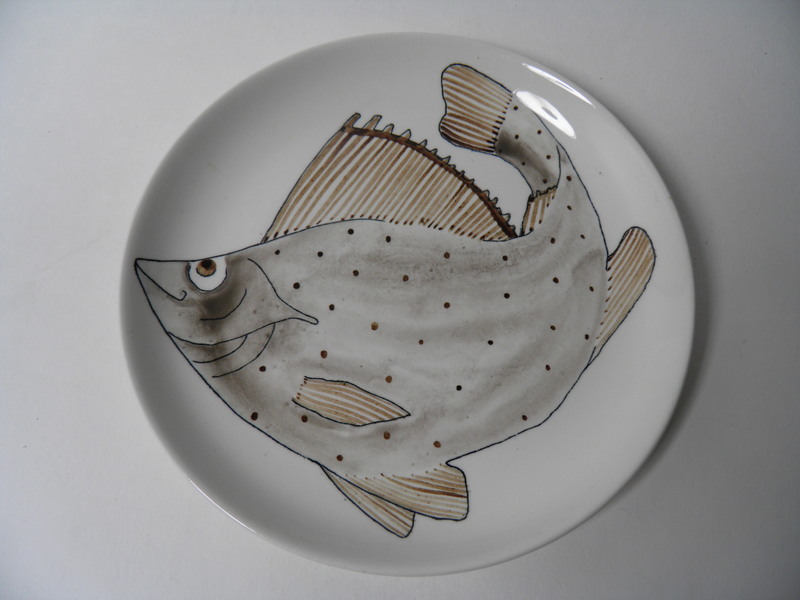 Handpainted plate with fish decoration, Arabia, Anja Juurikkala. 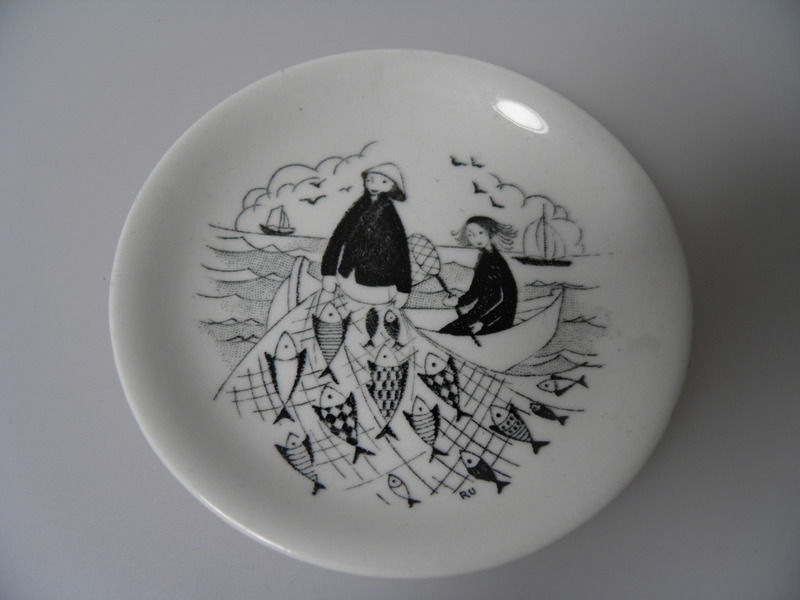 Small wall plate Fisherman, Arabia, Raija Uosikkinen. 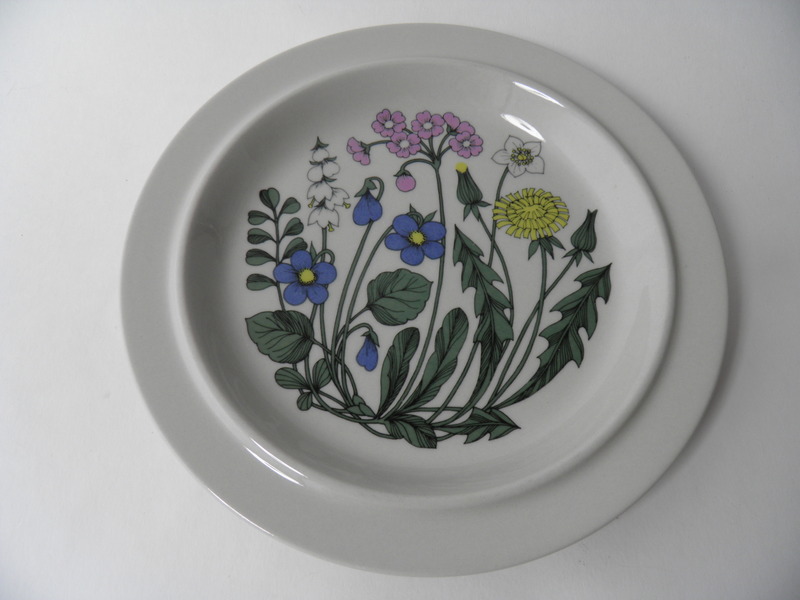 Mint Flora dinner plate by Arabia. Decoration by Esteri Tomula. In production 1979-1981. 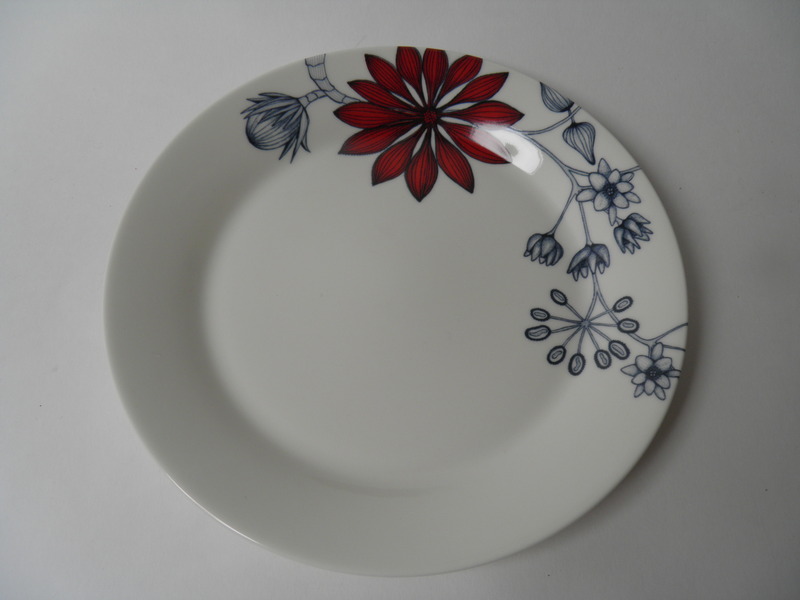 Dinner plate by Flora -series, Arabia, decoration Esteri Tomula. 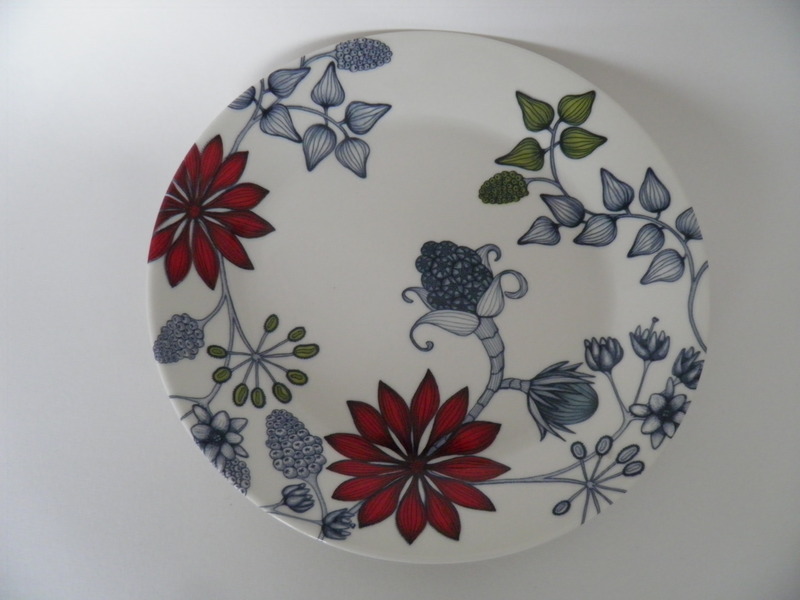 Side plate by Flora -series, Arabia, Esteri Tomula. 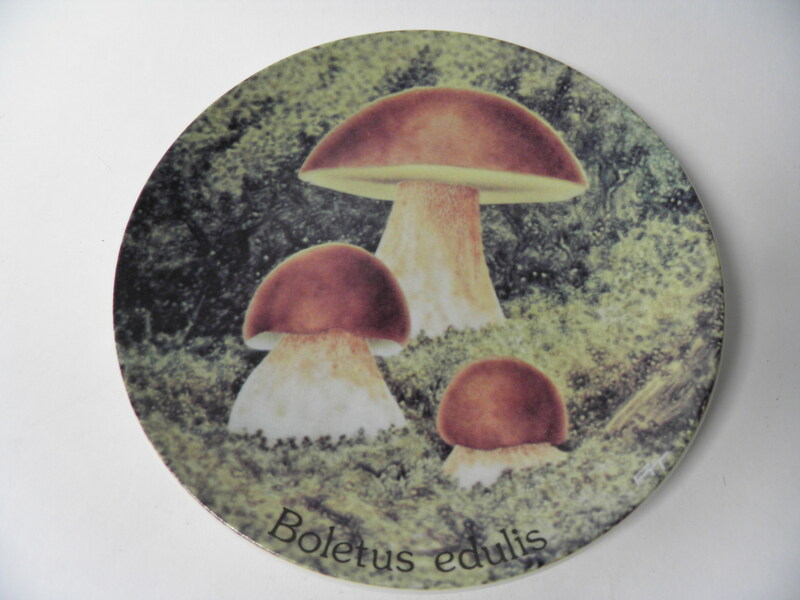 Flora plate, Arabia 1979-1981, Esteri Tomula. 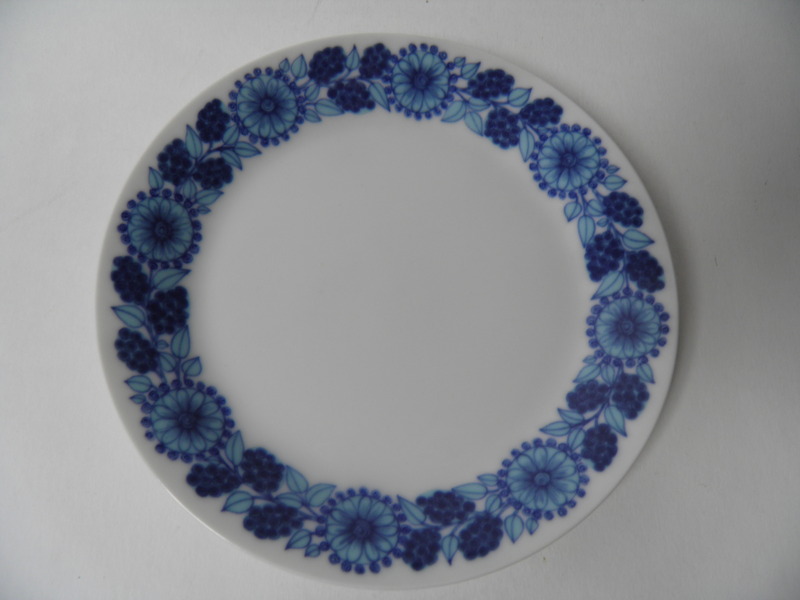 Mint cake plate Flora by Arabia. Designed by Esteri Tomula. 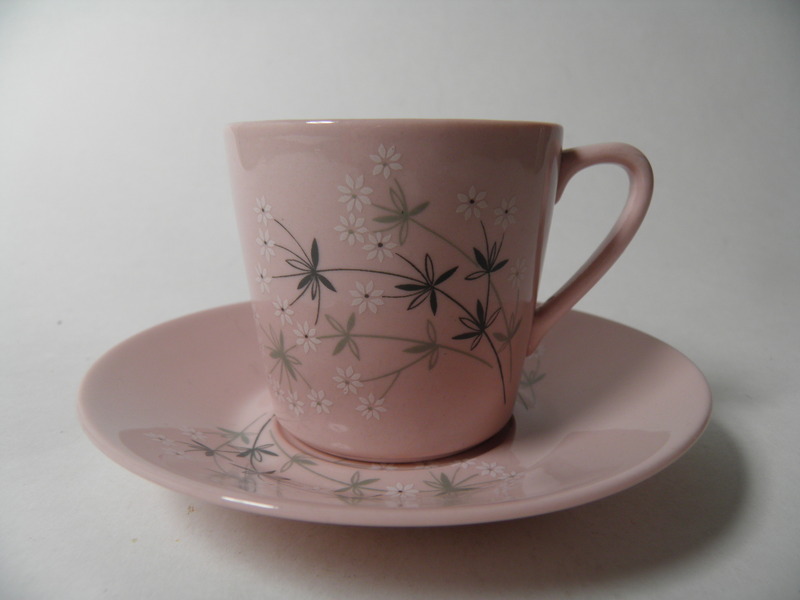 Flora tea cup and saucer, Arabia, Esteri Tomula. 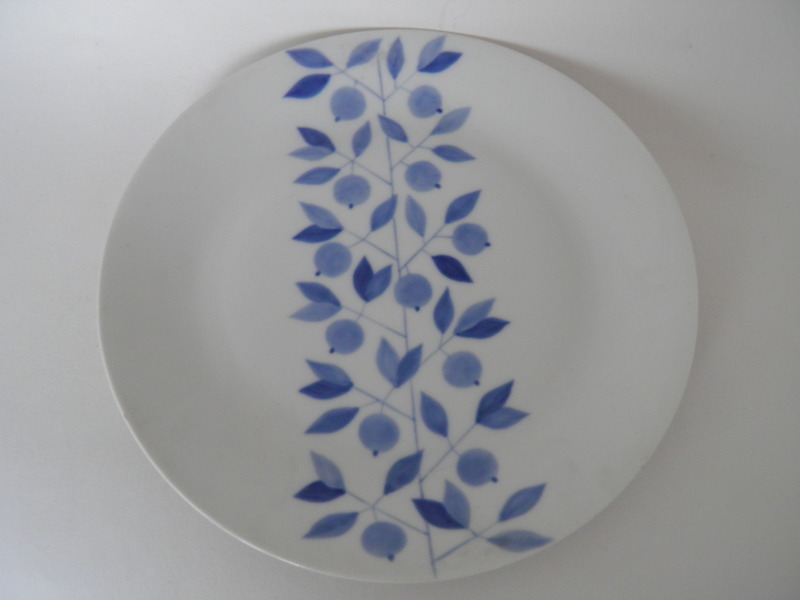 Blue plate by handpainted Fructus -series, Arabia, Gunvor Olin-Grönqvist. 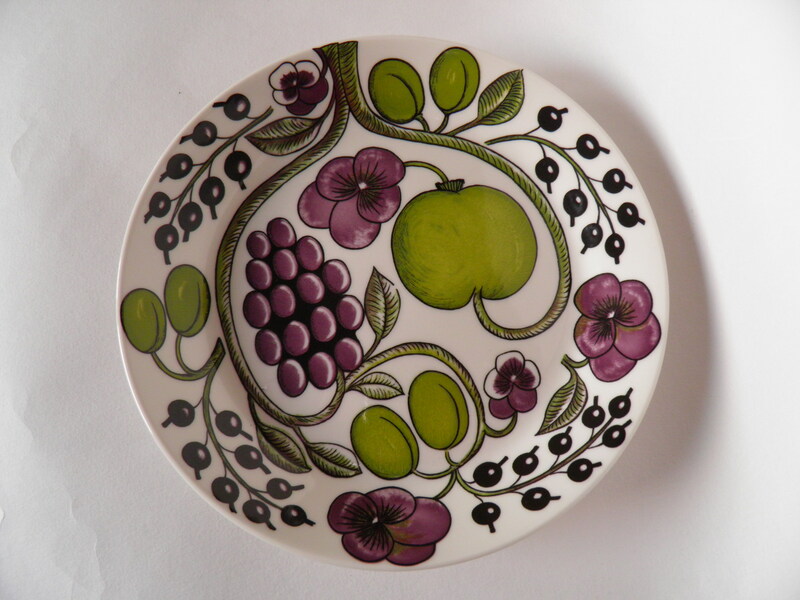 Mint, hand painted plate, Fructus, by Arabia. 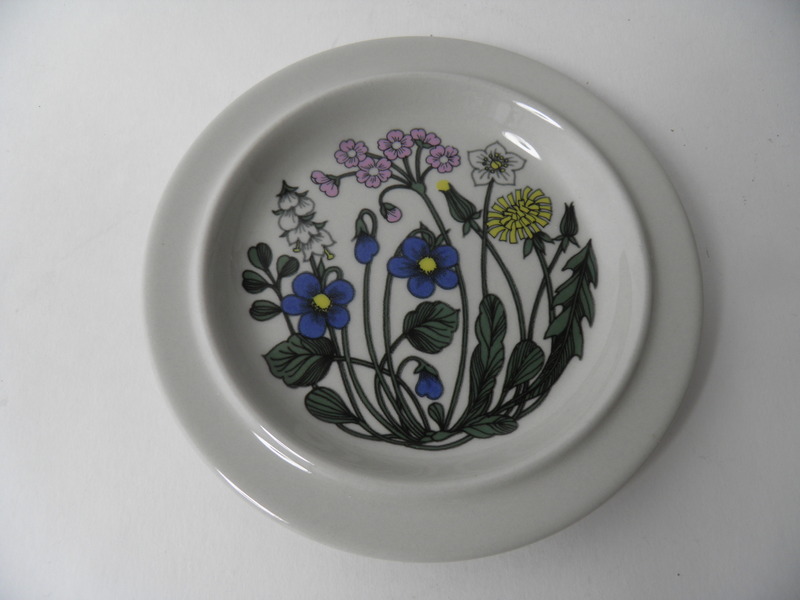 Designed by Gunvor Olin-Grönqvist. 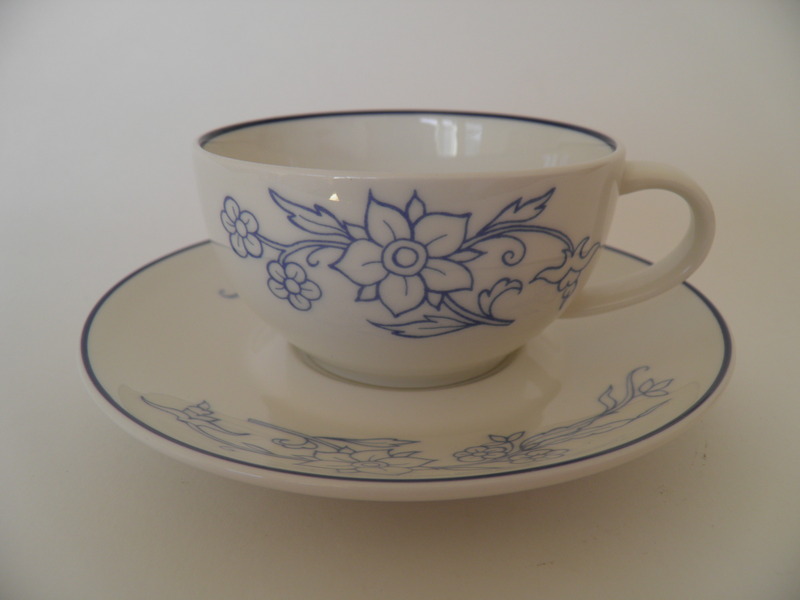 Blue coffee cup & saucer by Gardenia -series, Arabia, decoration Esteri Tomula. 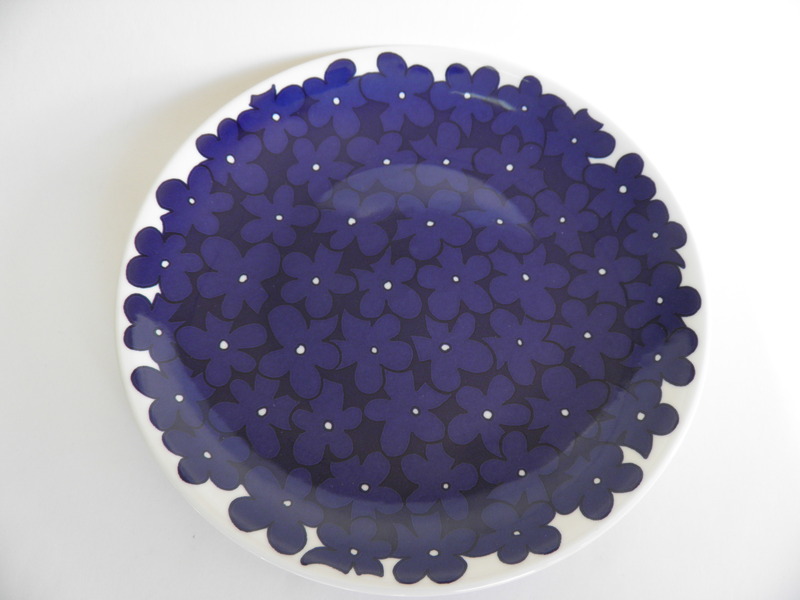 Deep plate Hallamarja by Runo -series, Arabia 2010-2011, Heini Riitahuhta. Coffee cup & saucer by Carneval Harlekin -series, Arabia, Inkeri Leivo. Harlekin Carneval tea cup & saucer, Arabia, Inkeri Leivo. 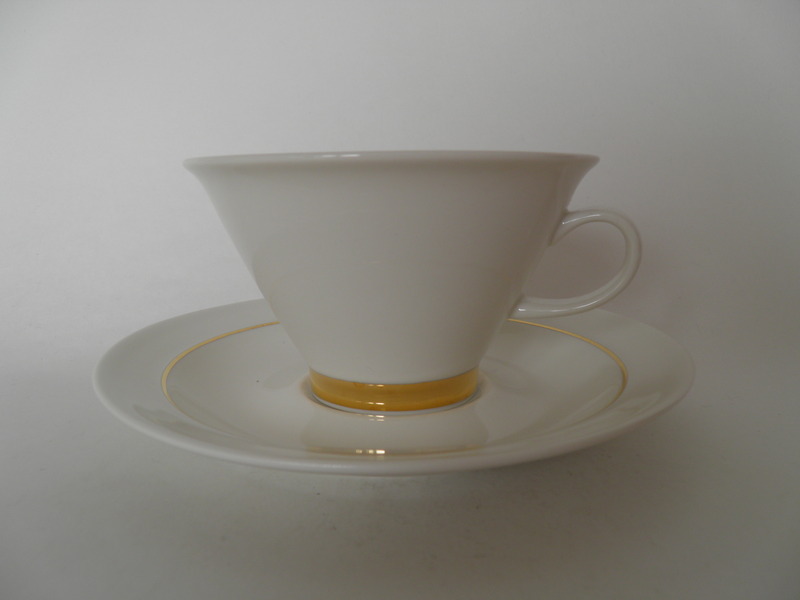 Mint Harlekin Gold coffee cup with saucer by Arabia. Designer Inkeri Leivo. 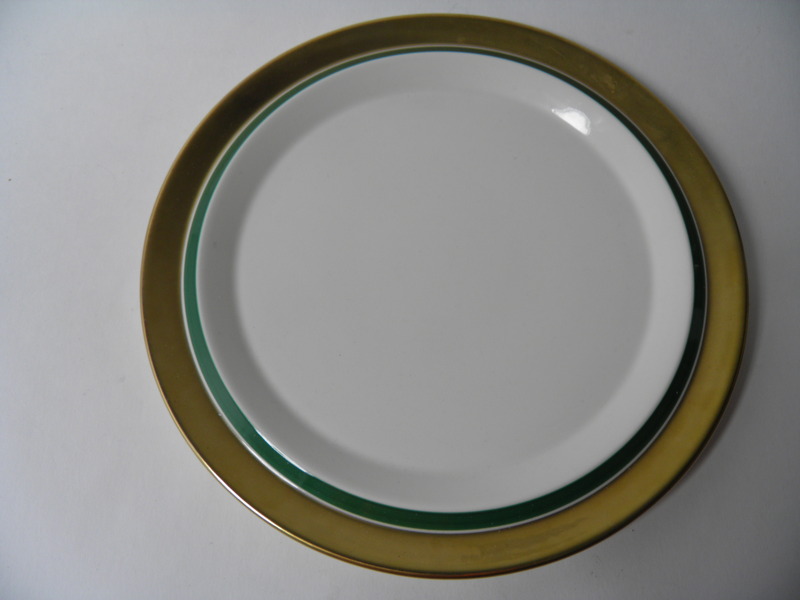 Mint dinner plate by Harlekin Gold -series, Arabia. Designed by Inkeri Leivo. 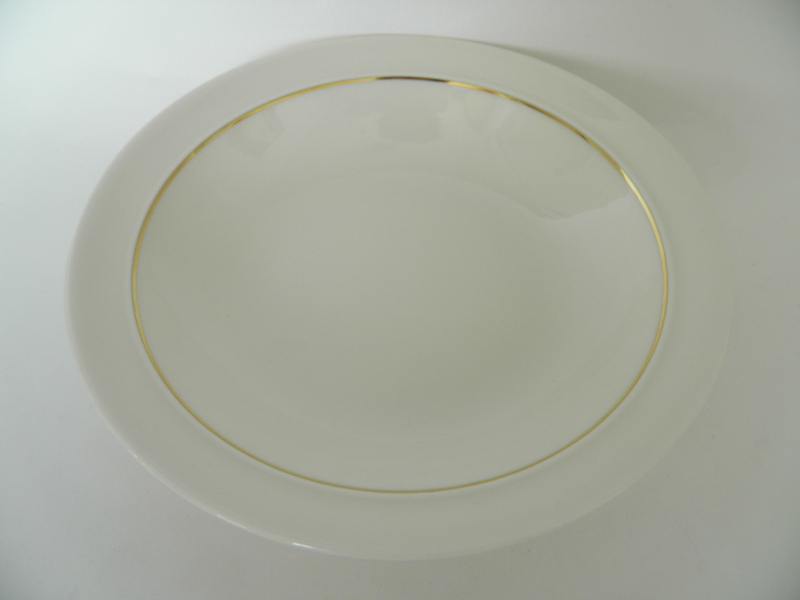 Mint small plate by Harlekin Gold -series, Arabia. Designed by Inkeri Leivo. 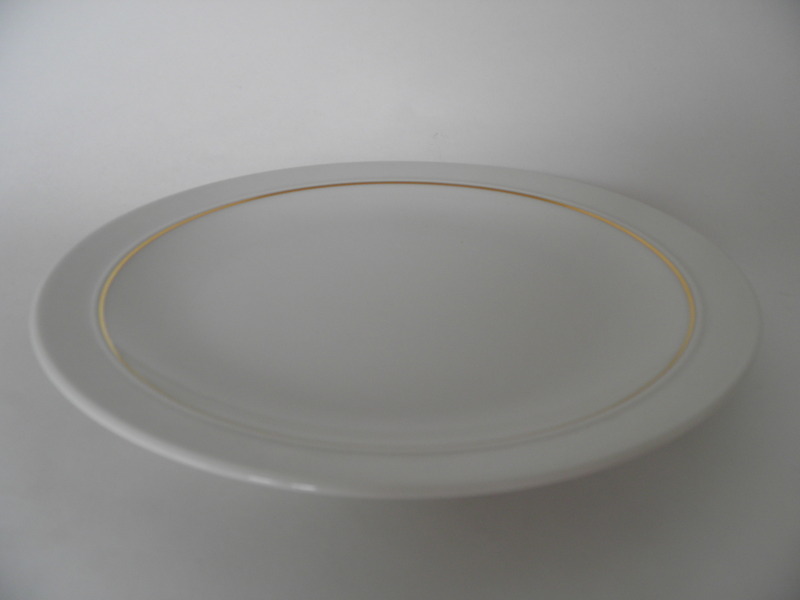 Mint soup plate by Harlekin Gold -series, Arabia. Designed by Inkeri Leivo. 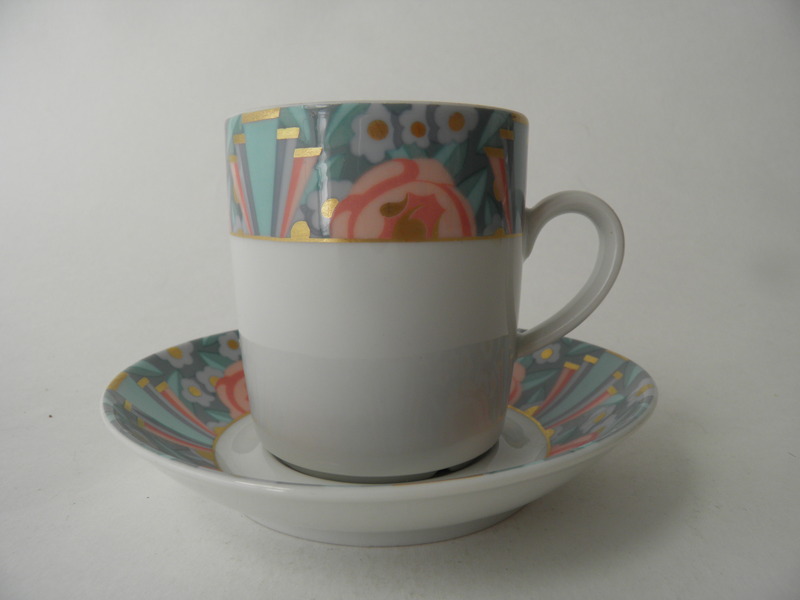 Mint teacup and saucer by Harlekin Gold -series, Arabia. Designed by Inkeri Leivo. 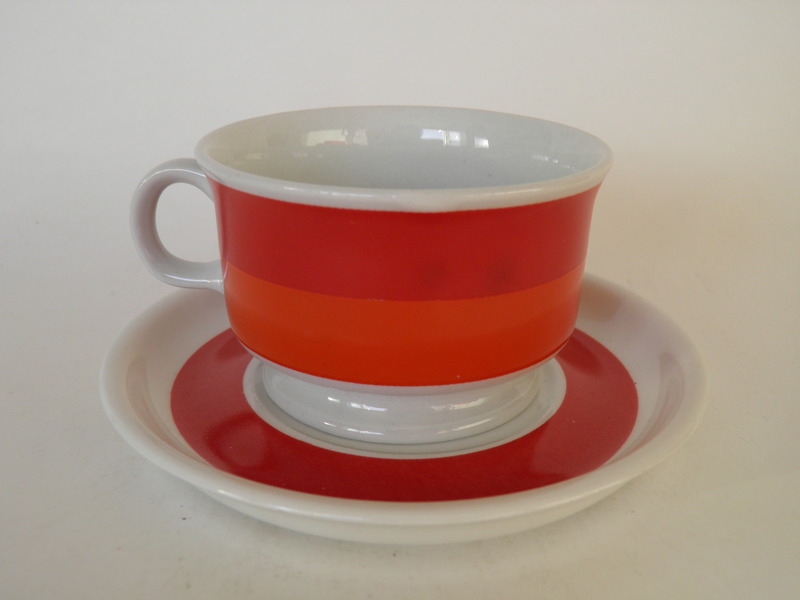 Coffee cup & saucer by Harlekin Red hat -series, Arabia, Inkeri Leivo. 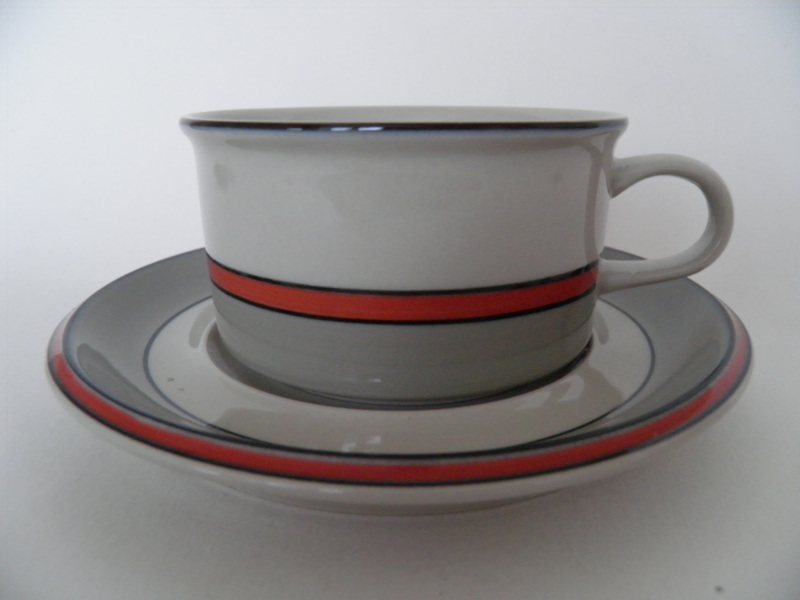 Mint Harlekin Red Hat tea cup and a saucer by Arabia. Designed by Inkeri Leivo. 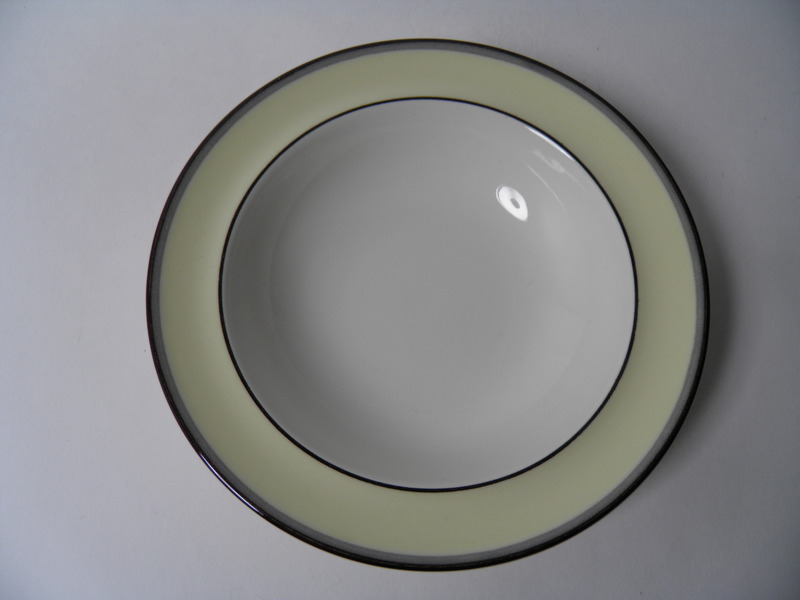 White soup plate by Harlekin -series, Arabia. Good condition. Tea cup and two plates by Harlekin Turquoise -series, Arabia, Inkeri Leivo. 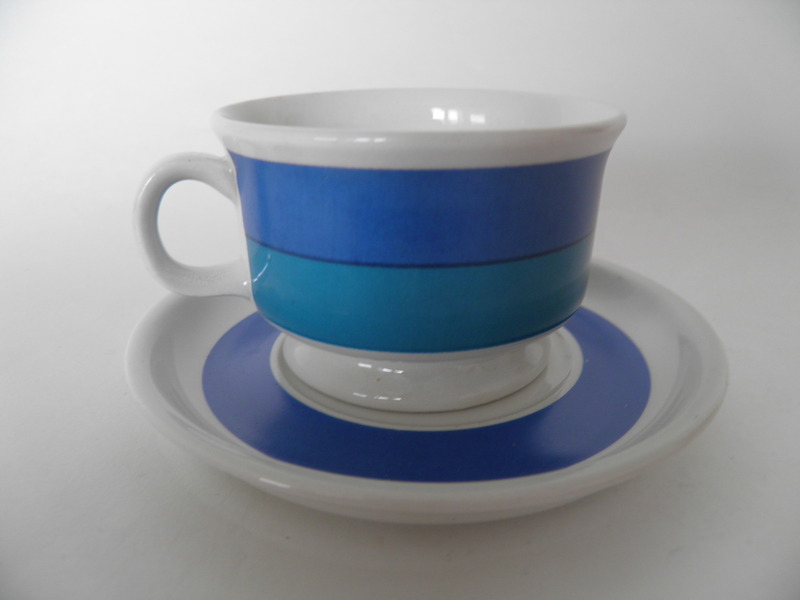 Mint tea cup by Harlekin turquoise -series, Arabia. Designed by Inkeri Leivo. 140 years jubileum plate, Arabia,Johanna Kunelius. 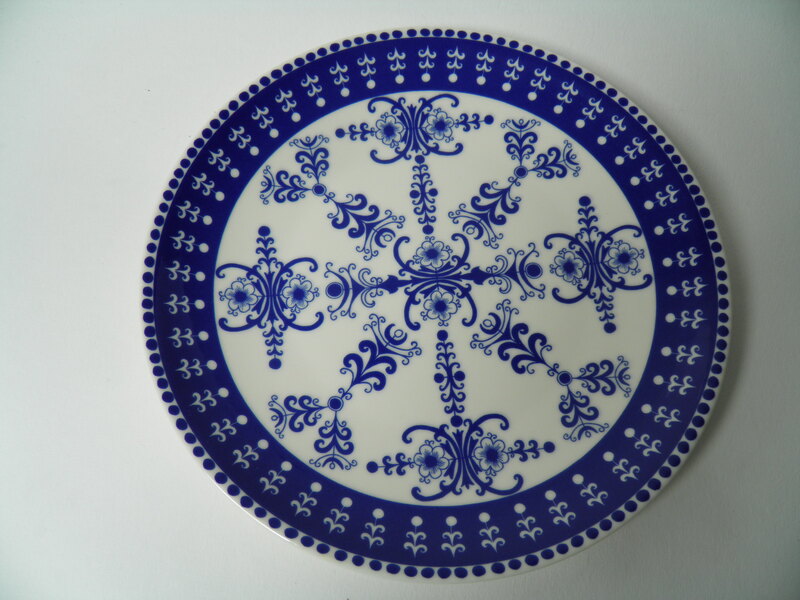 140 years jubileum plate, Arabia 2013, Johanna Kunelius. 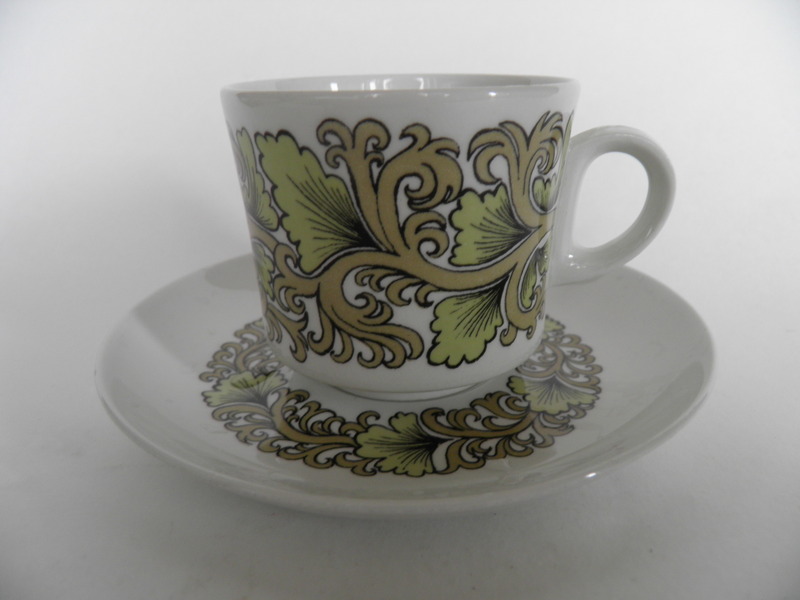 Green decorated coffee cup & saucer by Hermes -series, Arabia, Raija Uosikkinen. 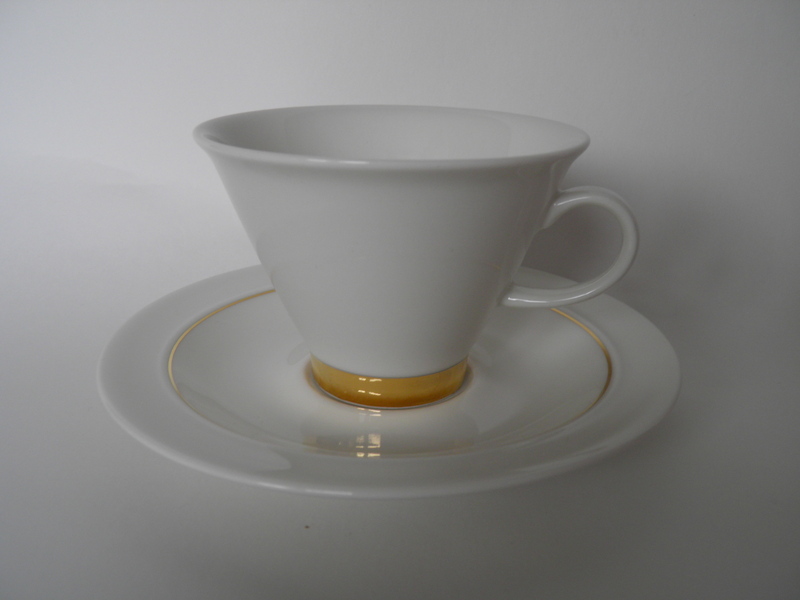 Lilac-gold mocha cup & saucer by Iiris -series, Arabia, Anja Jaatinen-Winquist. 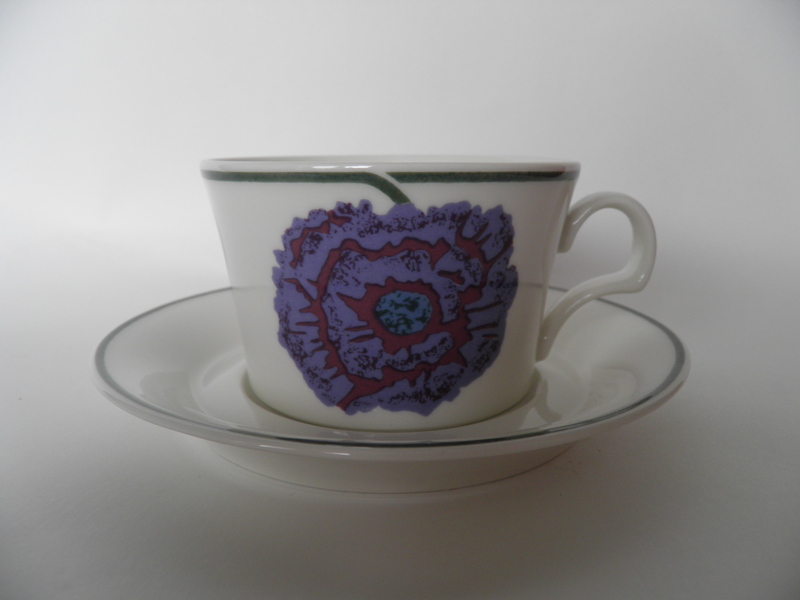 Mint dark lilac Illusia coffee cup and saucer by Arabia. Model by Heikki Orvola, decoration by Fujiwo Ishimoto. 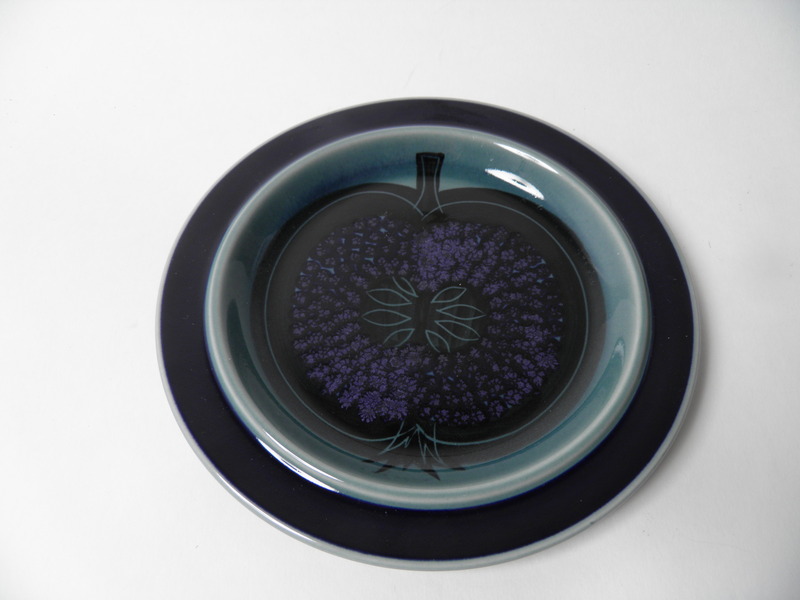 Mint, dark lilac Illusia soup plate by Arabia. Model by Heikki Orvola, decoration by Fujiwo Ishimoto. 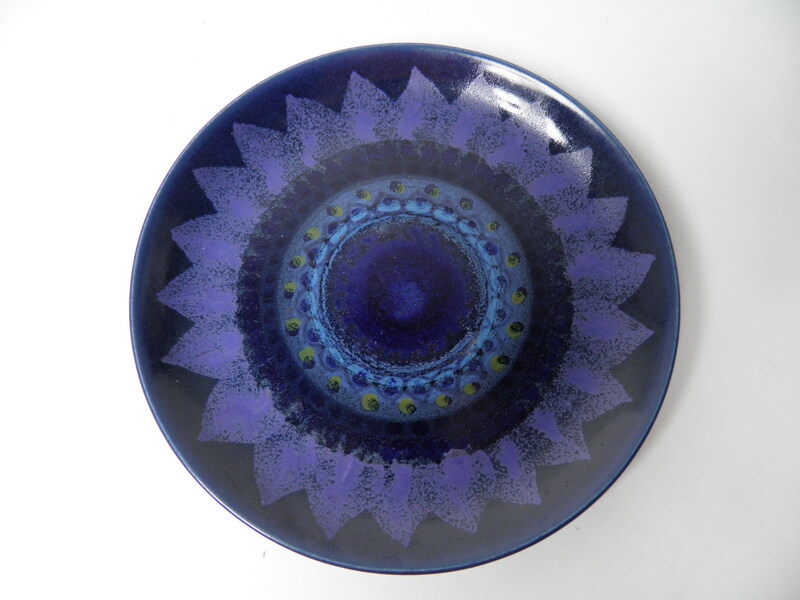 Mint, lilac dinner plate Illusia by Arabia. Model Heikki Orvola, decoration Fujiwo Ishimoto. 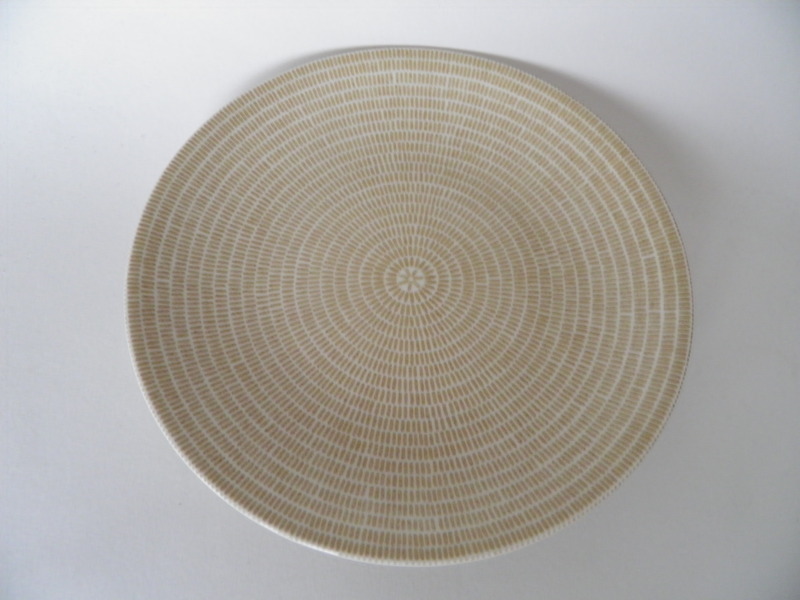 Lilac dinner plate by Illusia -series, Arabia, Heikki Orvola / Fujiwo Ishimoto. 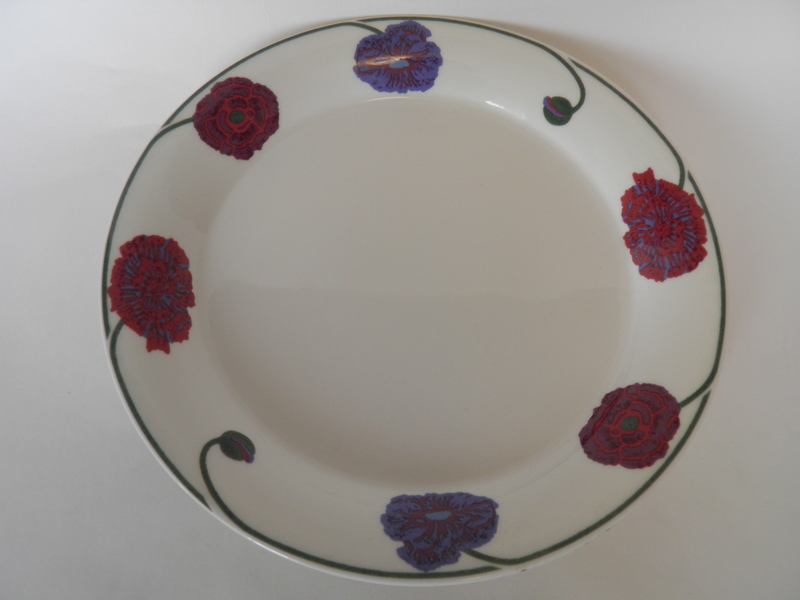 Rred dinner plate Illusia by Arabia. Model Heikki Orvola, decoration Fujiwo Ishimoto. 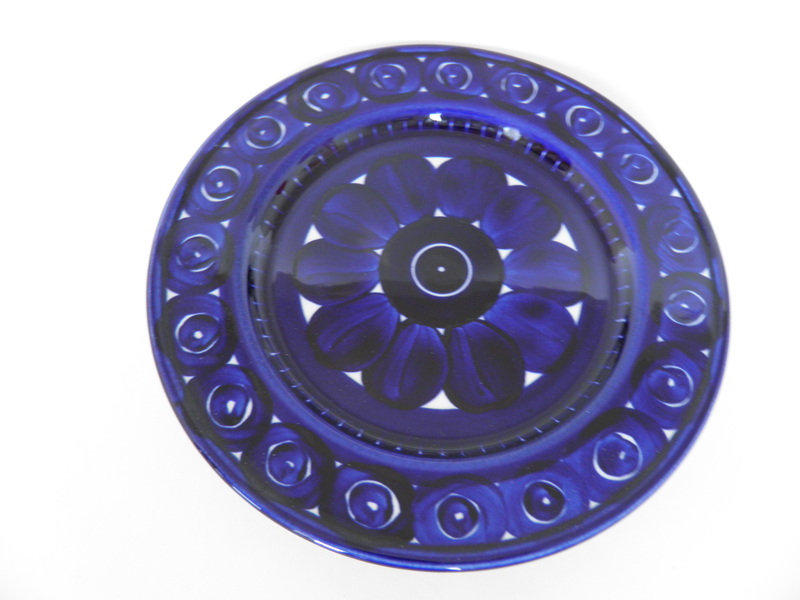 Small deep plate Illusia by Arabia. Model Heikki Orvola, decoration fujiwo Ishimoto. Good condition. 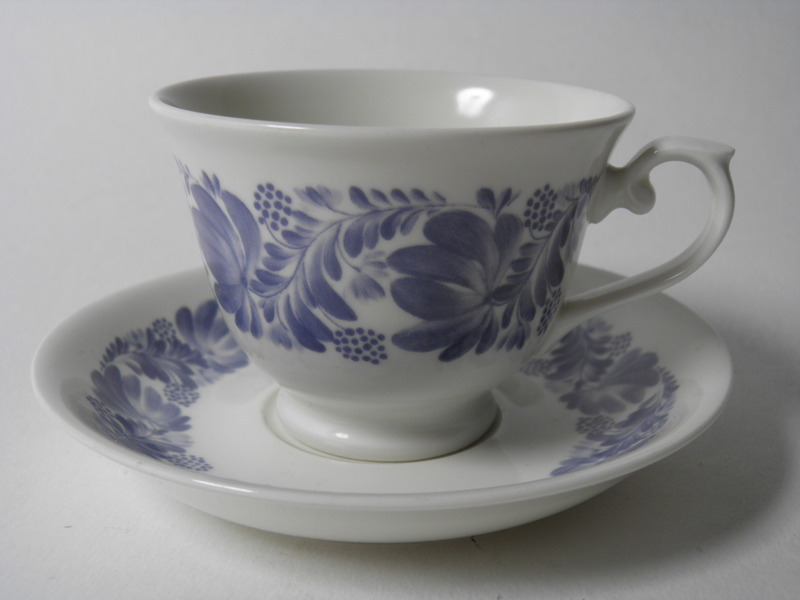 Mint, lilac Illusia tea cup and saucer by Arabia. Model Heikki Orvola, decoration Fujiwo Ishimoto. 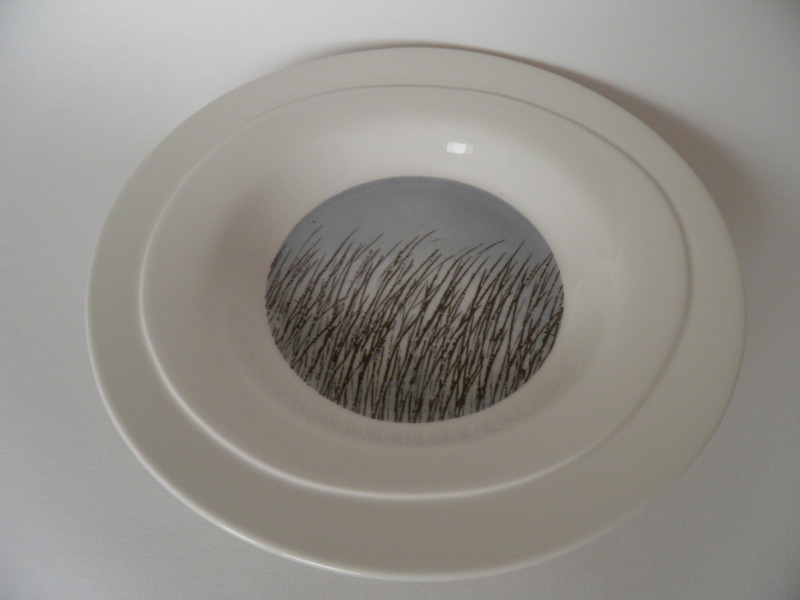 Sideplate by Johanna -series, Arabia, Raija Uosikkinen. 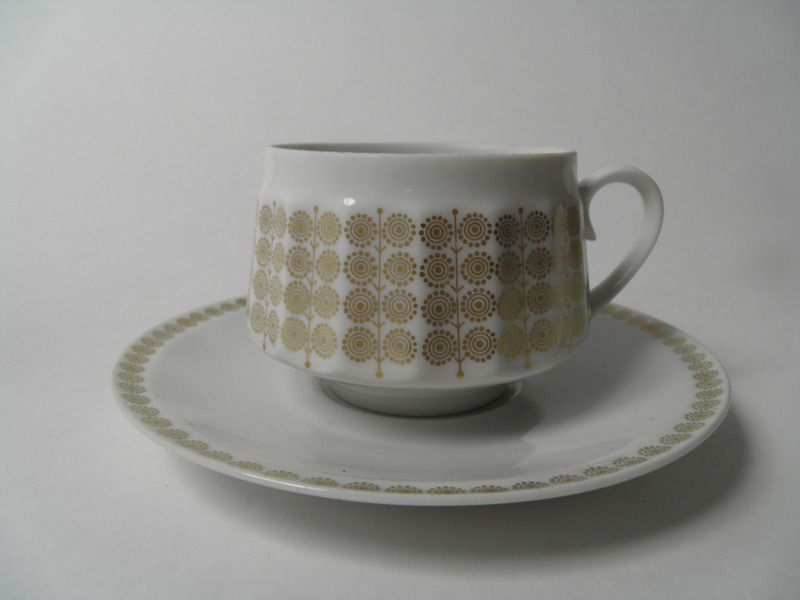 Coffee cup and saucer by Juhannus (Midsummer) -series, Arabia, decoration Raija Uosikkinen. 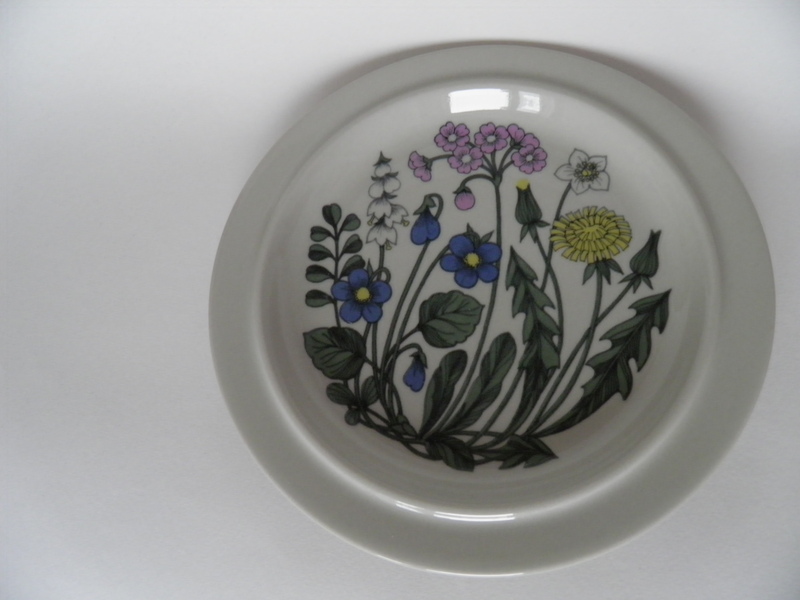 Kaisu plate by Arabia 1873-2013 jubileum serie, design Johanna Kunelius. 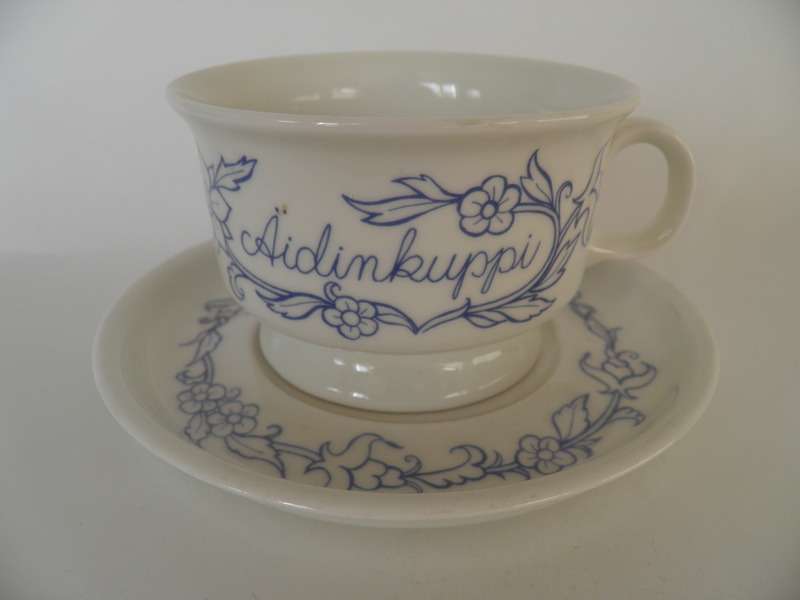 Kalevala cup & saucer, Arabia atelje, decoration Anja Jaatinen-Winquist. 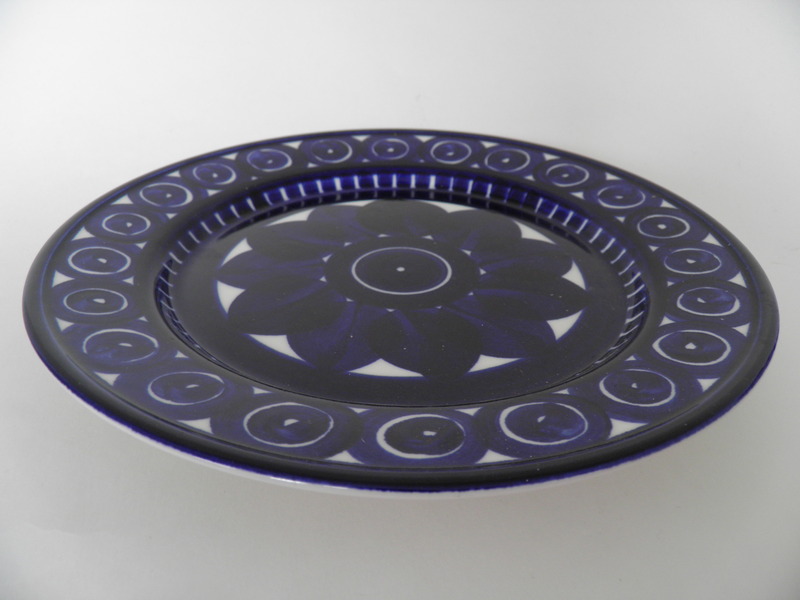 Deep plate by Kartano -series, Arabia, Esteri Tomula. 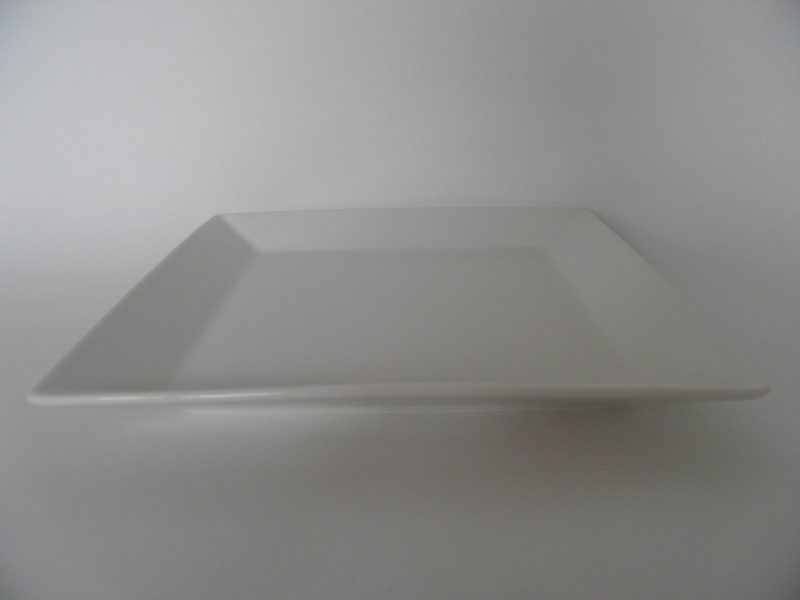 Small deep plate by Kartano -series, Arabia, decoration Esteri Tomula. 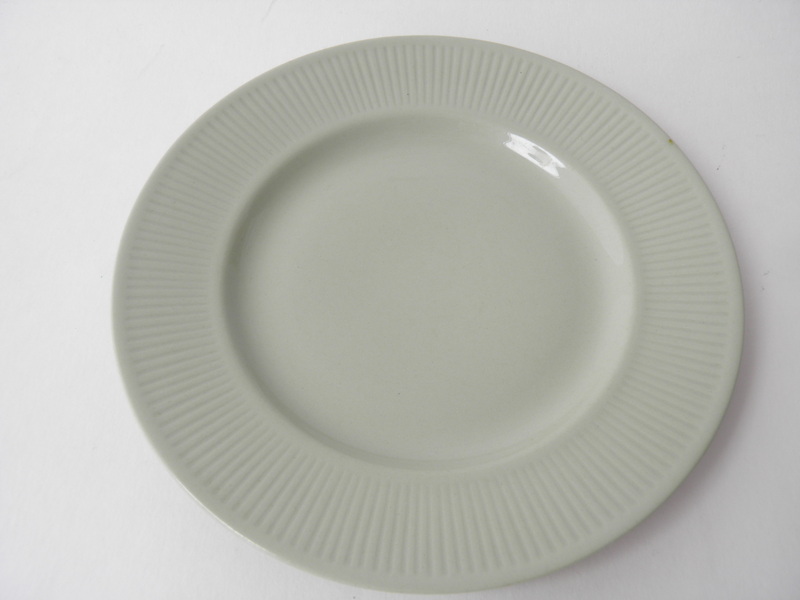 Kartano dinner plate, Arabia, Esteri Tomula. 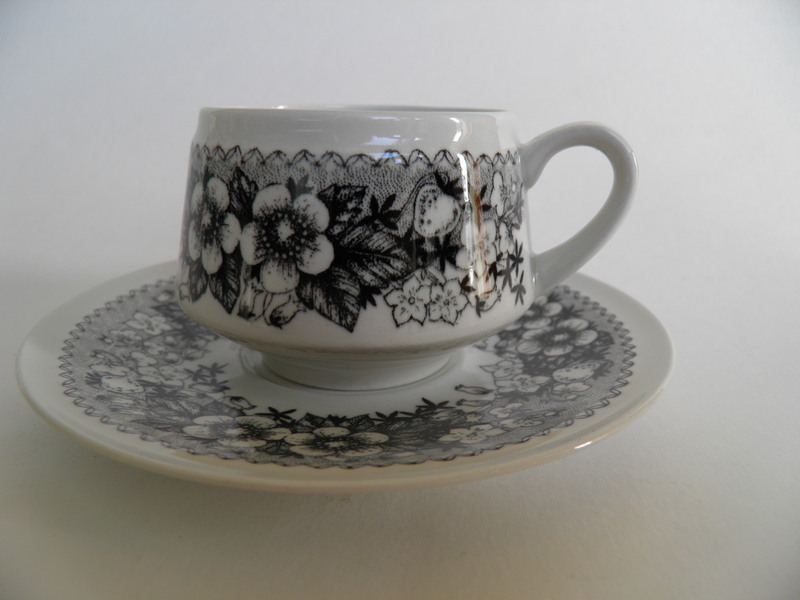 Small cup & saucer by Katrilli -series, Arabia, model Ulla Procopé, decoration Esteri Tomula. Katrilli deep plate, Arabia, Esteri Tomula. 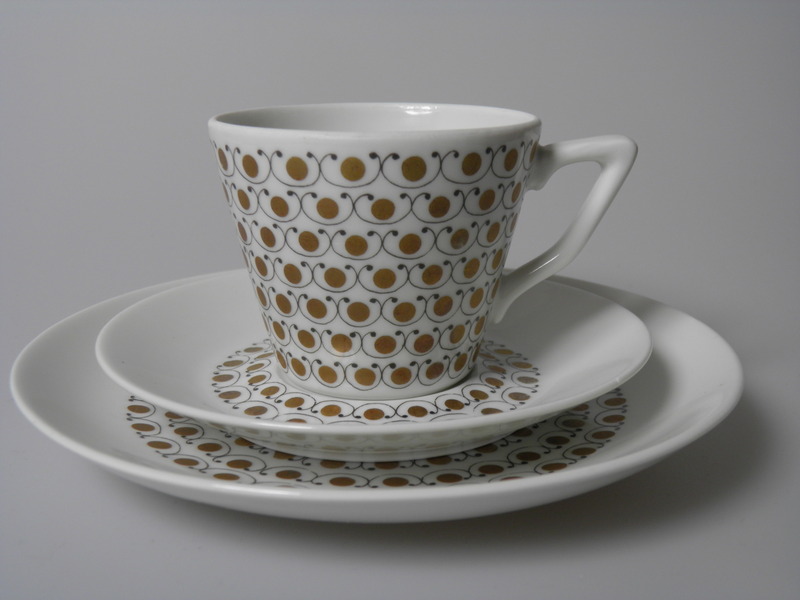 Kide coffee cup & saucer & sideplate, Arabia, decoration Raija Uosikkinen. 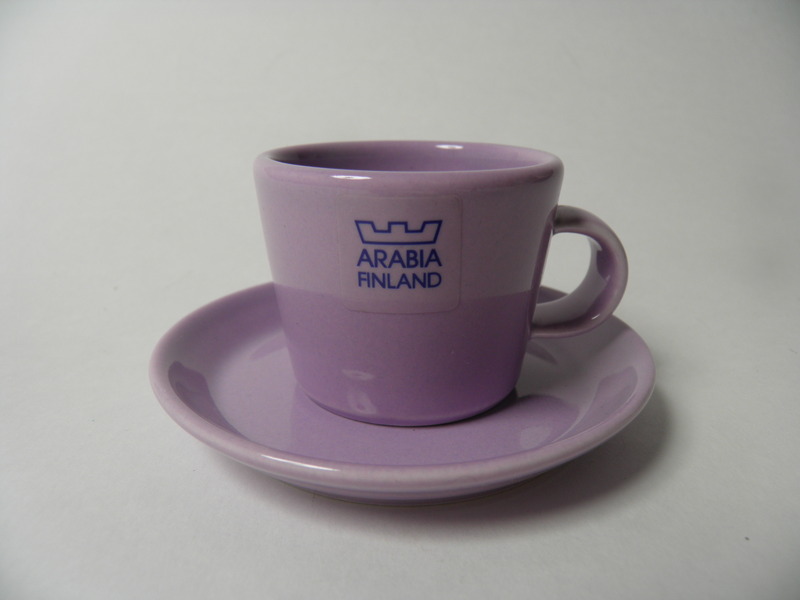 Lilac espresso cup & saucer by KoKo -series, Arabia, Kristina Riska and Kati Tuominen-Niittylä. 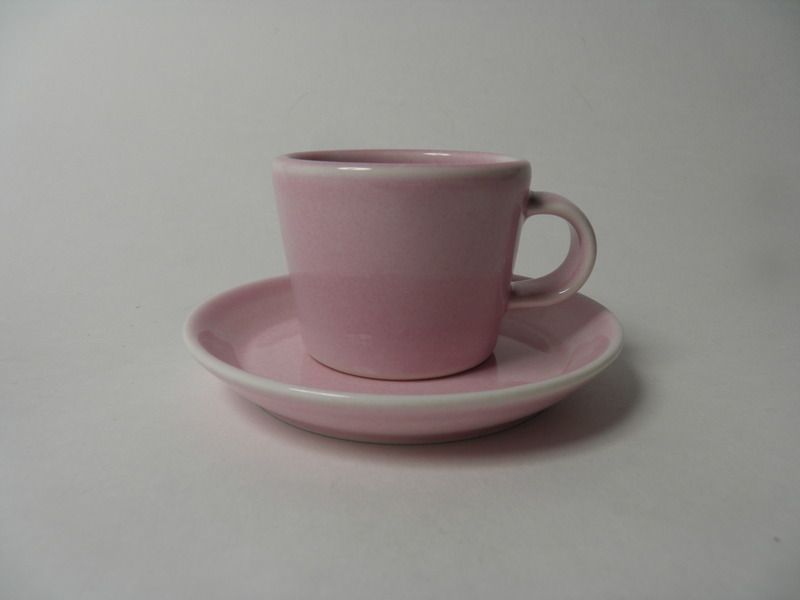 Pink espresso cup & saucer by KoKo -series, Arabia, Kristina Riska ja Kati Tuominen-Niittylä. 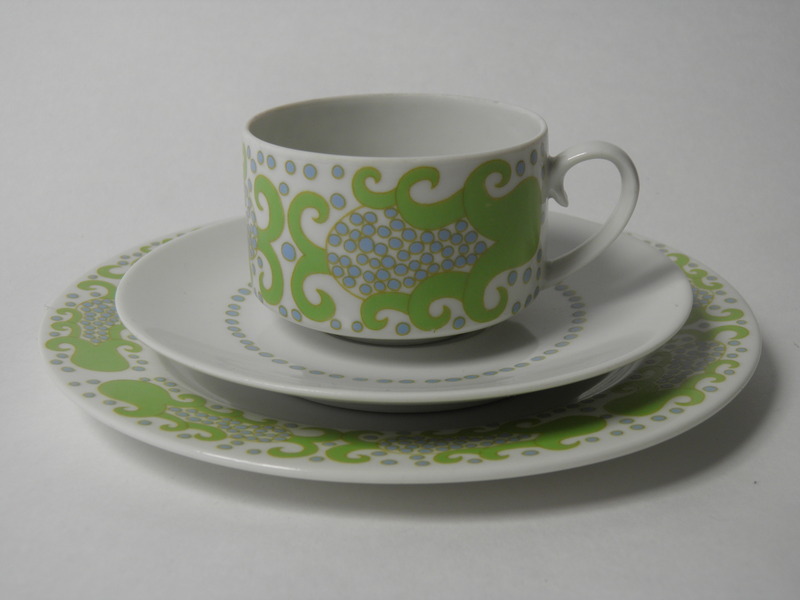 Mint KoKo XS piccolo cup and saucer by Arabia. Designed by Kristina Riska ja Kati Tuominen-Niittylä. 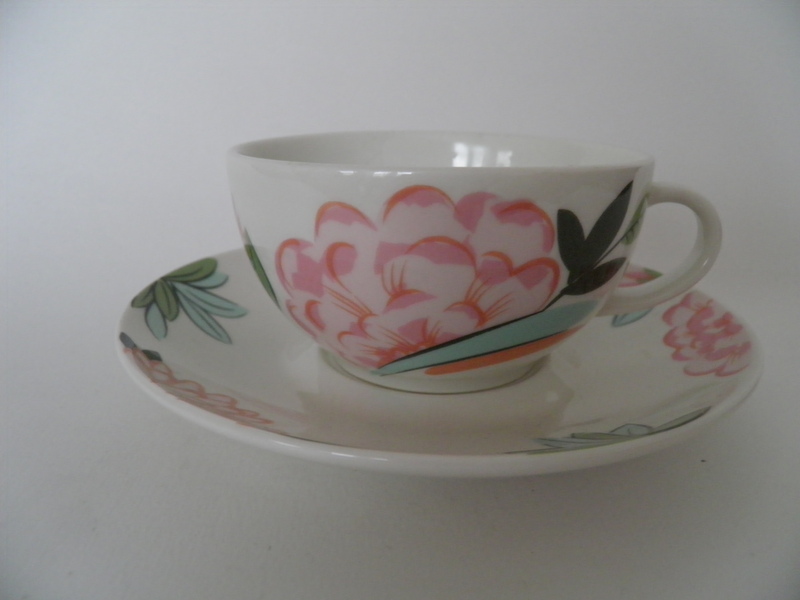 Mint KoKo Orange Roses piccolo cup and saucer by Arabia. Designed by Kristina Riska ja Kati Tuominen-Niittylä. 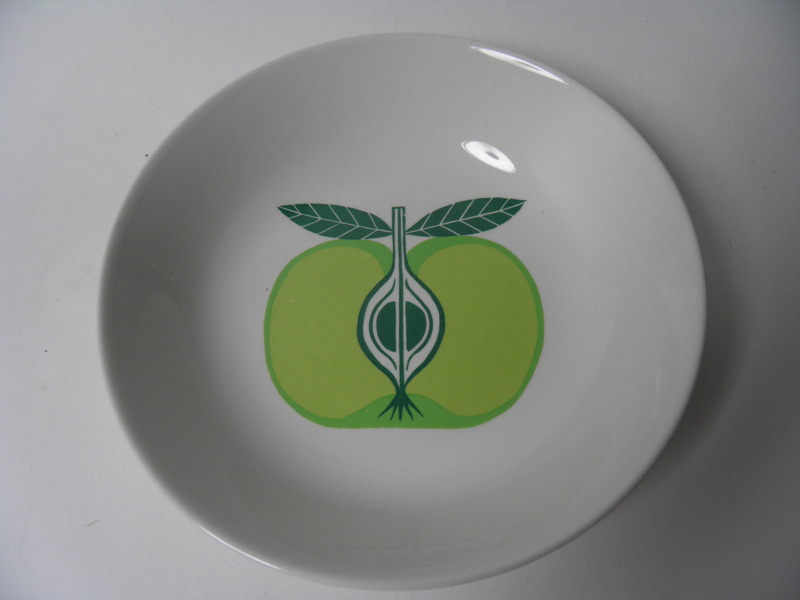 Mint Kosmos soup plate by Arabia. Designed by Gunvor Olin-Grönqvist. 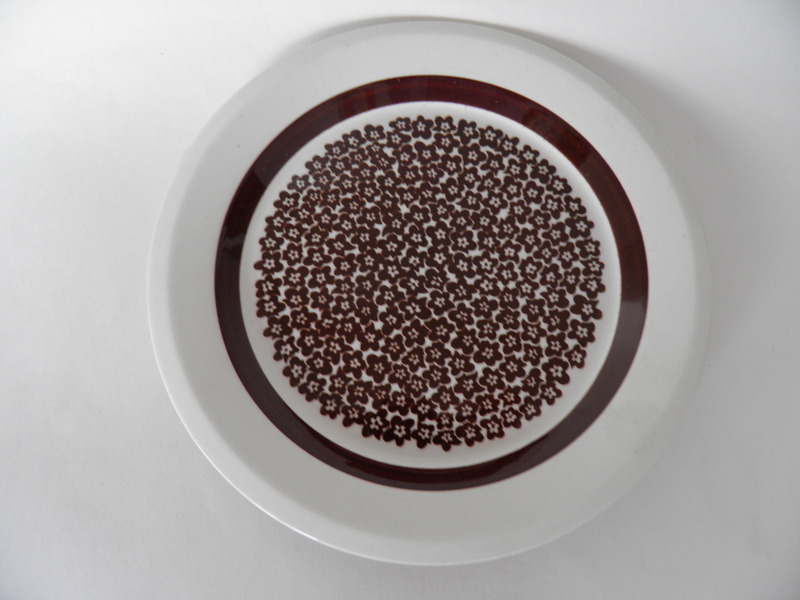 Brown Kosmos dinner plate by Arabia. 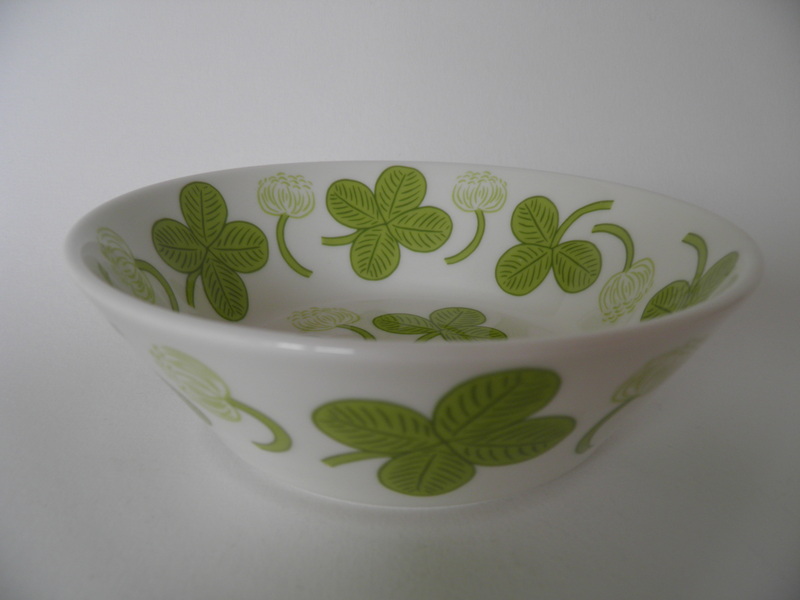 Designed by Gunvor Olin-Grönqvist. Good condition. 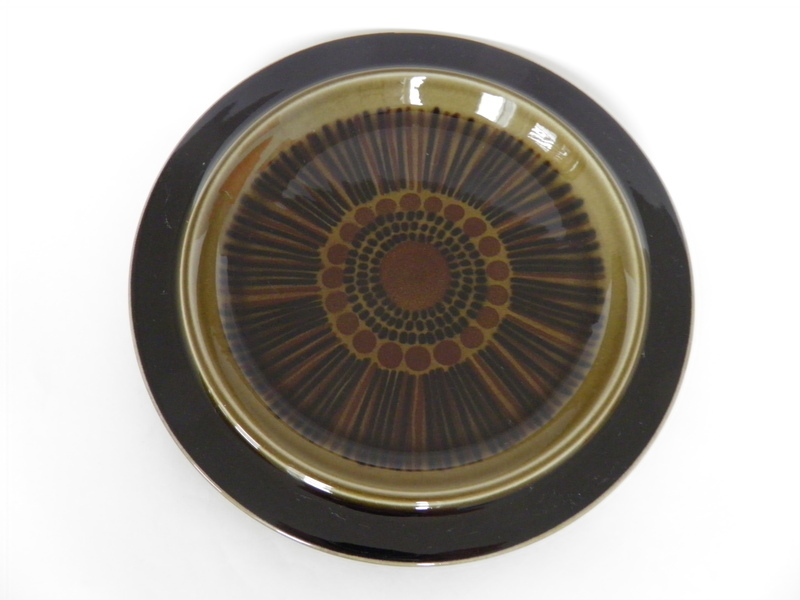 Brown Kosmos sideplate by Arabia. 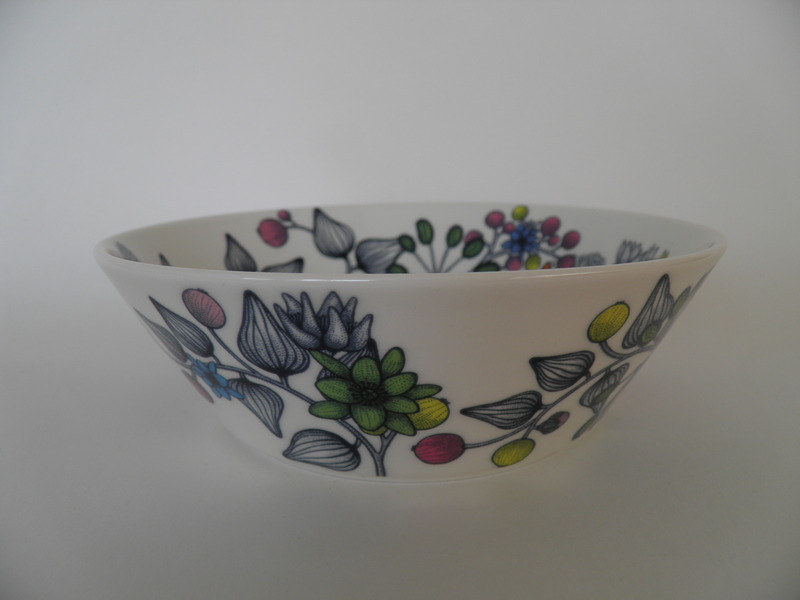 Designed by Gunvor Olin-Grönqvist. Goodcondition. 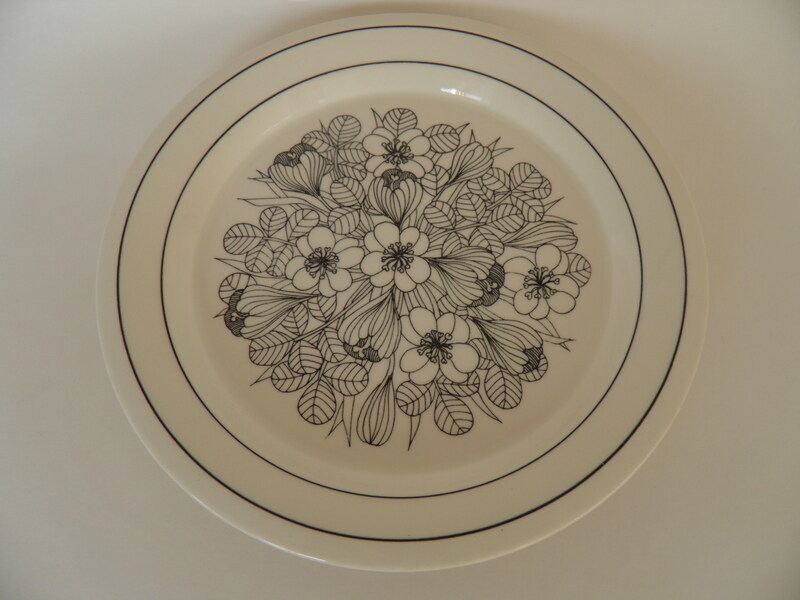 Black-white Krokus plate, Arabia, Esteri Tomula. 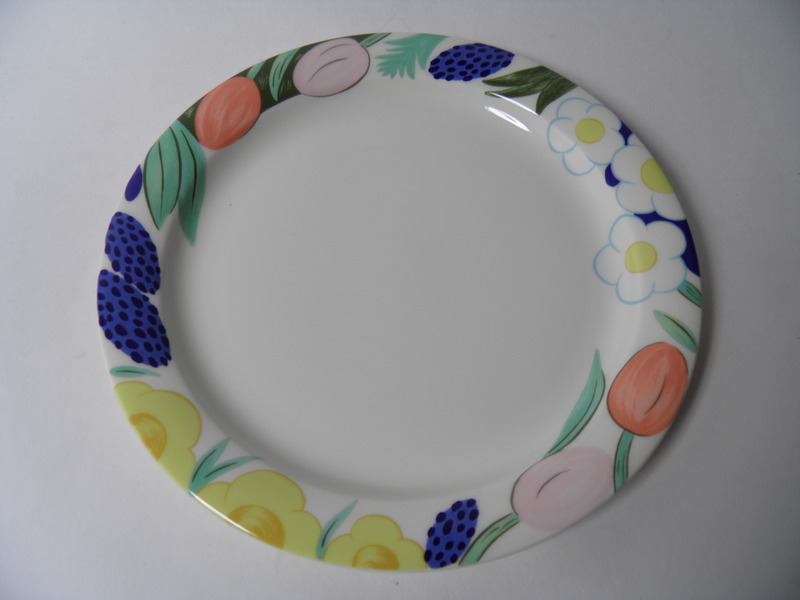 Handpainted plate Kuutamo, Arabia, Hilkka-Liisa Ahola. Uudenveroinen Arabian 140 v juhlalautanen Leena, design Johanna Kunelius. 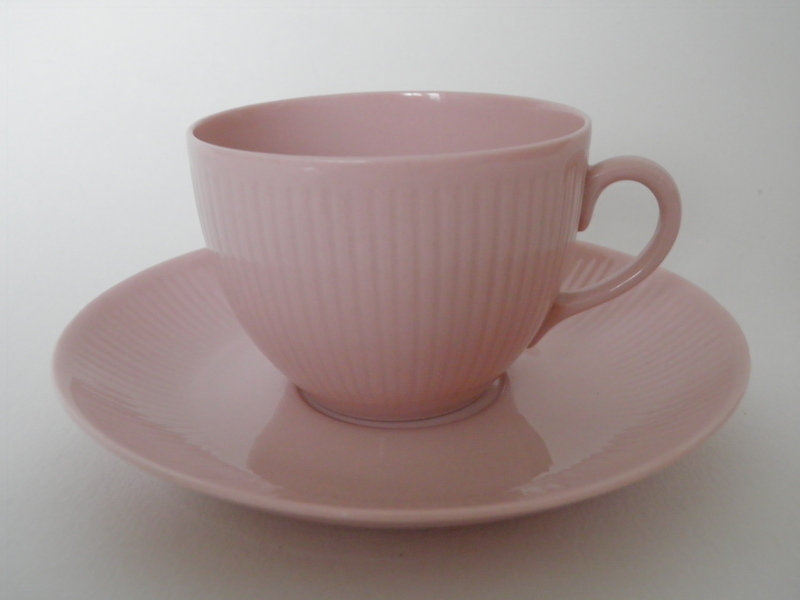 Pink coffee cup & saucer by Lumikukka (Snow flower) -series, Arabia, Raija Uosikkinen. 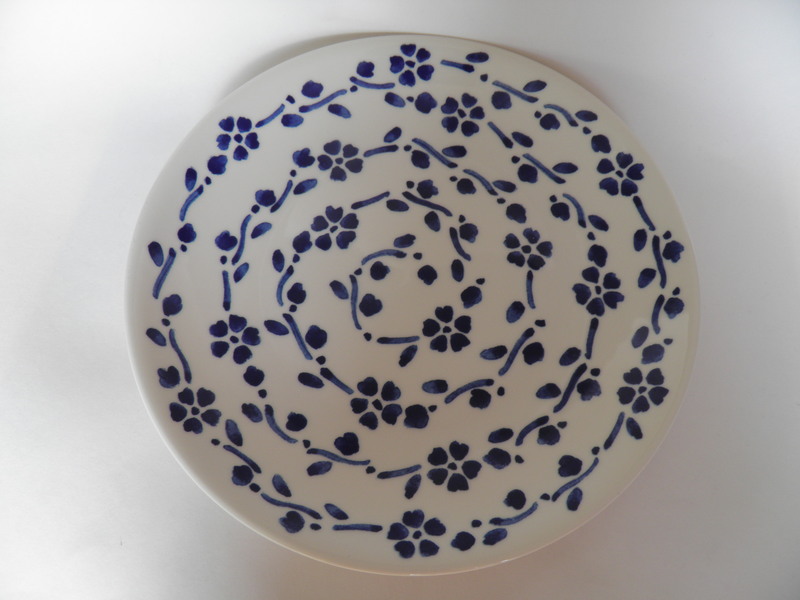 Serving plate by Lumikukka (Snow flower) -series, Arabia, Raija Uosikkinen. 140 years jubileum plate Maaria, Arabia, Johanna Kunelius. New, unused Arabia 140 years jubileum plate Maisa. 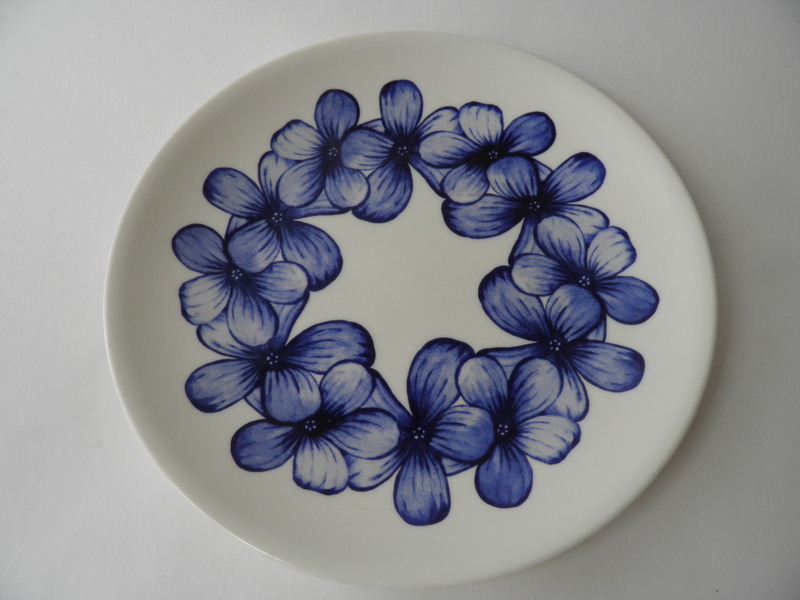 Designed by Johanna Kunelius. 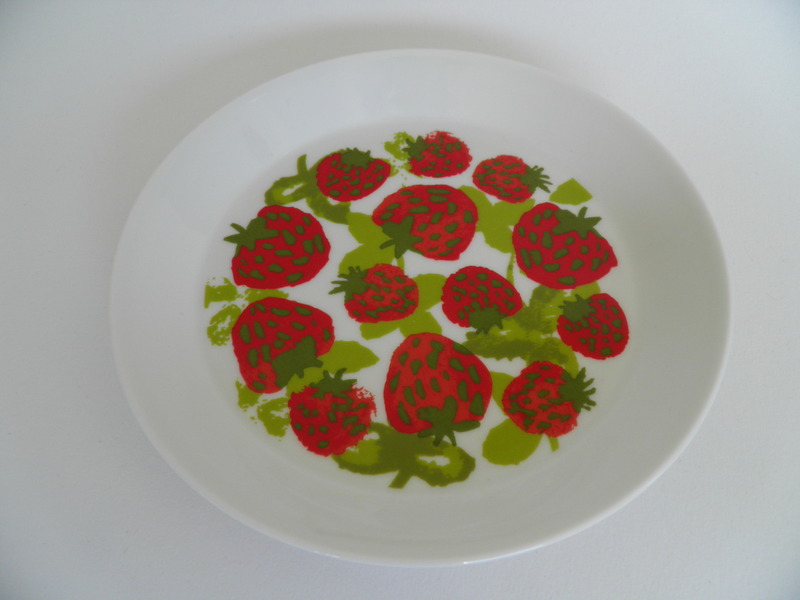 Mansikka -Strawberry- seasonal plate, Arabia. 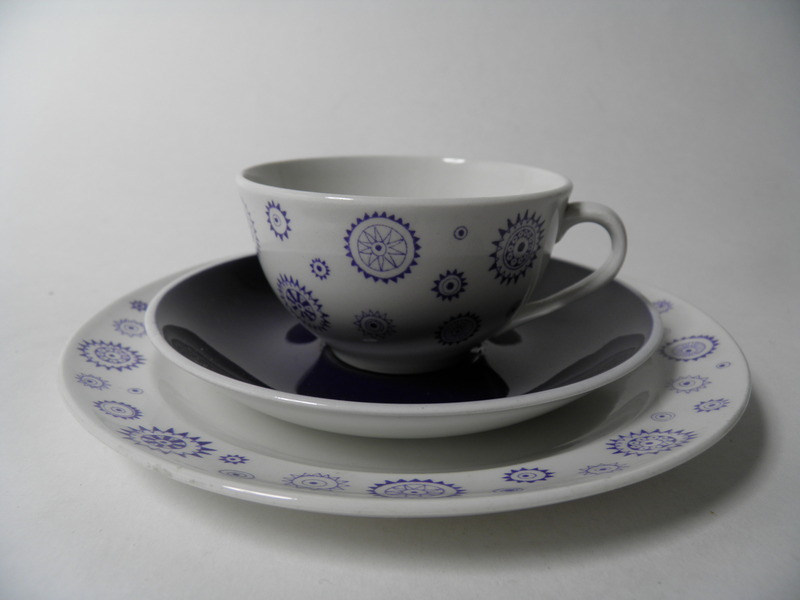 Coffee cup & saucer & sideplate by Marina -series, Arabia, Anja Jaatinen-Winquist. 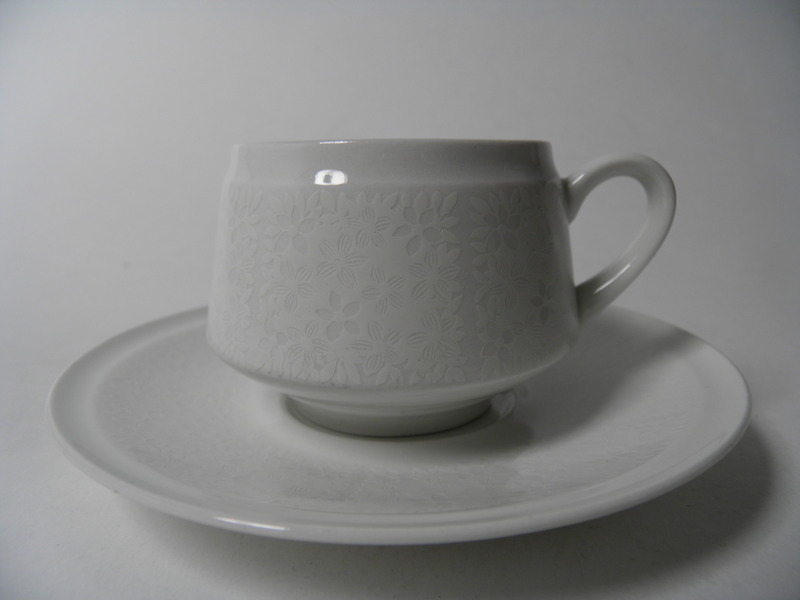 Coffee cup & saucer & sideplate by Mekka -series, Arabia, Esteri Tomula. 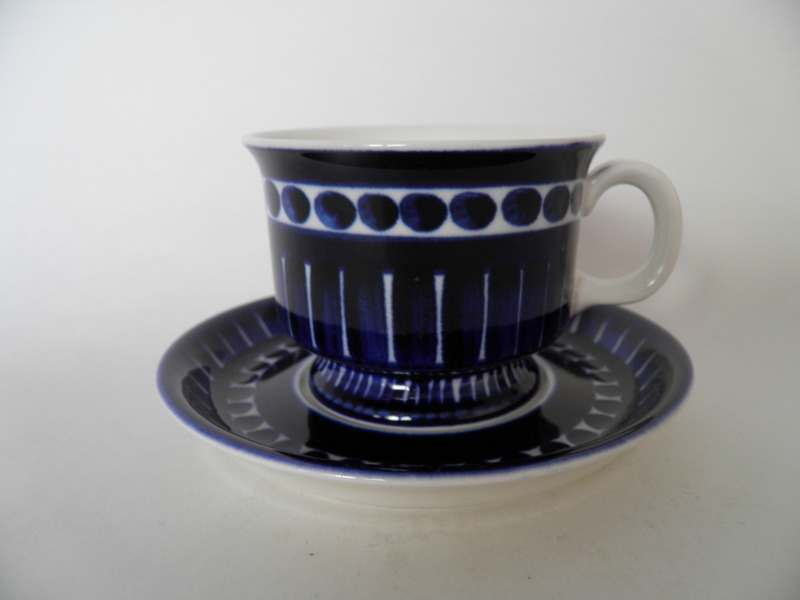 Merituuli coffee cup & saucer, Arabia, Heljä Liukko-Sundström. 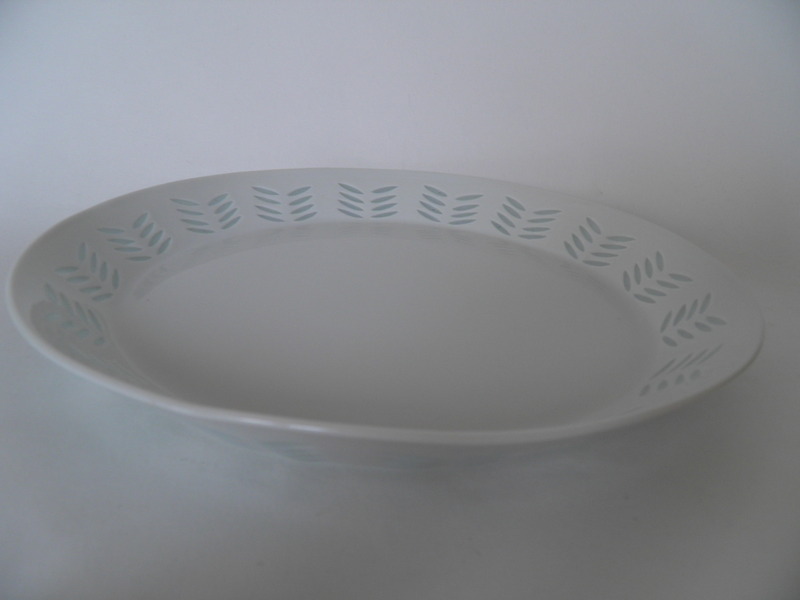 Merituuli soup plate, Arabia, Heljä Liukko-Sundström. Sideplate by Merituuli -series, Arabia, Heljä Liukko-Sundström. Merituuli sideplate, Arabia, Heljä Liukko-Sundström. 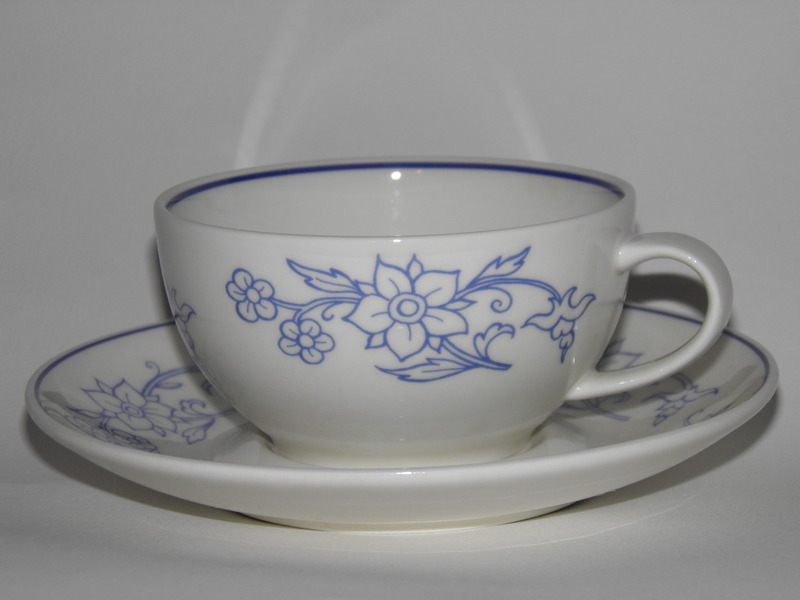 Merituuli tea cup & saucer, Arabia, Heljä Liukko-Sundström. 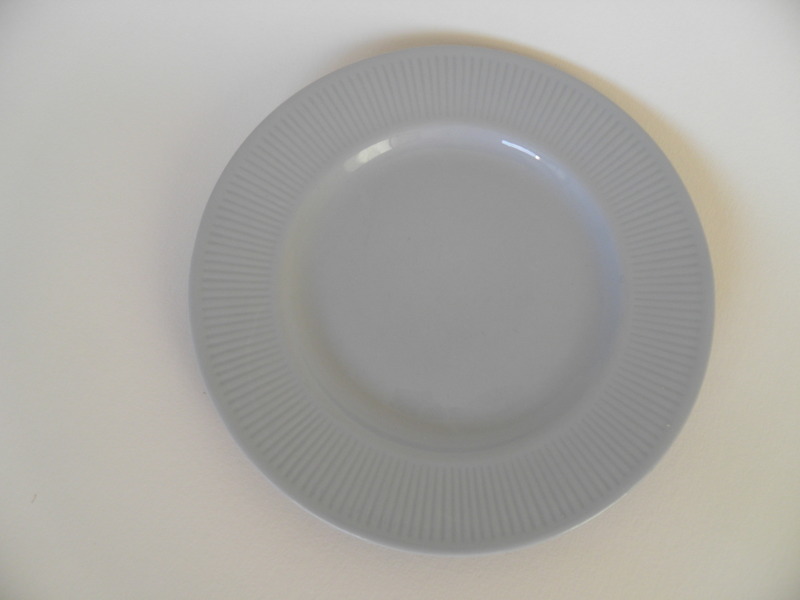 Brown serving plate by Miranda -series, Arabia. Blue Kitchen (Sininen Keittiö) mother's cup & Saucer, Arabia. 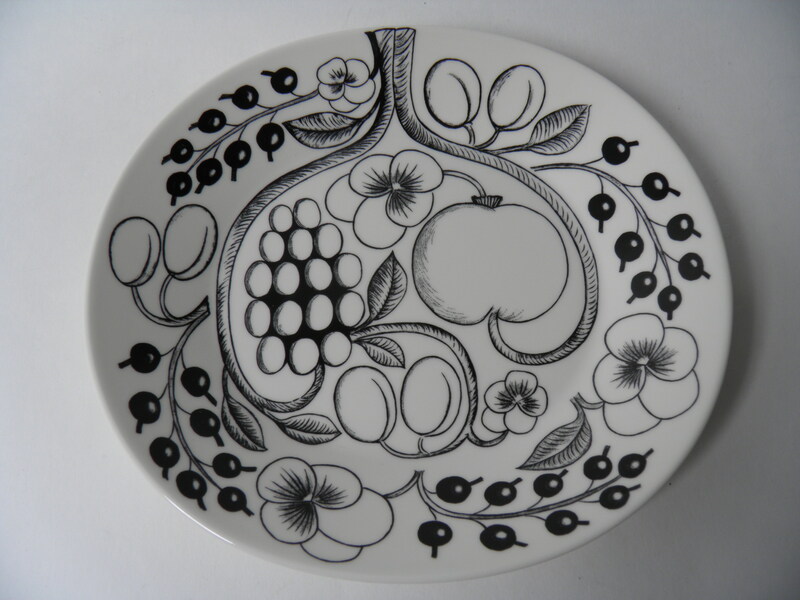 Musta Ruusu (Black Rose) dinner plate, Arabia 1967-1970, Esteri Tomula. 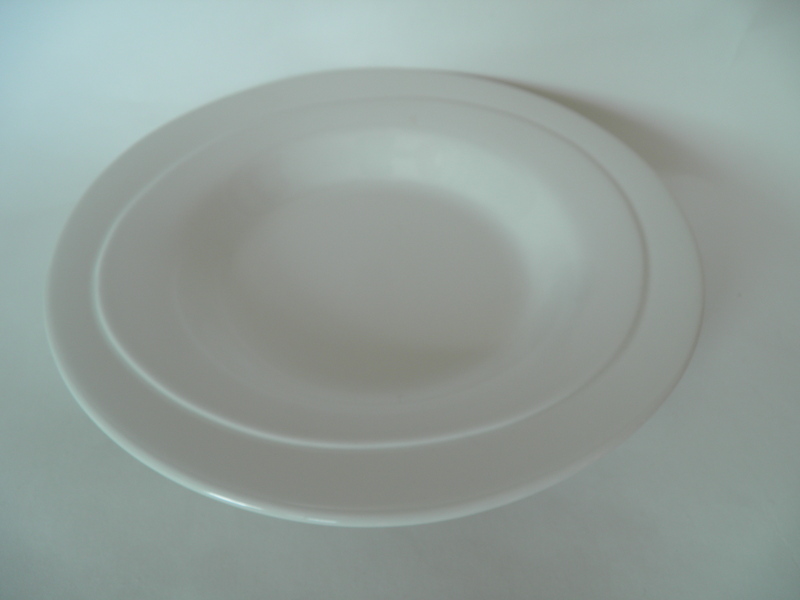 Two Myrna side plates by Myrna -series, Arabia, Olga Osol. 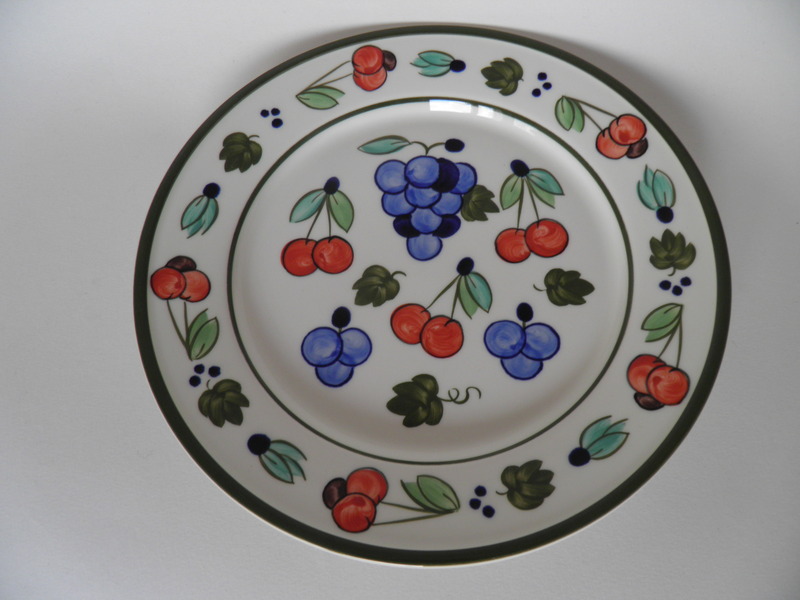 Mint dinner plate / serving plate by Myrtilla -series, Arabia. Decoration by Esteri Tomula. 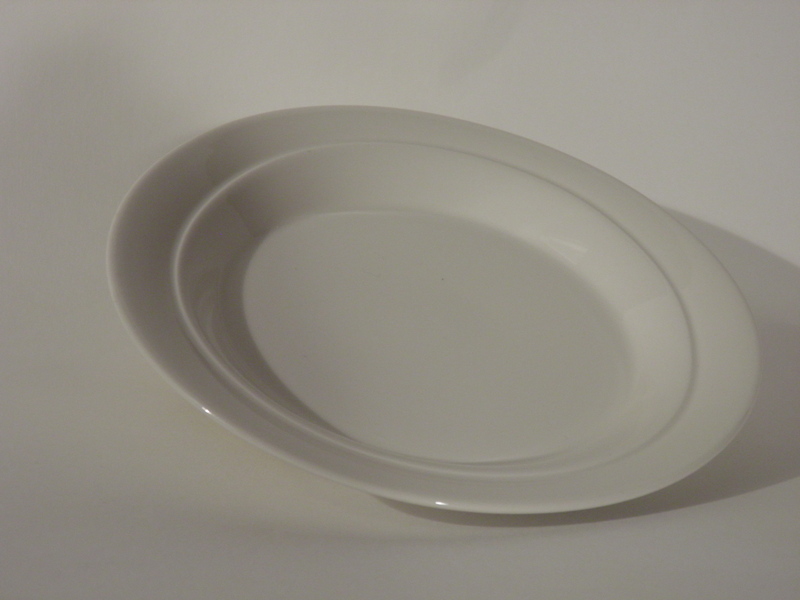 White square dinner plate by Nero -series, Arabia, Pekka Harni. 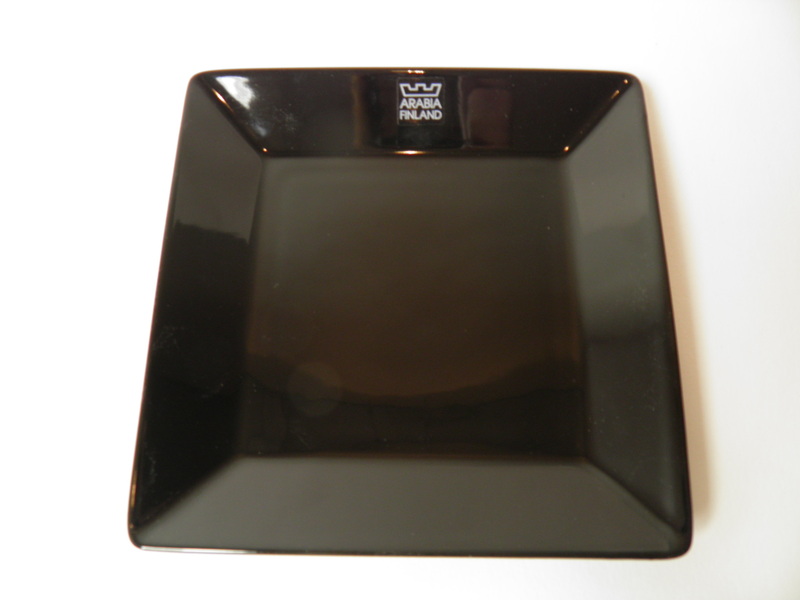 Black plate by Nero -series, Arabia, Pekka Harni. 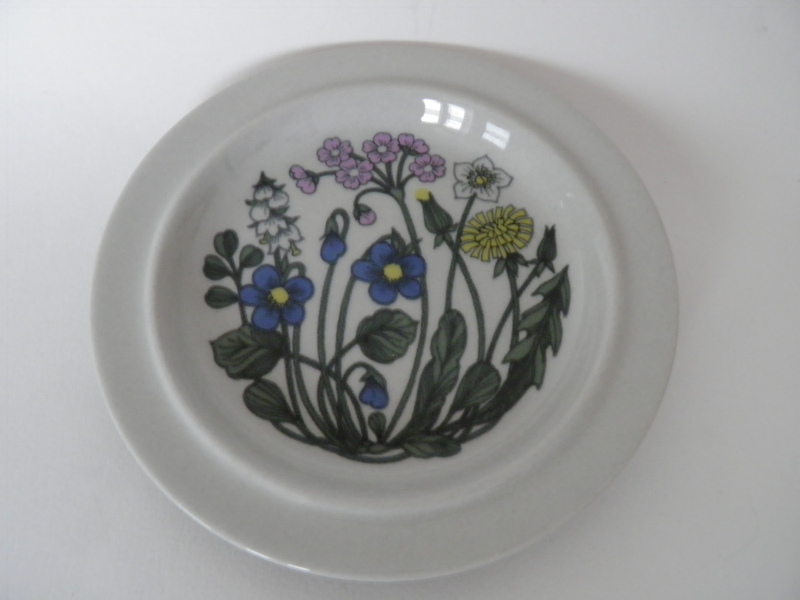 Oili plate by 140 Years Jubileum serie, Arabia, Johanna Kunelius. 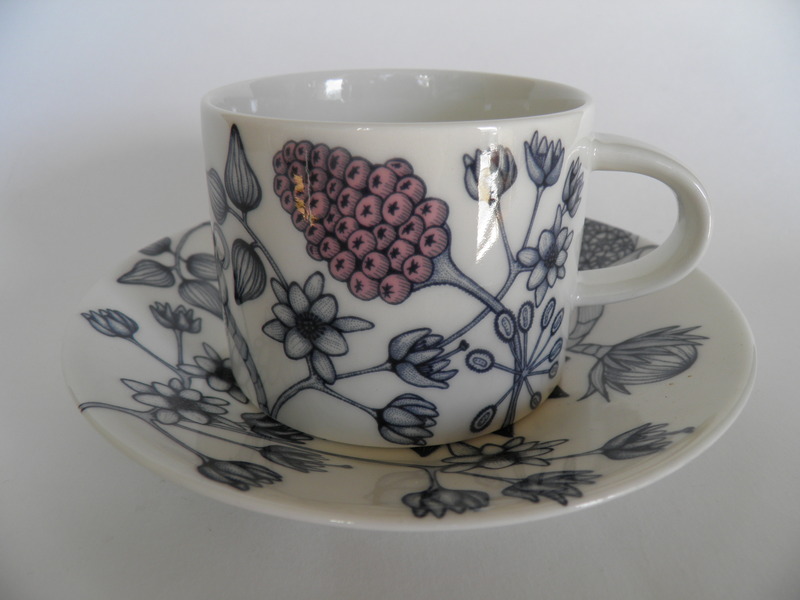 Hand painted tea cup & saucer & side plate by Paju -series, Arabia, Anja Jaatinen-Winquist. 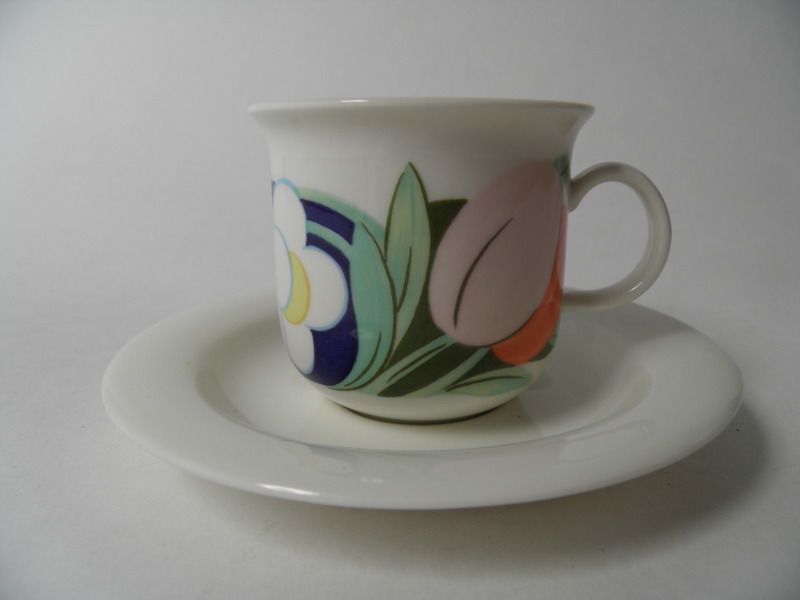 Mint, hand painted Palermo coffee cup and saucer by Arabia. 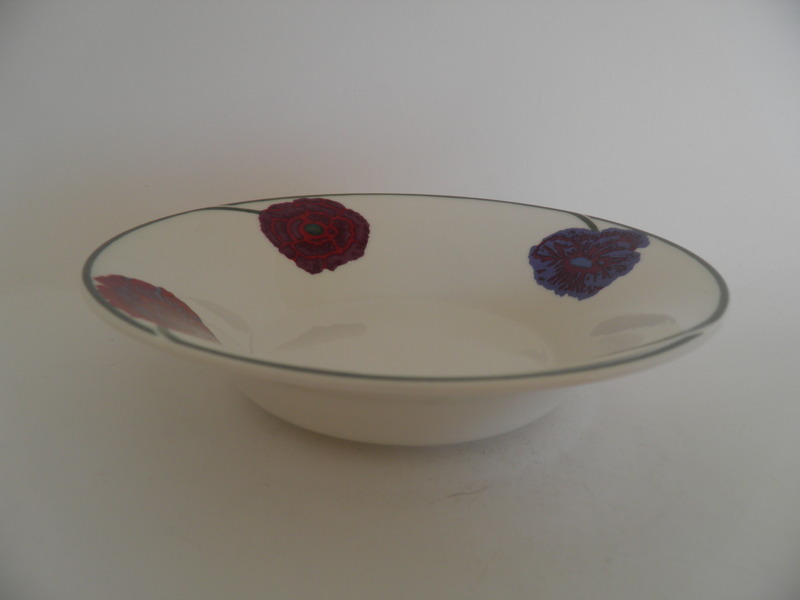 Designed by Dorrit von Fieandt. 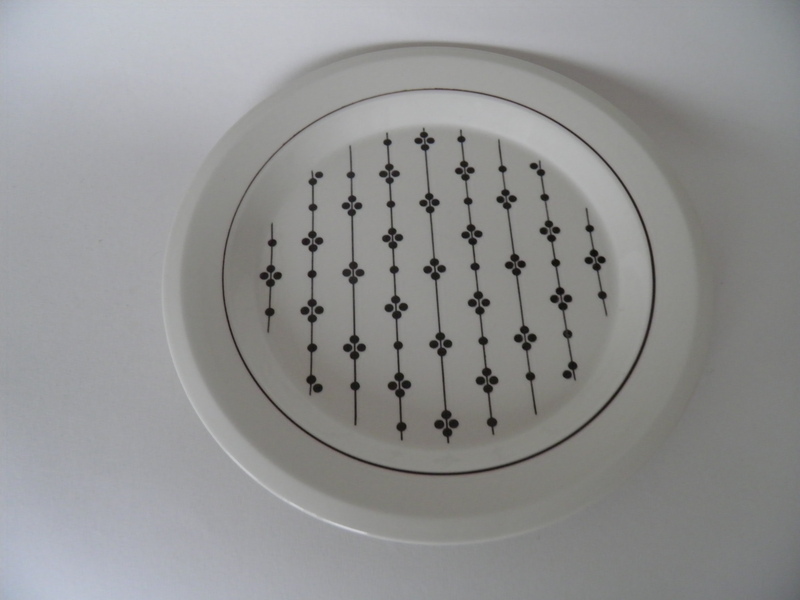 Deep plate by handpainted Palermo -series, Arabia, Dorrit von Fieandt. 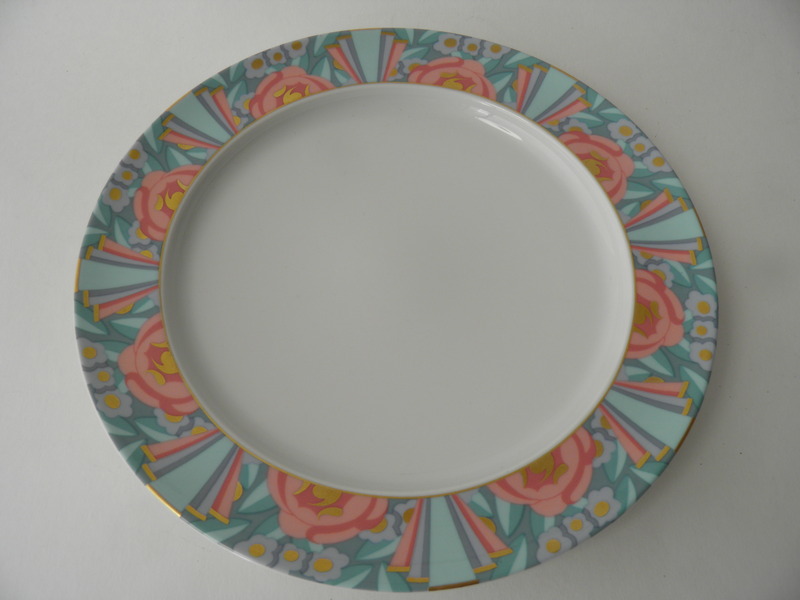 Hand painted Palermo dinner plate, Arabia, Dorrit von Fieandt. 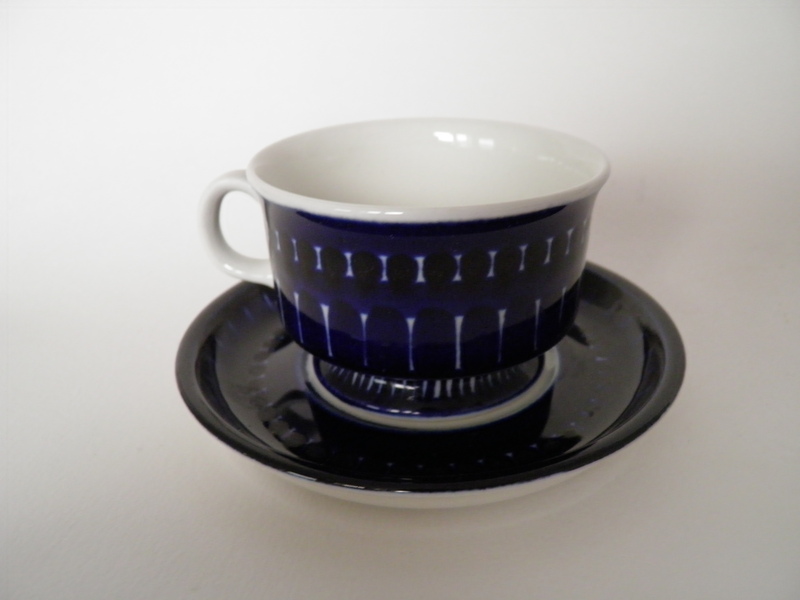 Coffee cup & saucer by Pallas -series, Arabia, model Richard Lindh, decoration Raija Uosikkinen. 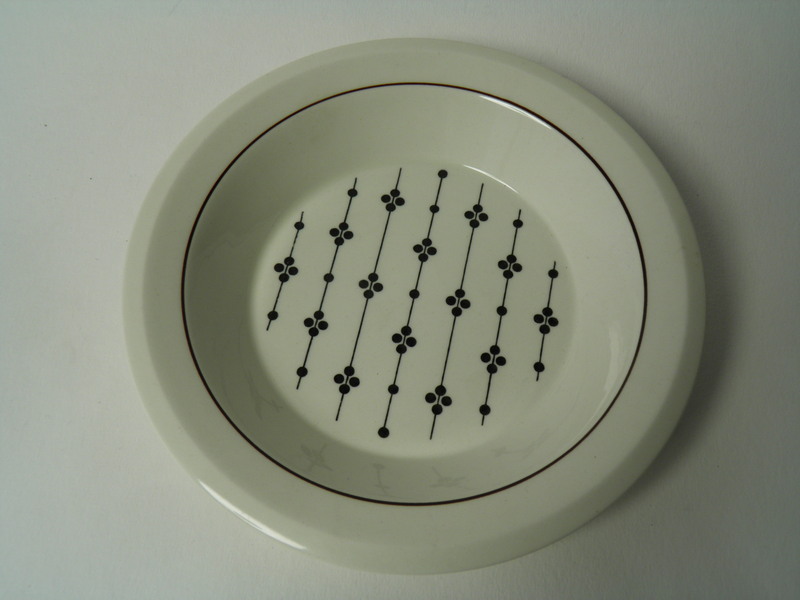 Black-white Paratiisi dinner plate, Arabia, Birger Kaipiainen. 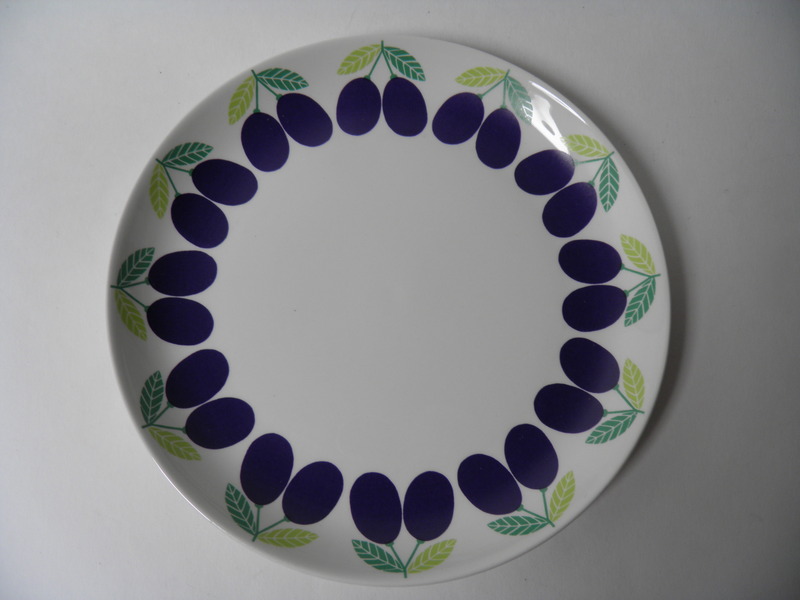 Purple dinner plate Paratiisi, Arabia, Birger Kaipiainen. 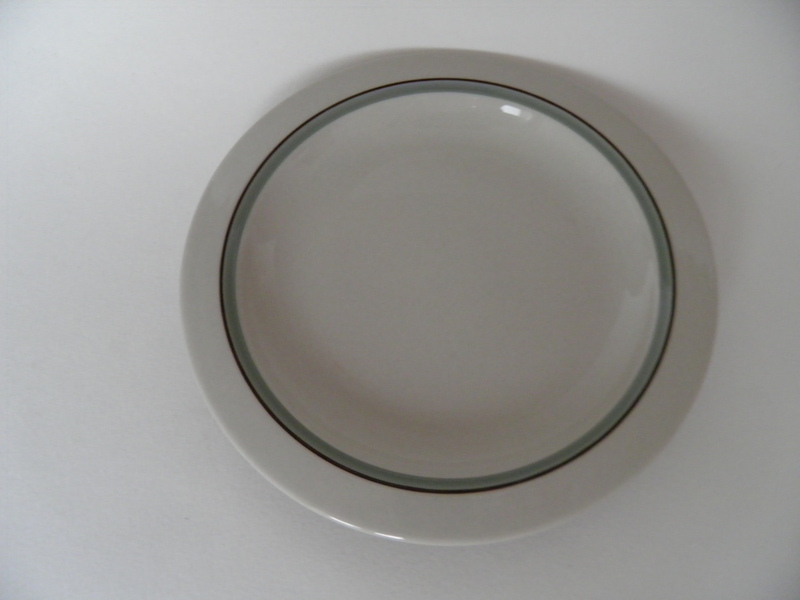 Oval dinner plate by black Paratiisi -series, Arabia, Birger Kaipiainen. 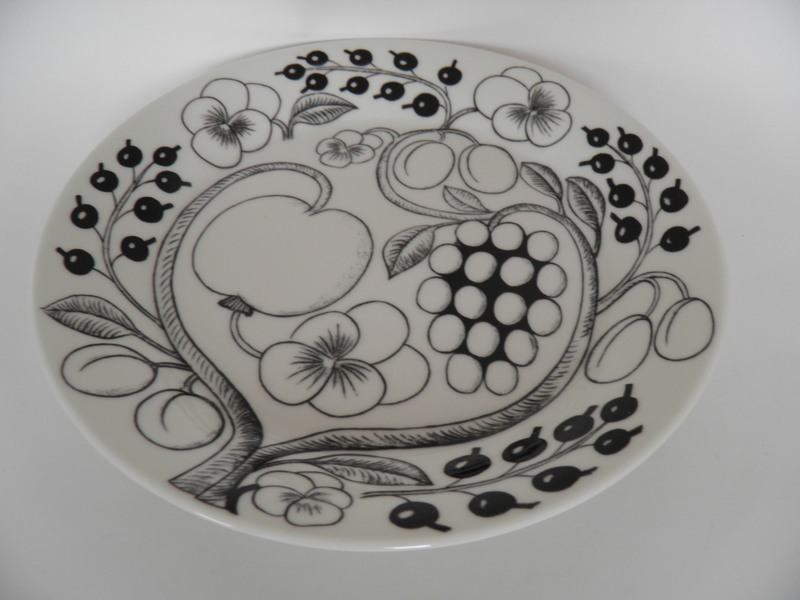 Black-white, oval plate by Paratiisi -series, Arabia, Birger Kaipiainen. 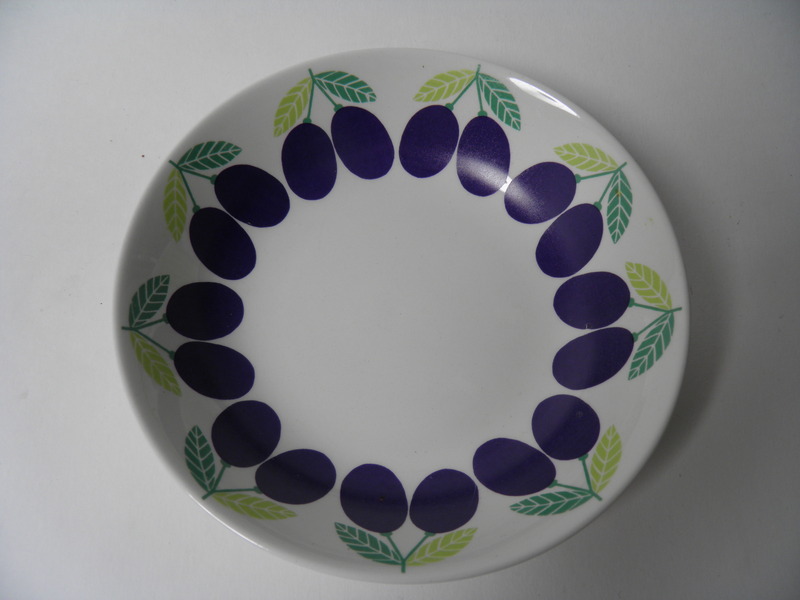 Purple salad plate Paratiisi, Arabia, Birger Kaipiainen. 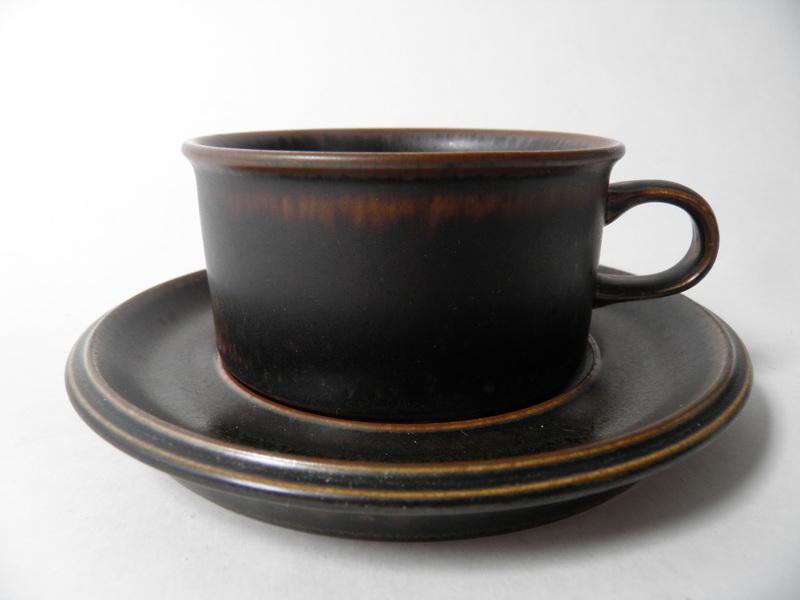 Black coffee cup & saucer Paula, Arabia 1955-1060, Kaj Franck. 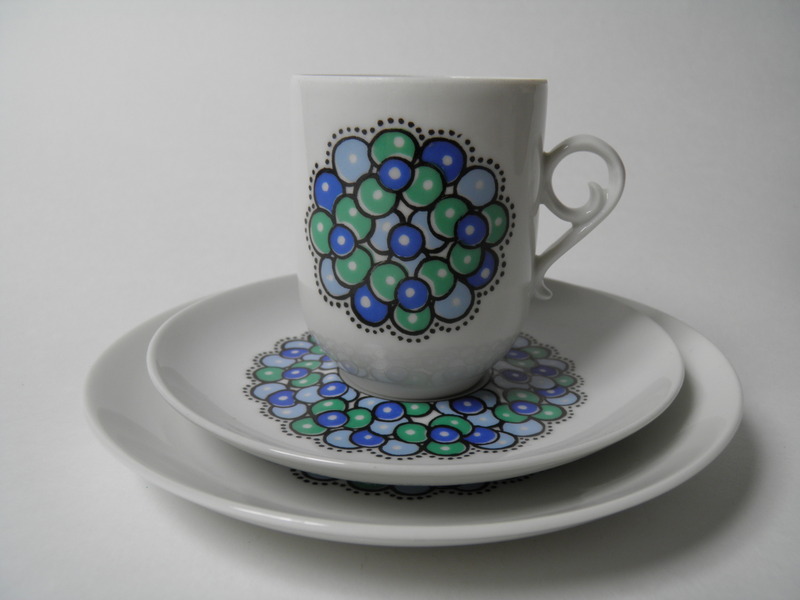 Coffee cup & saucer by light Pitsi -series, Arabia 1967-1974, decoration Raija Uosikkinen. 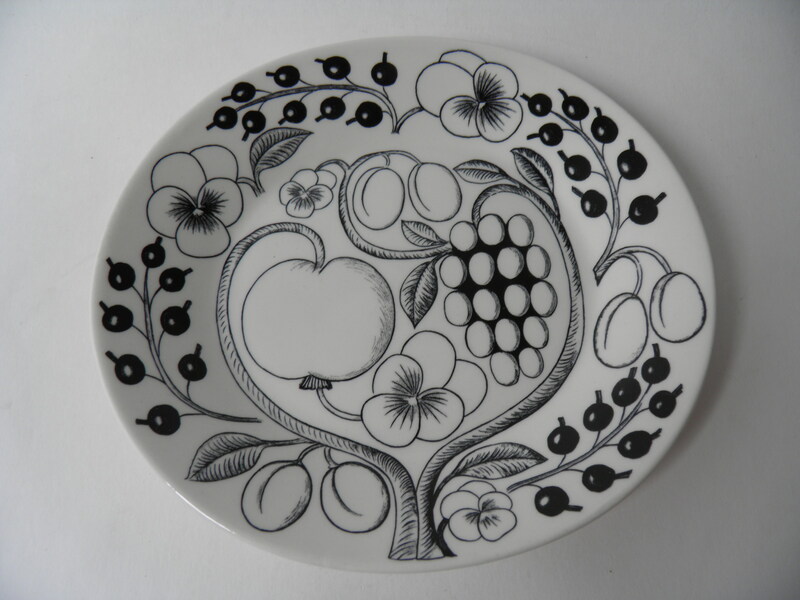 A deep plate with apple decoration by Pomona -series, Arabia, Raija Uosikkinen. 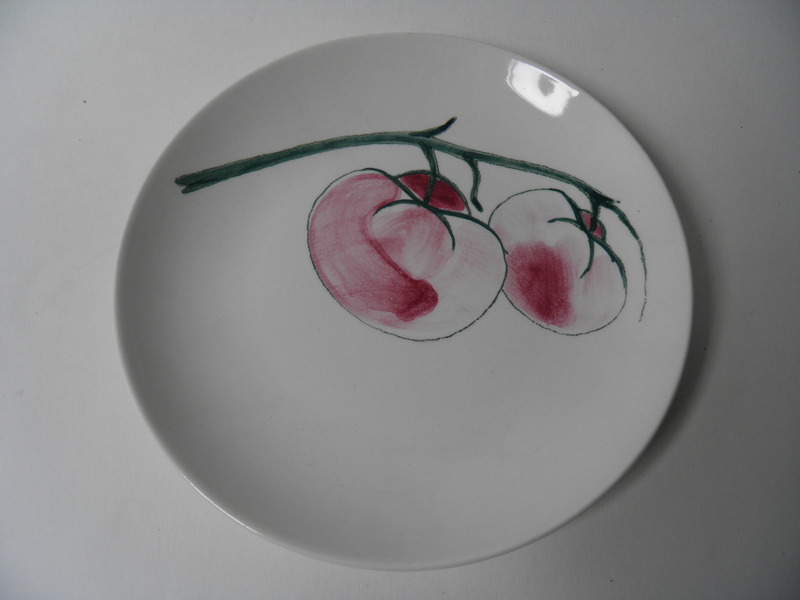 Deep plate with plum decoration by Pomona -series, Arabia, Raija Uosikkinen. 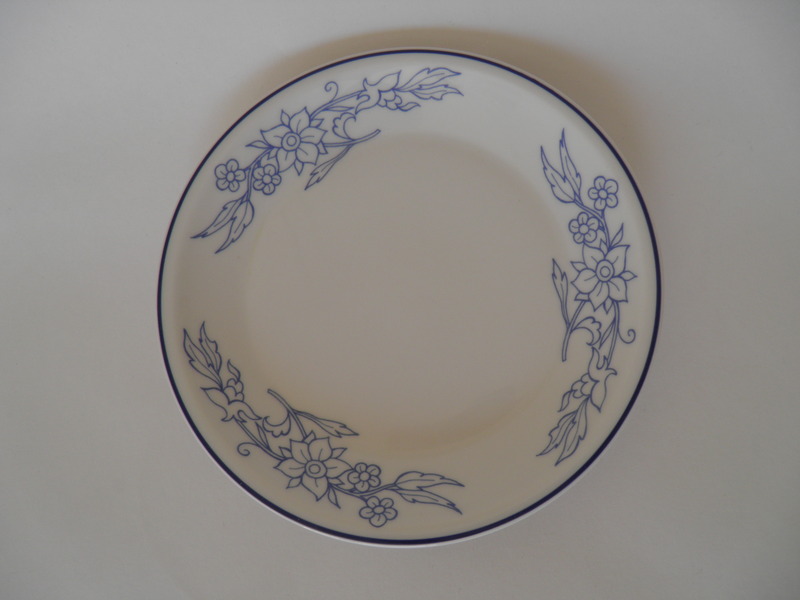 Dinner plate Blum by Pomona -series, Arabia, decoration Raija Uosikkinen. A plate with porcino decoreation, Arabia, Auvo Taivalvuo. 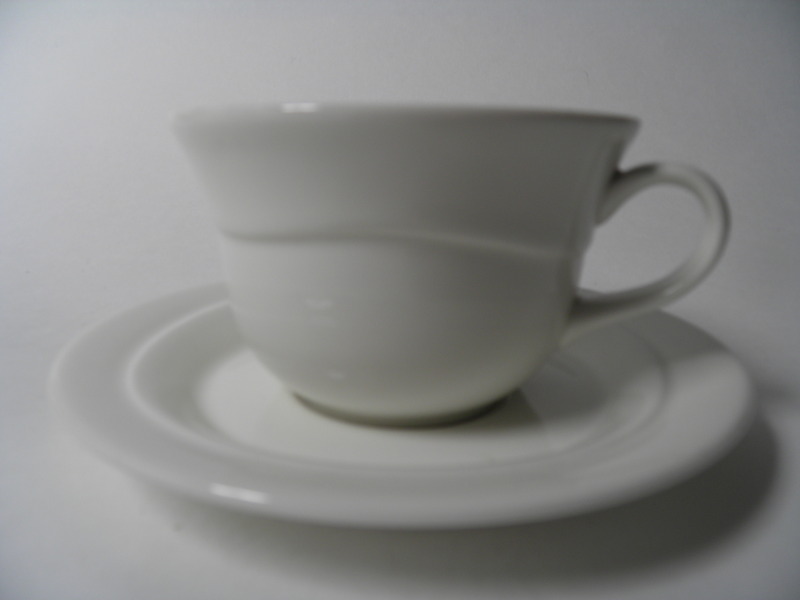 Coffee cup & saucer by Pudas Arctica -series, Arabia, Inkeri Leivo. Kuppi: korkeus 65 mm, halkaisija 70 mm. A sideplate by Pudas Arctica -series, Arabia, Inkeri Leivo. 140 Years Jubileum plate Raija, Arabia, Johanna Kunelius. 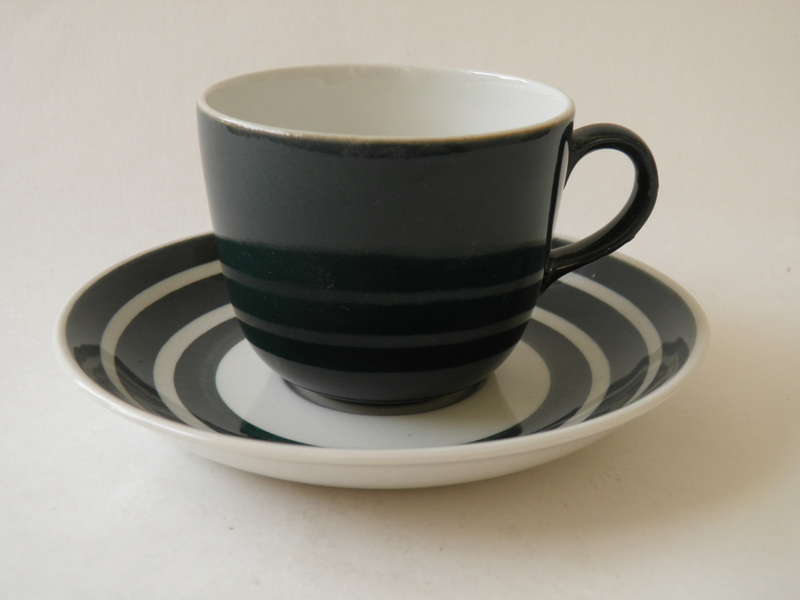 Darkgreen Circle - Rengas - coffee cup and saucer by Arabia. 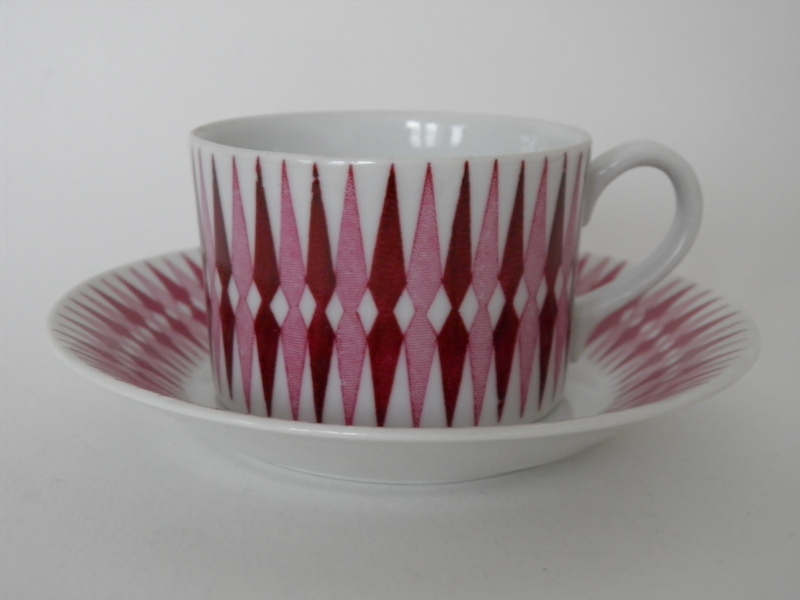 Red Revontuli coffee cup and saucer, model Raija Uosikkinen. 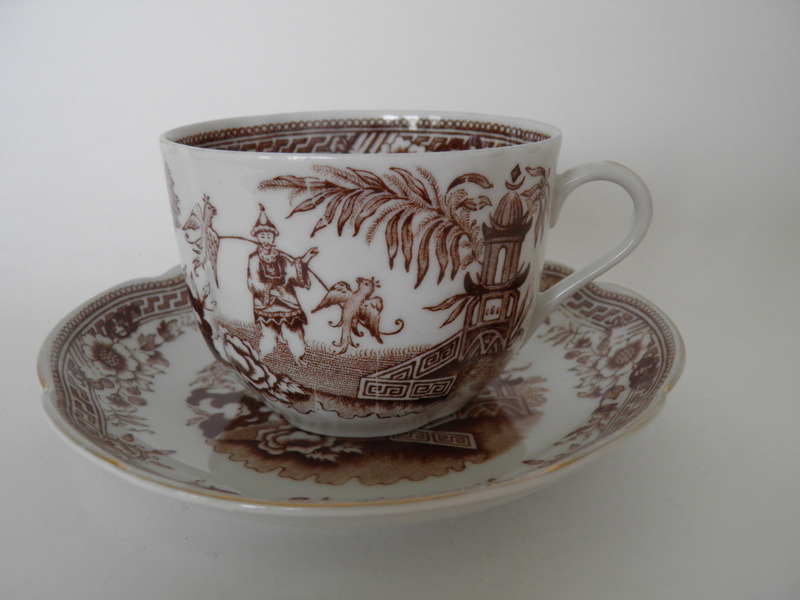 Rice porcelain coffee cup & saucer, Arabia, Richard Lindh. 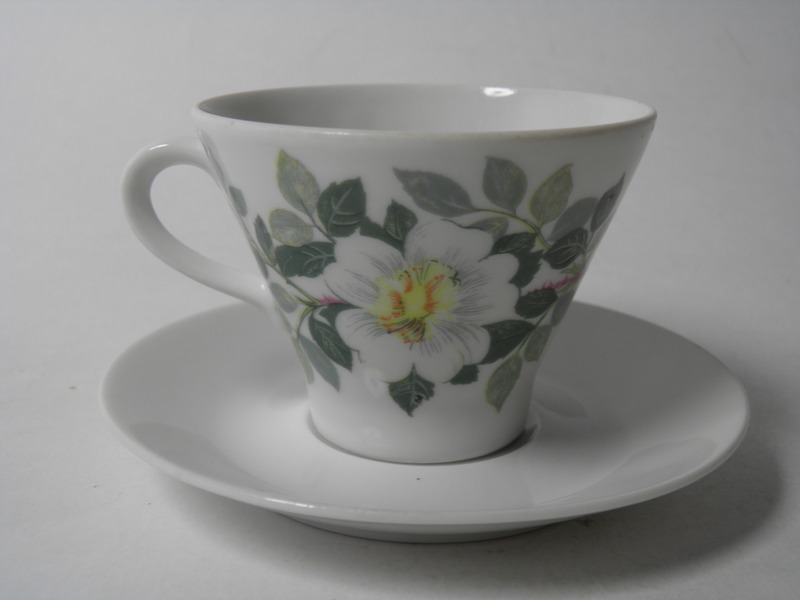 Rice porcelain coffee cup & saucer, Arabia, Friedl Holzer-Kjellberg. 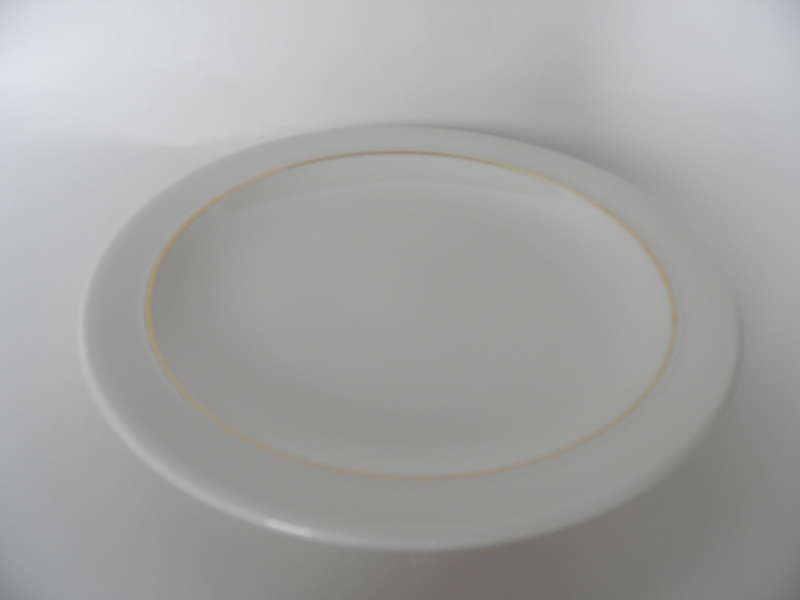 Rice porcelain dinner plate, Arabia, Friedl Holzer-Kjellberg. 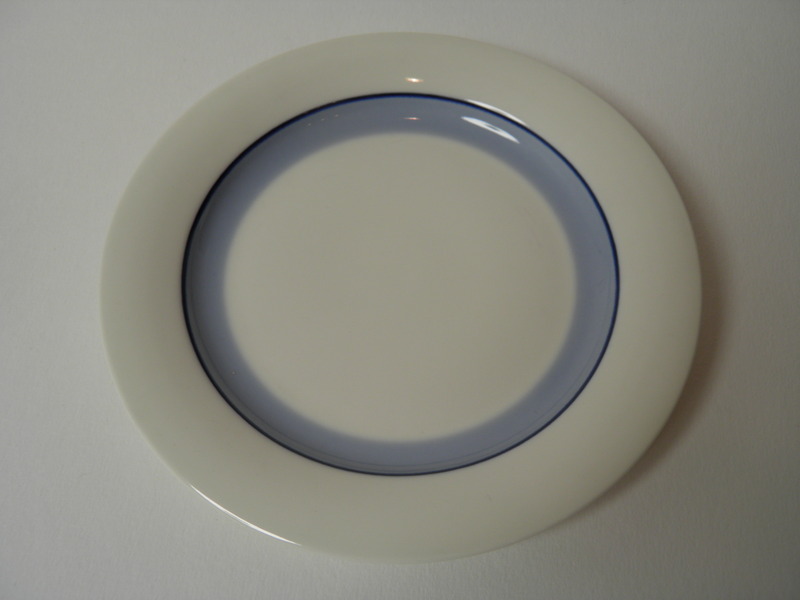 Rice porcelain side plate, Arabia, Friedl Holzer-Kjellberg. 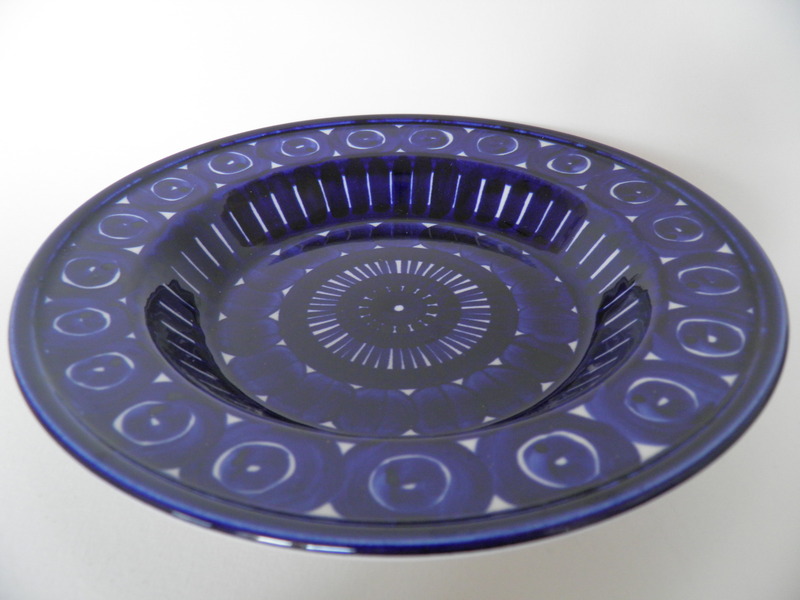 Blue breakfast set by Riikinkukko -series, Arabia, Raija Uosikkinen. 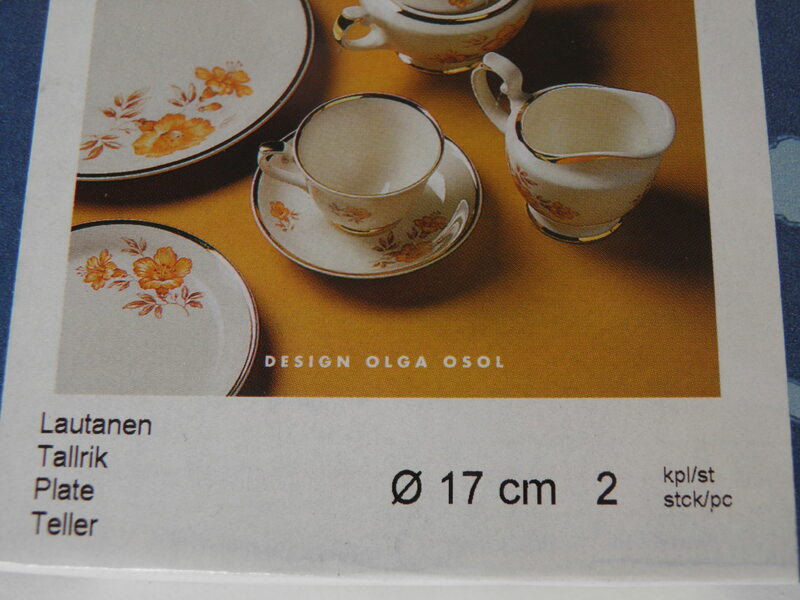 Handpainted coffee cup & saucer & sideplate Rosalia, Arabia, Hilkka-Liisa Ahola. 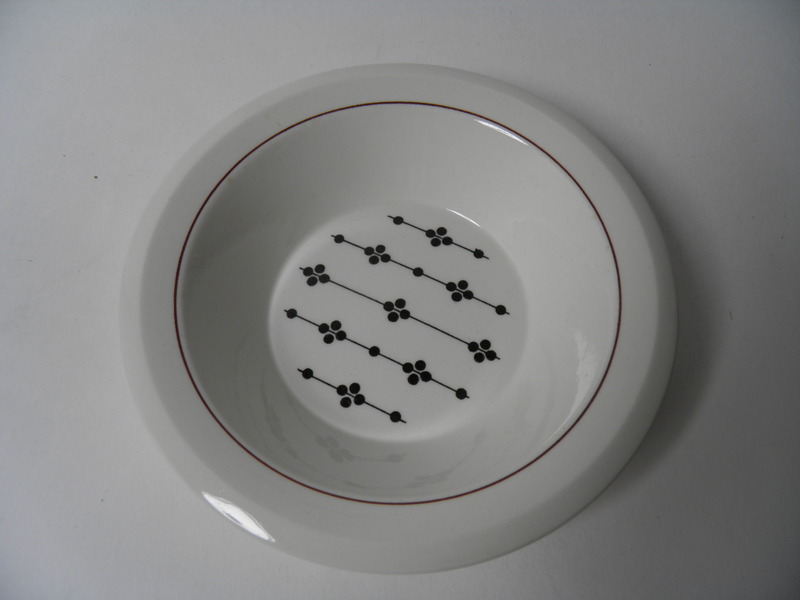 Coffee cup & saucer & sideplate by Rose (Ruusu) -series, Arabia, Anneli Qveflander. 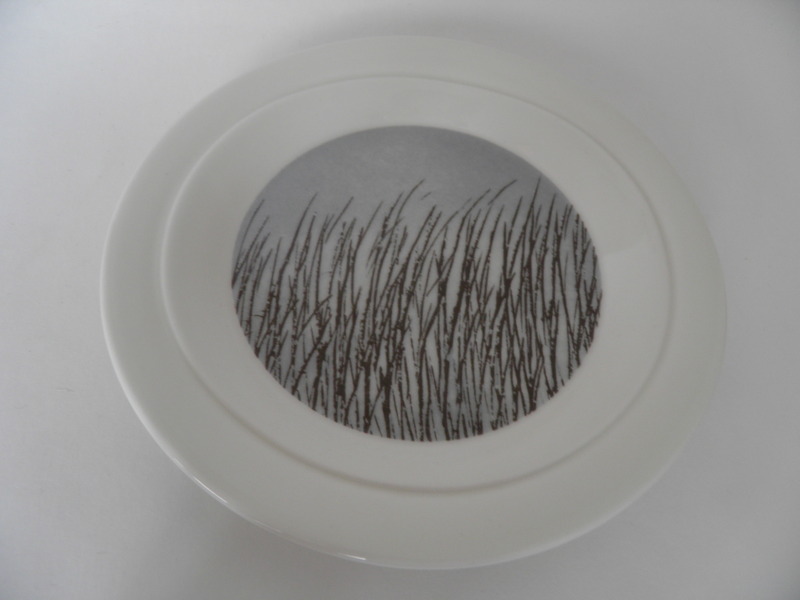 Dinner plate Autumn Glow by Runo -series, Arabia, Heini Riitahuhta. Deep plate Neitoperho by Runo -series, Arabia, Heini Riitahuhta. 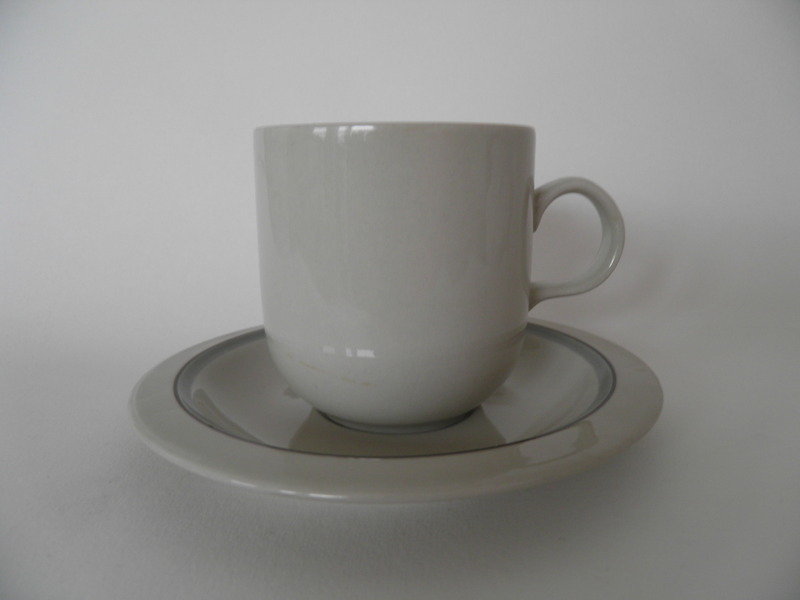 Coffee cup & saucer by Runo Neitoperho -series, Arabia 2009-2014, Heini Riitahuhta. 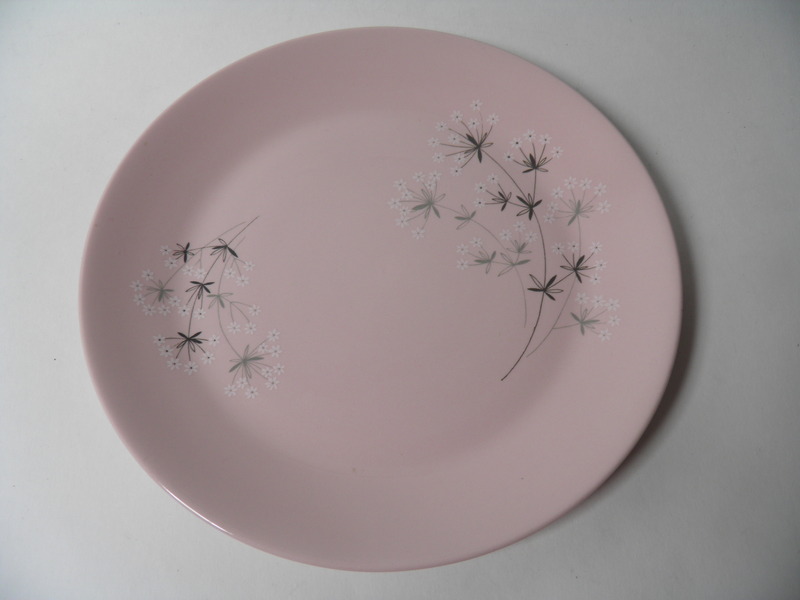 Spring Bell dinner plate by Runo -series, Arabia, Heini Riitahuhta. 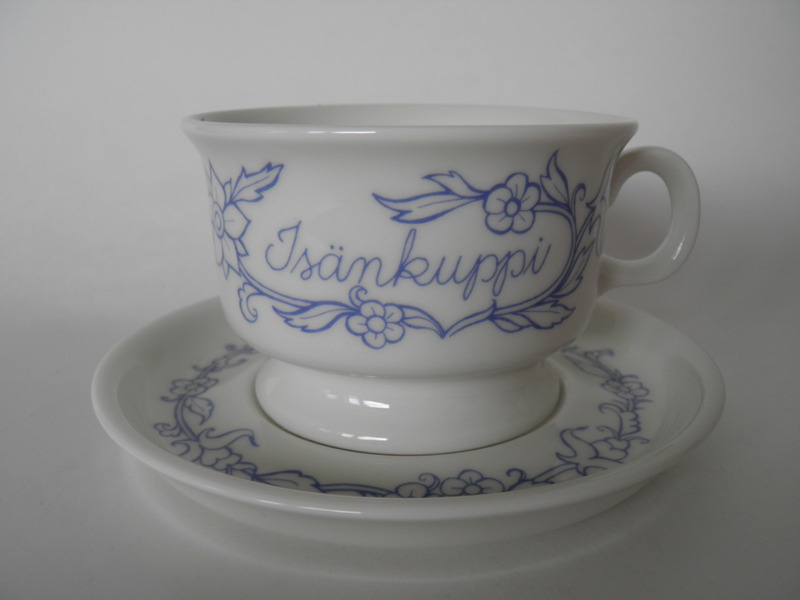 Tea cup & saucer Spring bell (Kevätkello) by Runo -series, Arabia, Heini Riitahuhta. 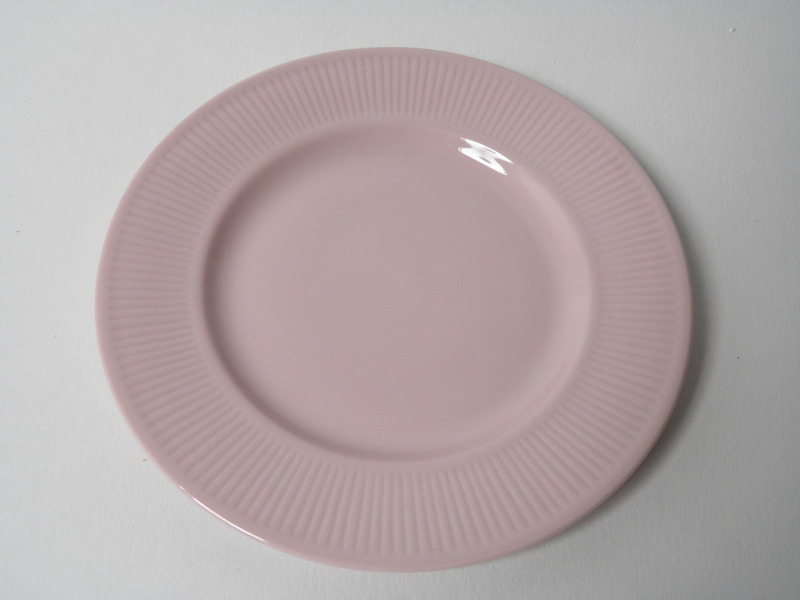 Summer Ray dinner plate vy Runo -series, Arabia, Heini Riitahuhta. 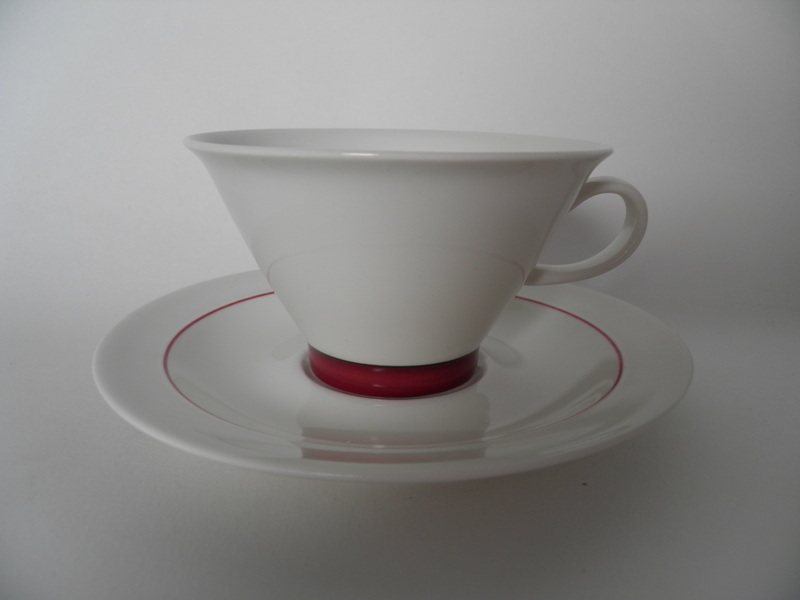 Tea cup & saucer by Ruska -series, Arabia, Ulla Procopé. 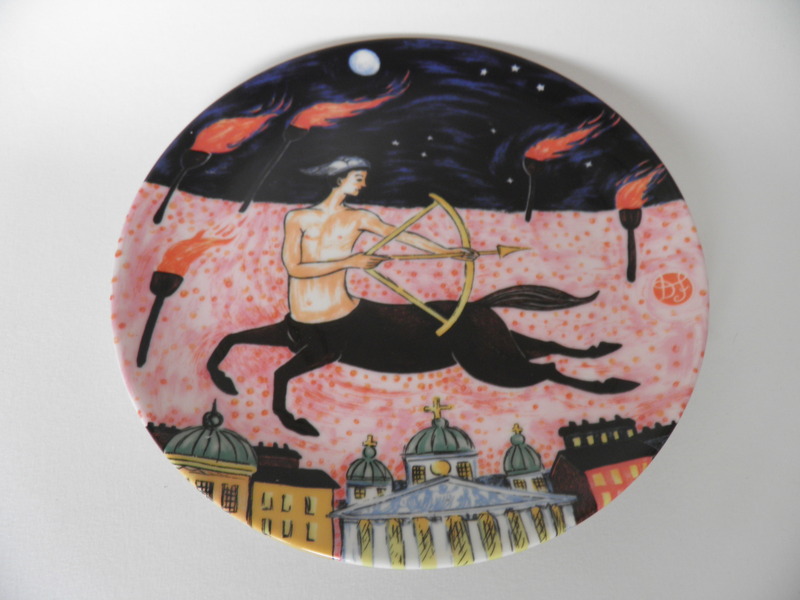 Mint Sagittarius Plate by Arabia. Designed by Dorrit von Fieandt. 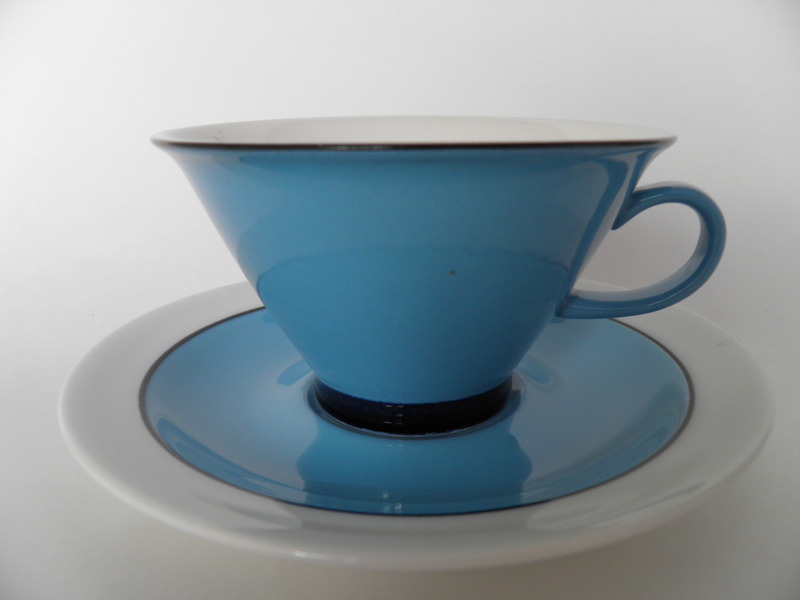 Blue Singapore coffee cup & saucer, Arabia. 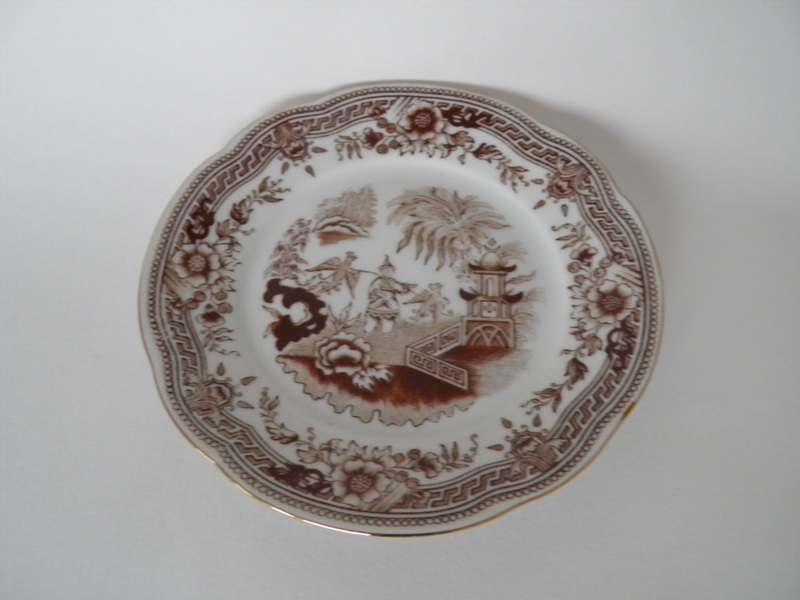 Brown Singapore side plate, Arabia. 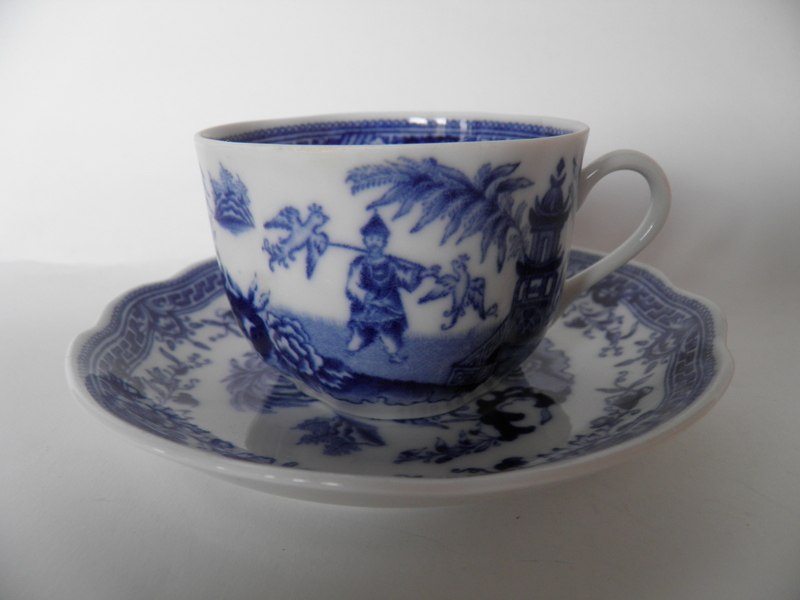 Blue Singapore tea cup & saucer, Arabia. 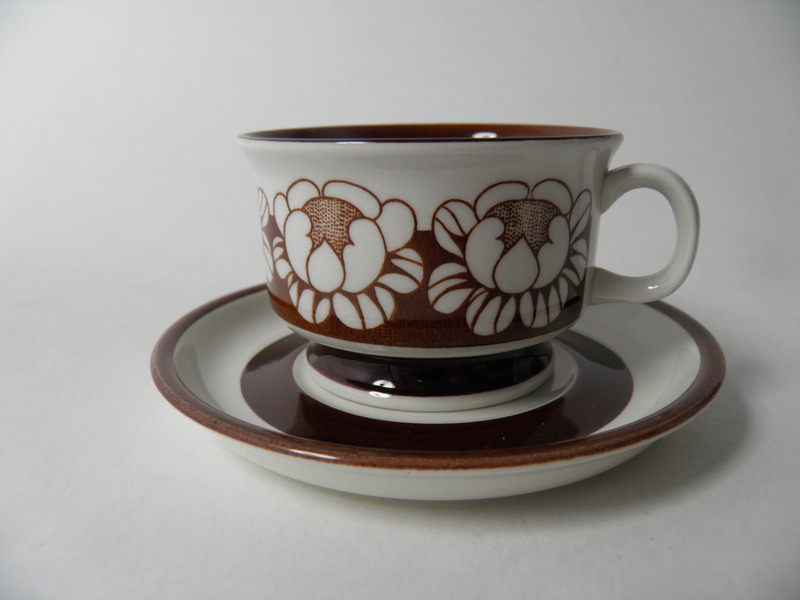 Teacup and saucer brown Singapore by Arabia. Good condition. 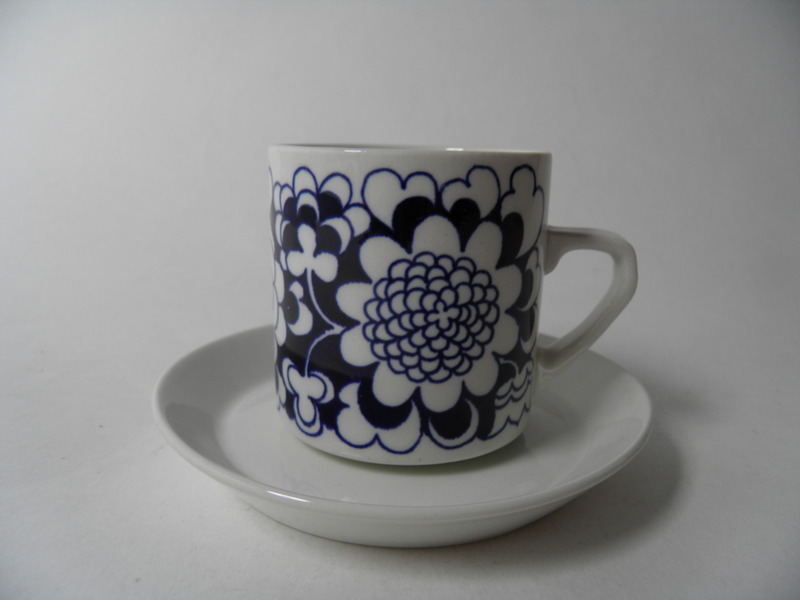 Coffee cup & saucer by Sininen Keittiö (Blue Kitchen) -series, Arabia. 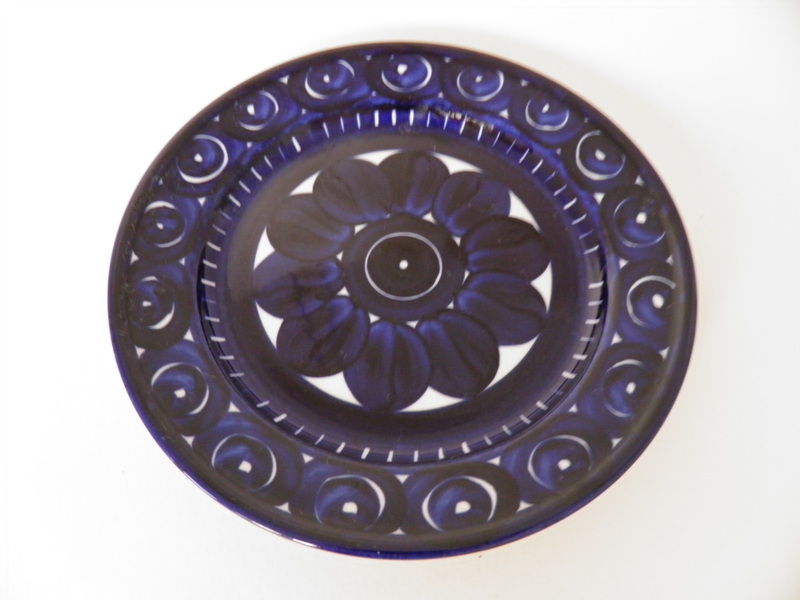 Side plate by Sininen Keittiö (Blue Kitchen) -series, Arabia. 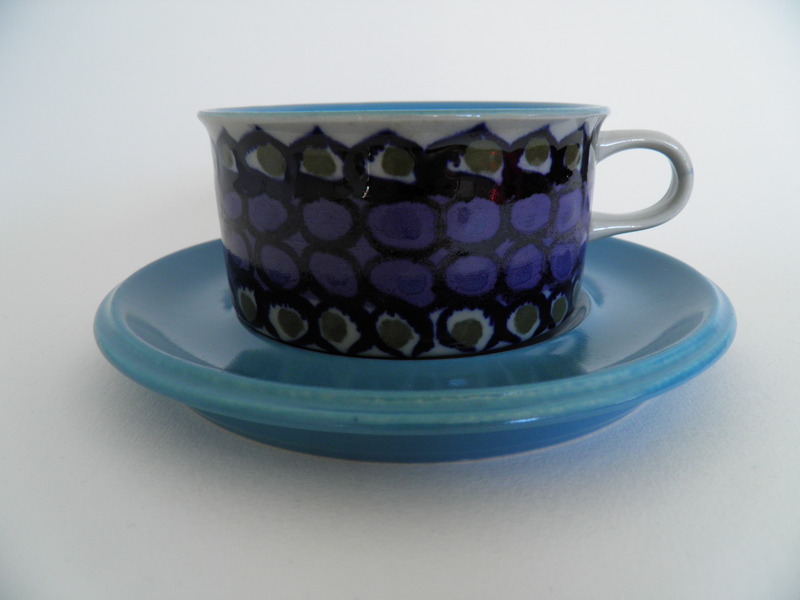 Tea cup & saucer by Sininen Keittiö (Blue Kitchen) -series, Arabia. 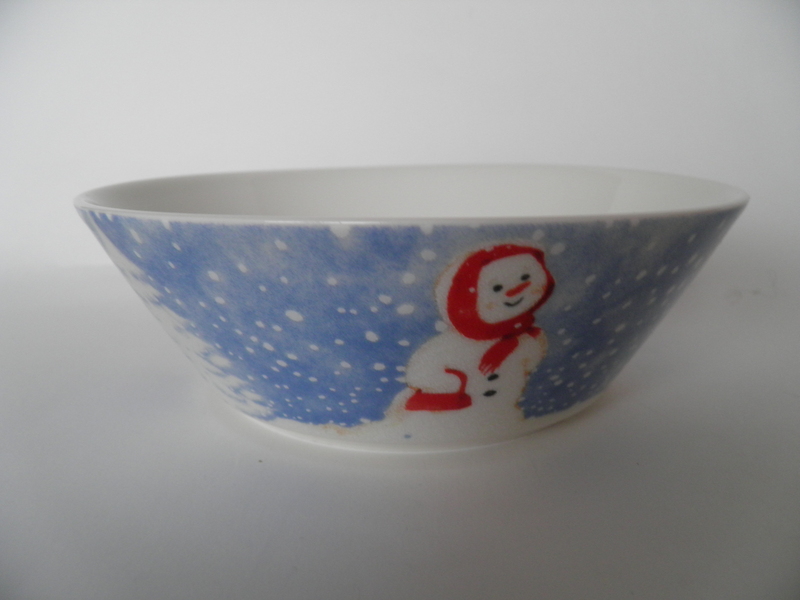 Snow woman deep plate/bowl, Arabia Christmas 2010, Minna Immonen. 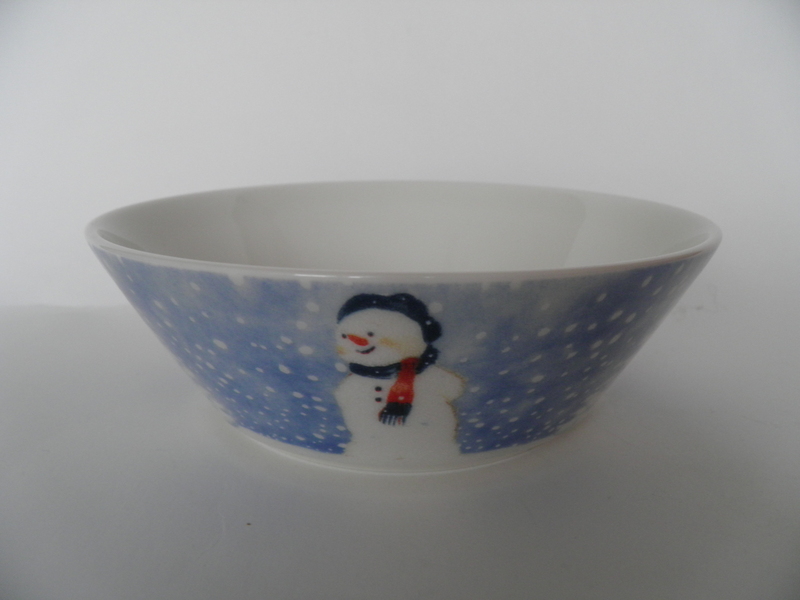 Snowman deep plate/bowl, Arabia Christmas 2010, Minna Immonen. 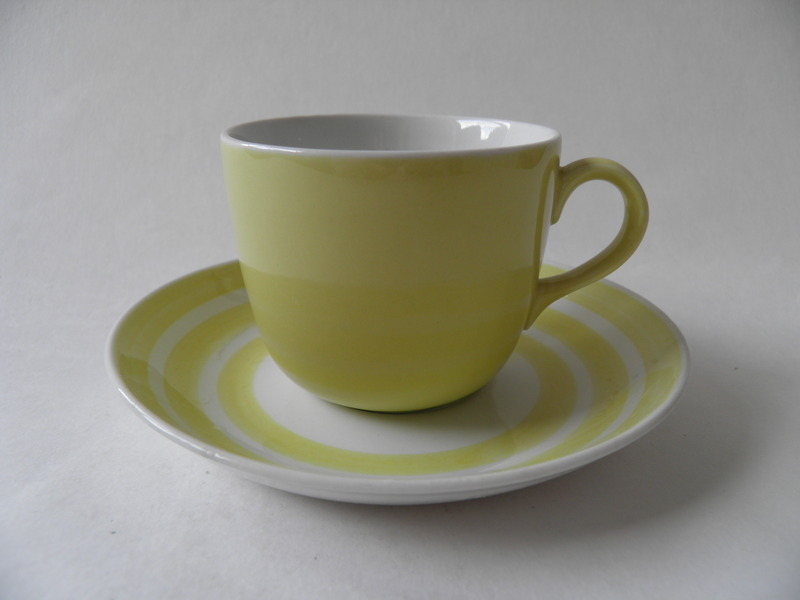 Lightgreen coffee cup & saucer by Sointu -series, Arabia, Kaj Franck. 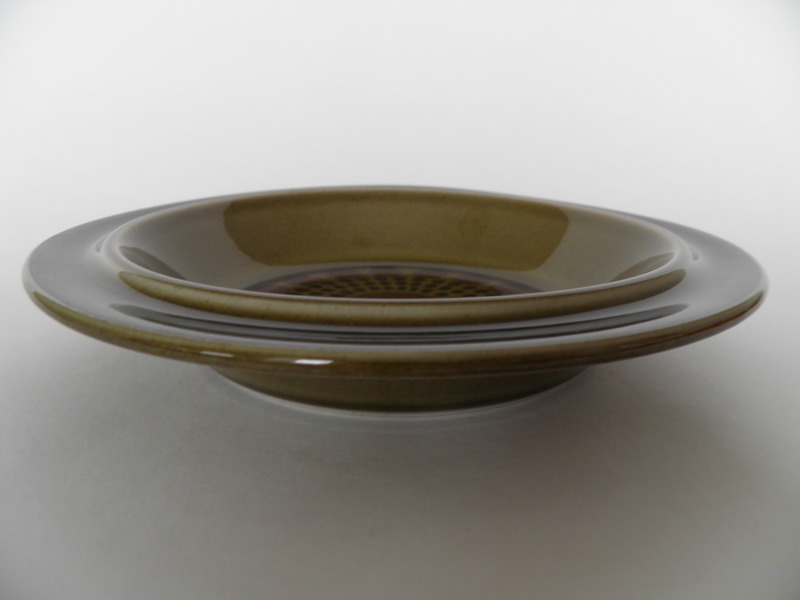 Lightbrown coffee cup & saucer by Sointu -series, Arabia, Kaj Franck. 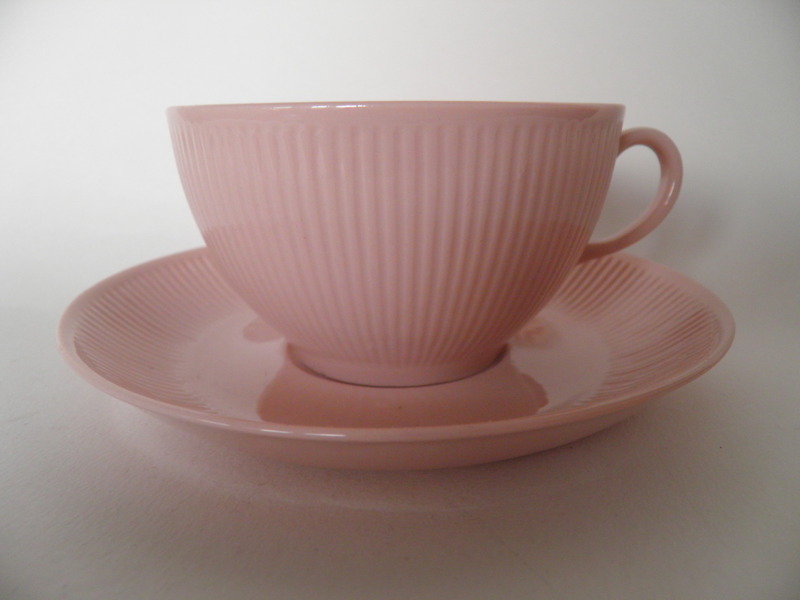 Pink coffee cup & saucer by Sointu -series, Arabia, Kaj Franck. 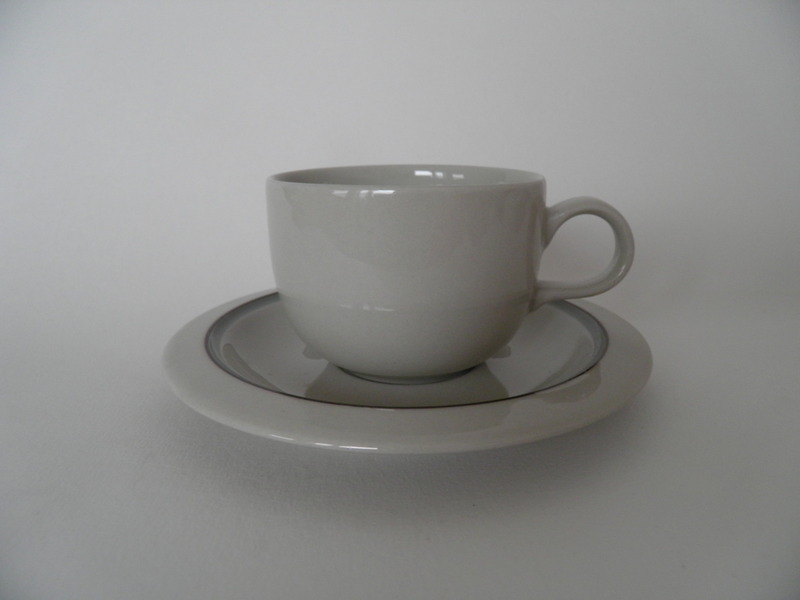 Grey coffee cup & saucer by Sointu -series, Arabia, Kaj Franck. 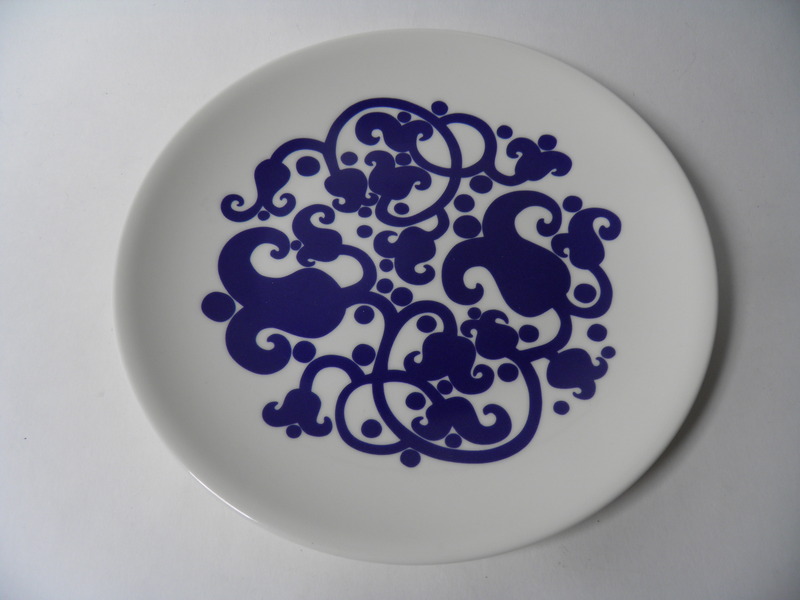 Blue side plate by Sointu -series, Arabia, Kaj Franck. 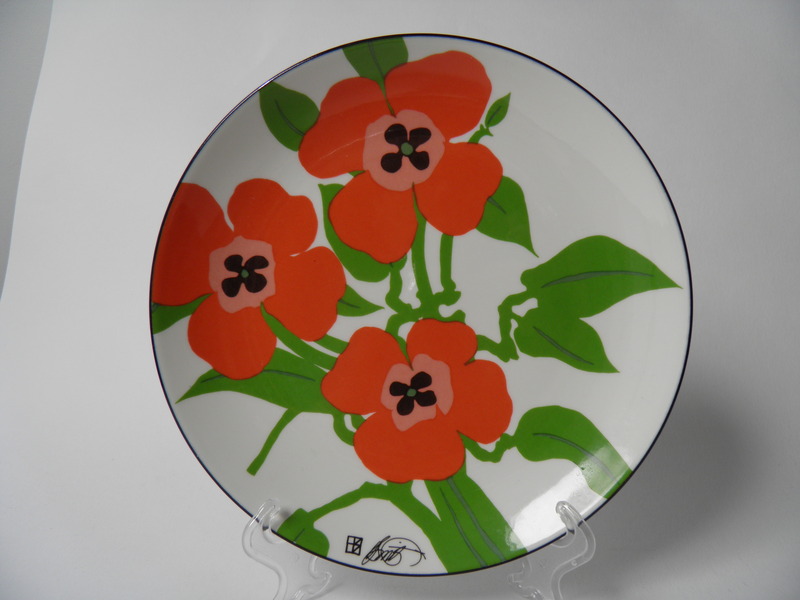 Rosa side plate by Sointu -series, Arabia, Kaj Franck. Green sideplate vy Sointu -series, Arabia, Kaj Franck. 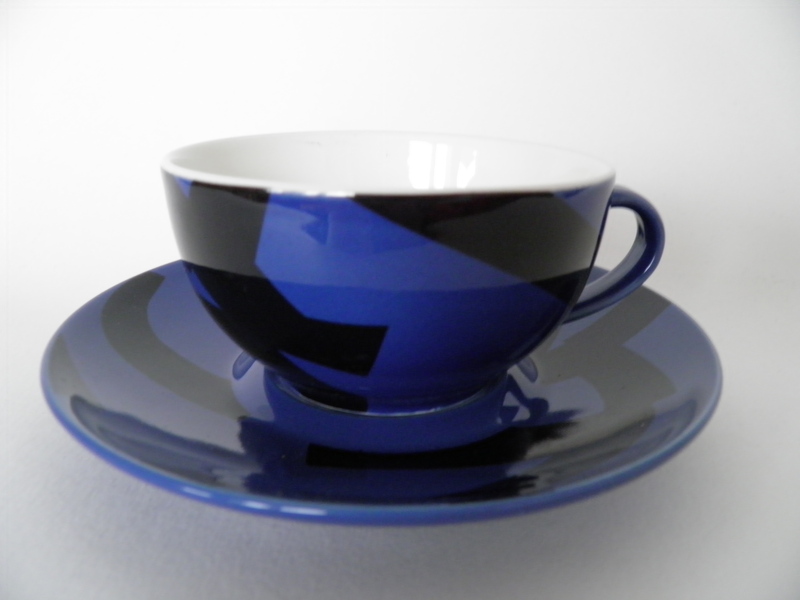 Blue-grey tea cup & saucer by Sointu -series, Arabia, Kaj Franck. 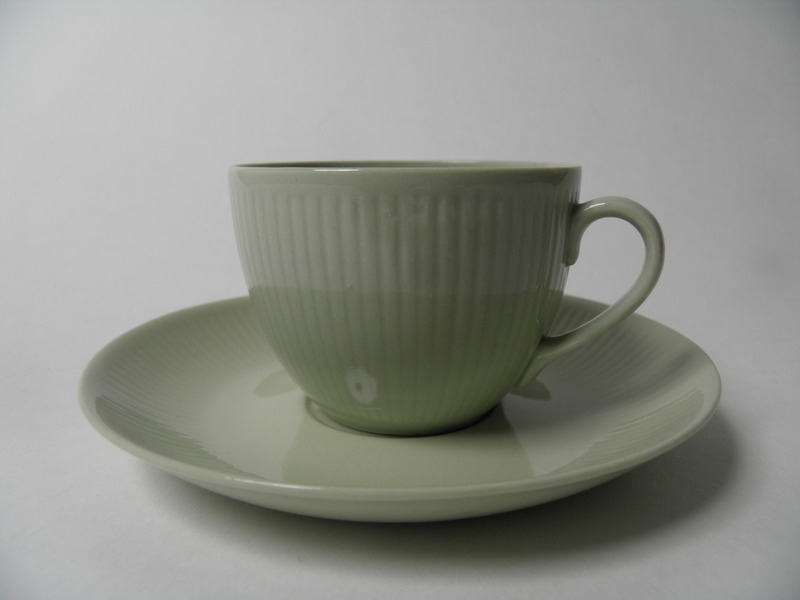 Lightgreen tea cup & saucer by Sointu -series, Arabia, Kaj Franck. 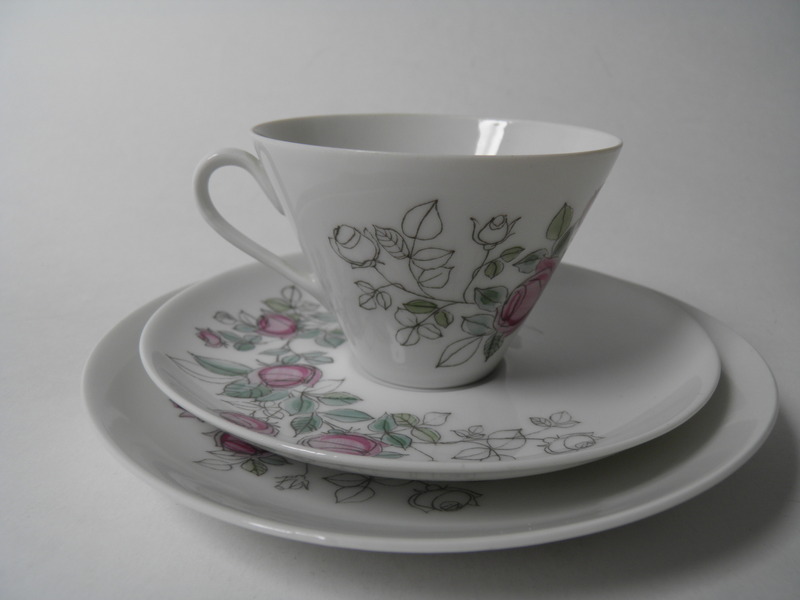 Rosa tea cup & saucer by Sointu -series, Arabia, Kaj Franck. 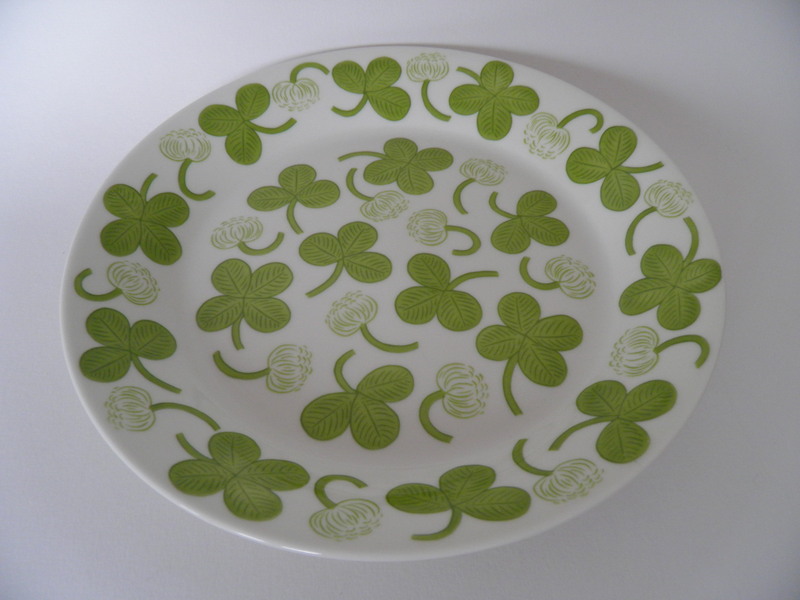 Green dinner/servint plate by Sointu -series, Arabia, Kaj Franck. 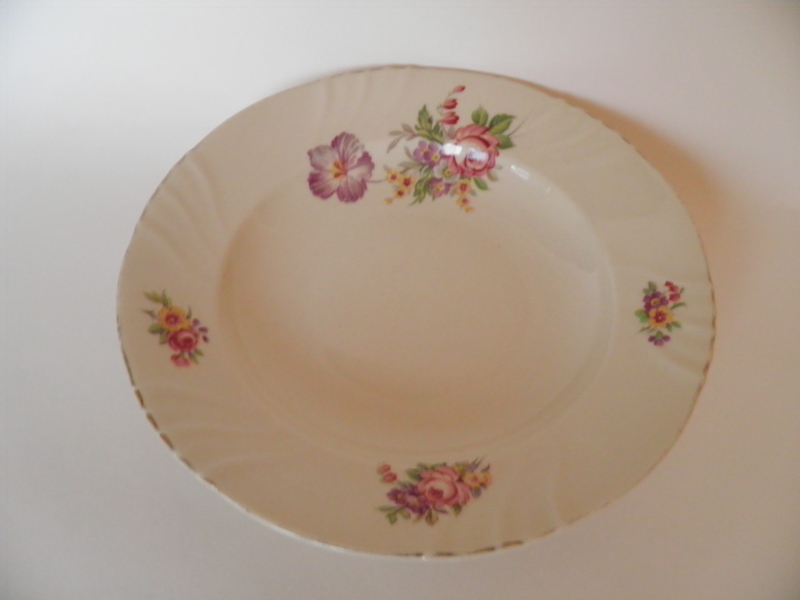 Small, old soup plate with flowers by Arabia. 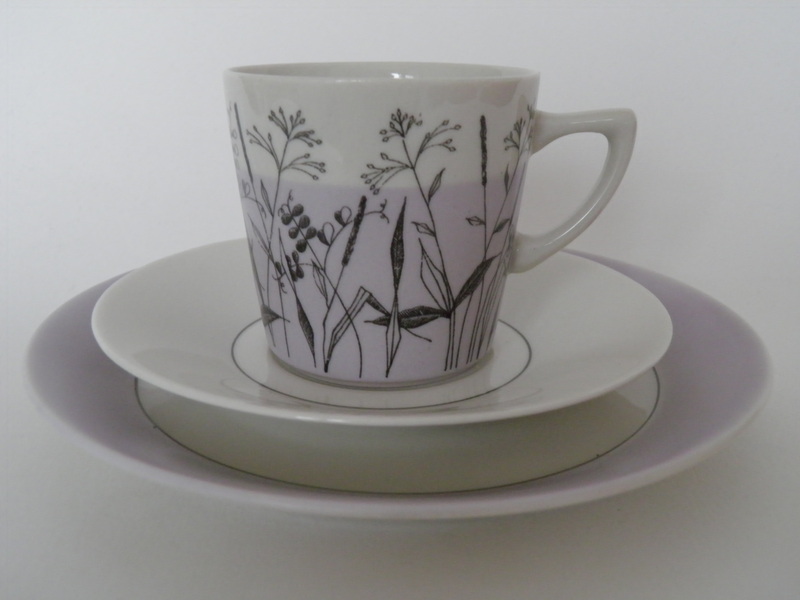 Lilac Summer - Kesä - coffee cup and saucer and side plate. Designed by Raija Uosikkinen. Good condition. 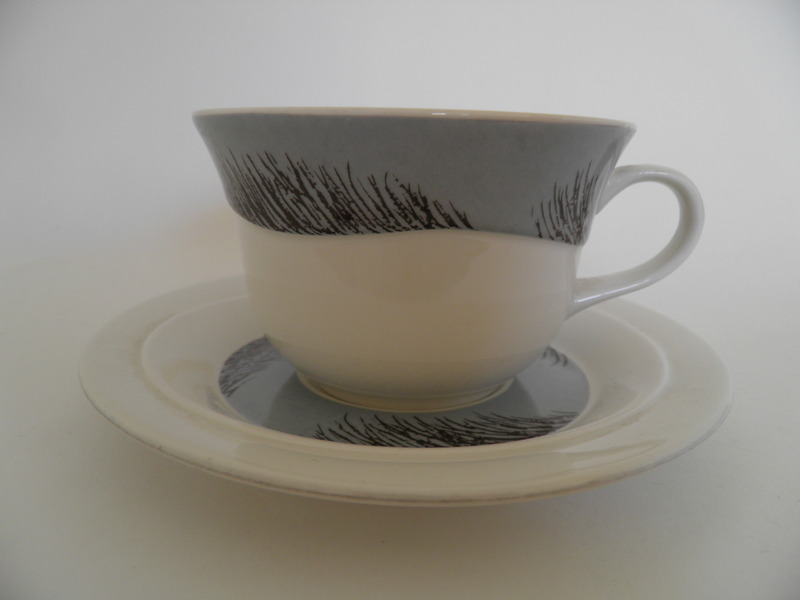 Coffee cup & saucer by Talvikki -series, Arabia, Raija Uosikkinen. 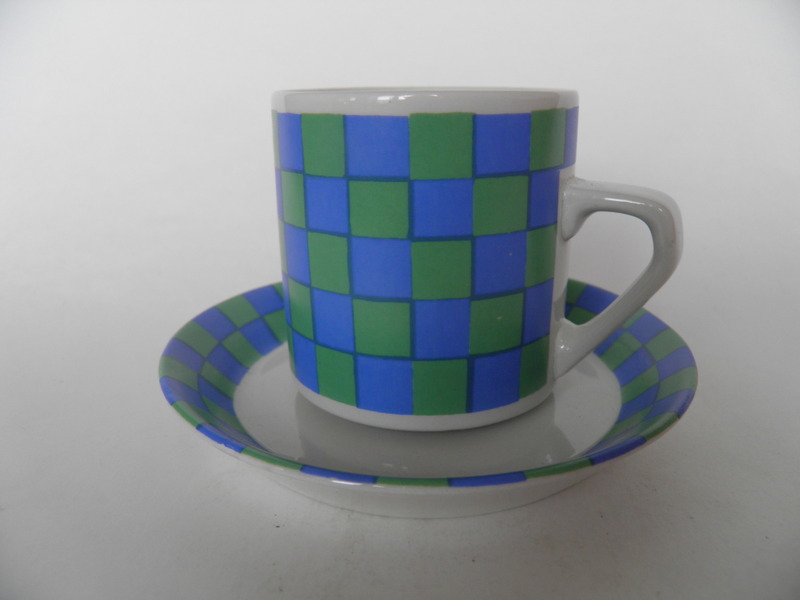 Blue-green checkered coffee cup & saucer, Arabia, Esteri Tomula. 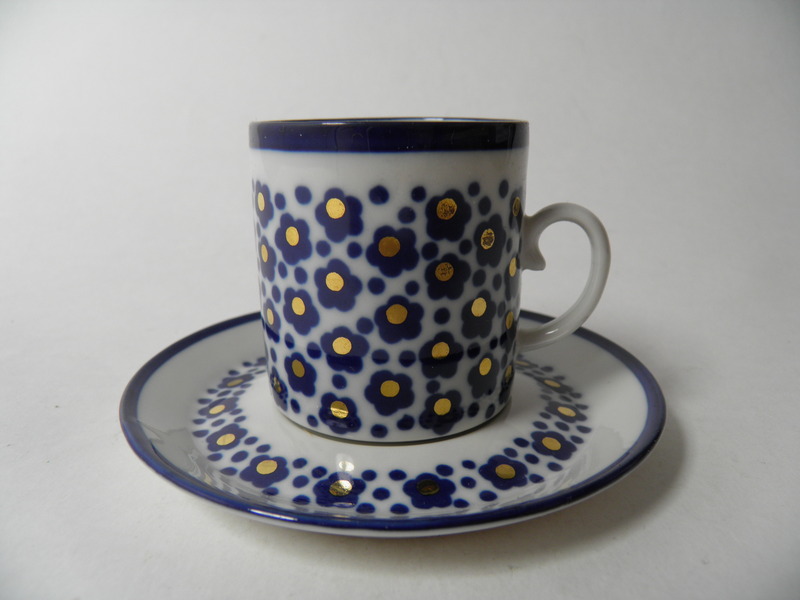 Rare tea cup & saucer by Arabia Ateljé. 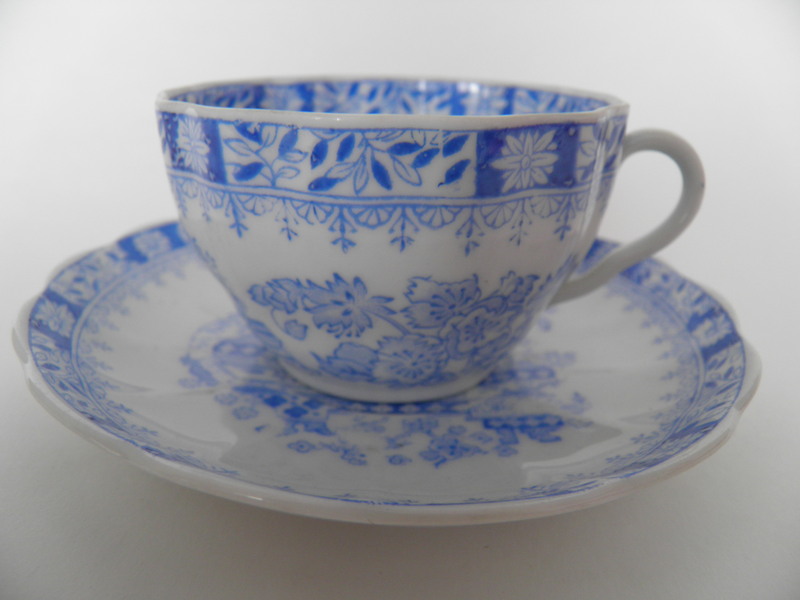 Blue, handpainted tea cup & saucer, Arabia Ateljé, Hilkka-Liisa Ahola. 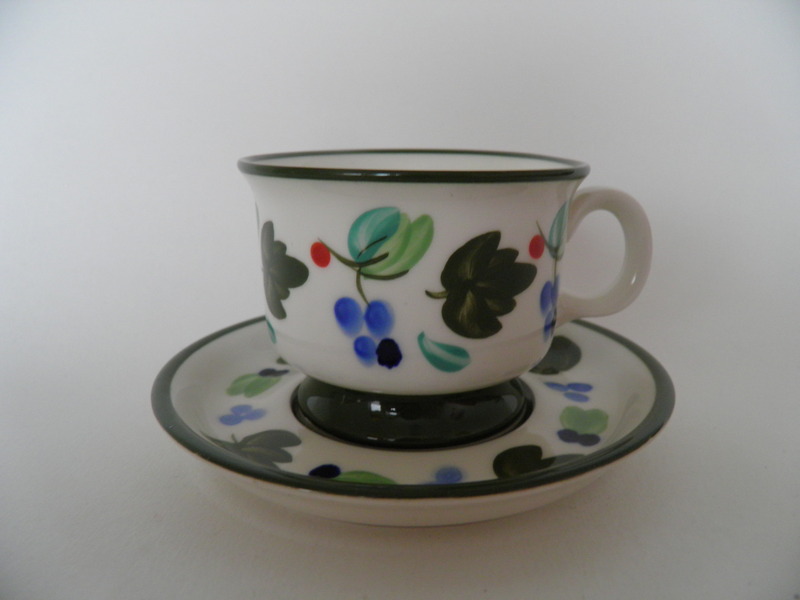 Green, handpainted tea cup & saucer, Arabia, Hilkka-Liisa Ahola. 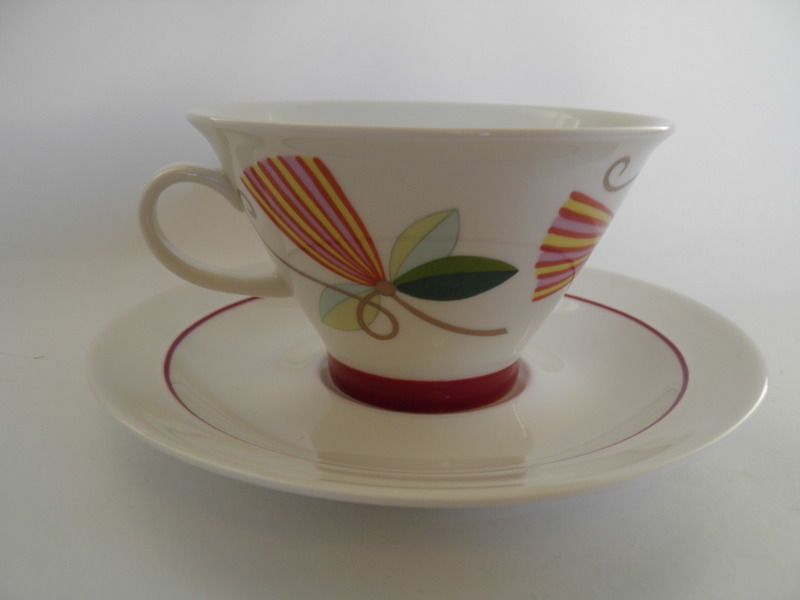 Handpainted lightbrown tea cup & saucer, Arabia, Hilkka-Liisa Ahola. 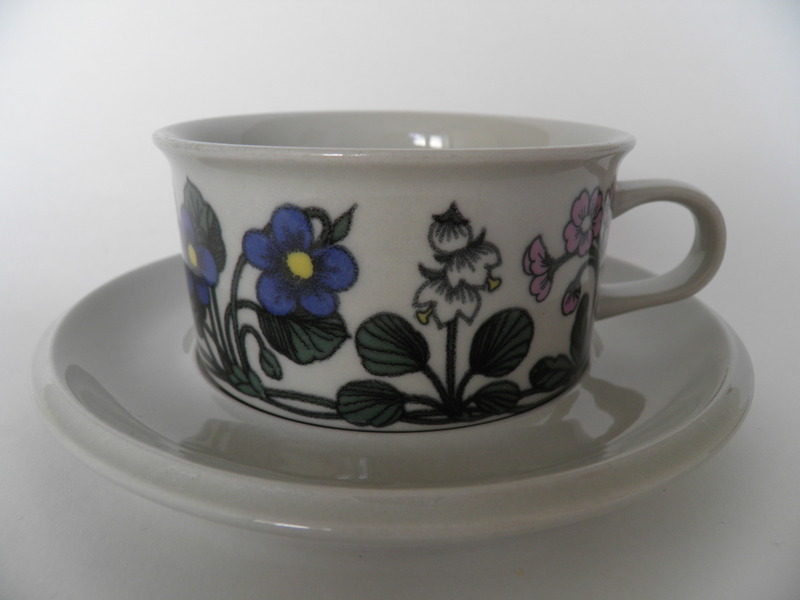 Retro, handpainted tea cup & saucer, Arabia Ateljé, Hilkka-Liisa Ahola. Tea for two tea cup & saucer, Arabia, Gunvor Olin-Grönqvist. 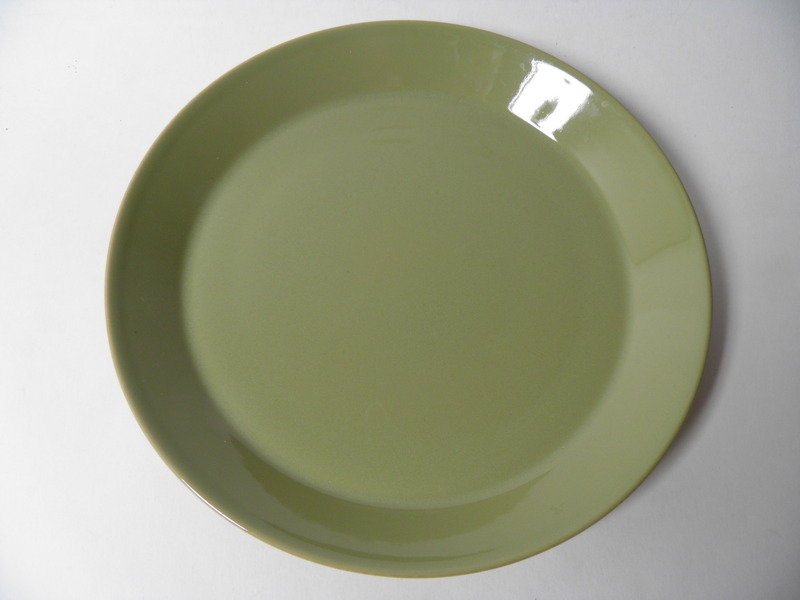 Olivegreen dinner plate by Teema -series, Arabia, Kaj Franck. 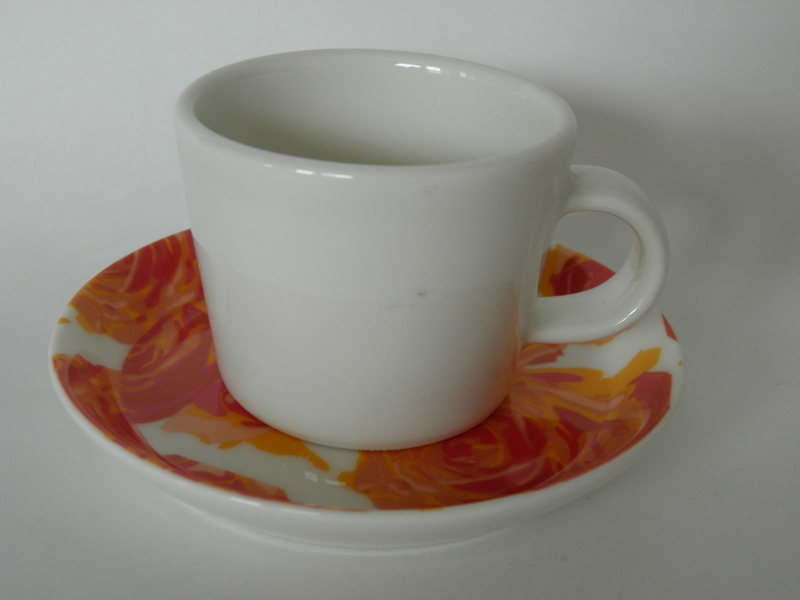 Handpainted Toini coffee cup & saucer, Arabia, Toini Muona. 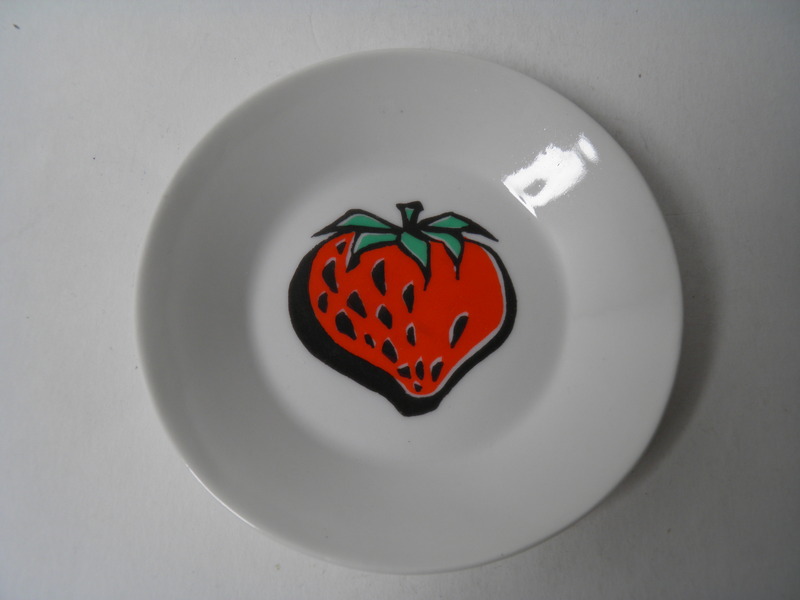 Handpainted Tomato plate by Vegetable -series, Arabia 1955-1957, Anja Juurikkala. Uudenveroinen Arabian Tutti Frutti -sarjan pieni lautanen, Mansikka, design Ulla Procopé. 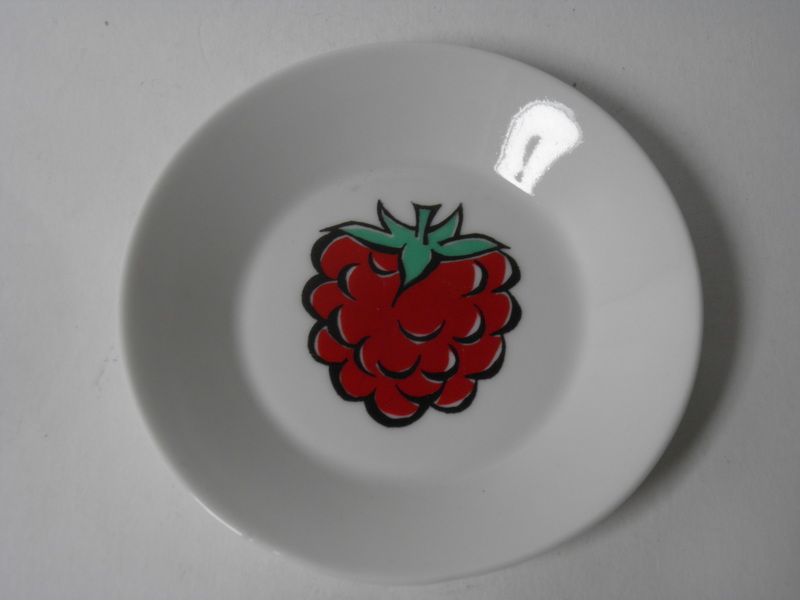 Small plate by Tutti Frutti -serie with raspberry decoration, Arabia, decoration Ulla Procopé. 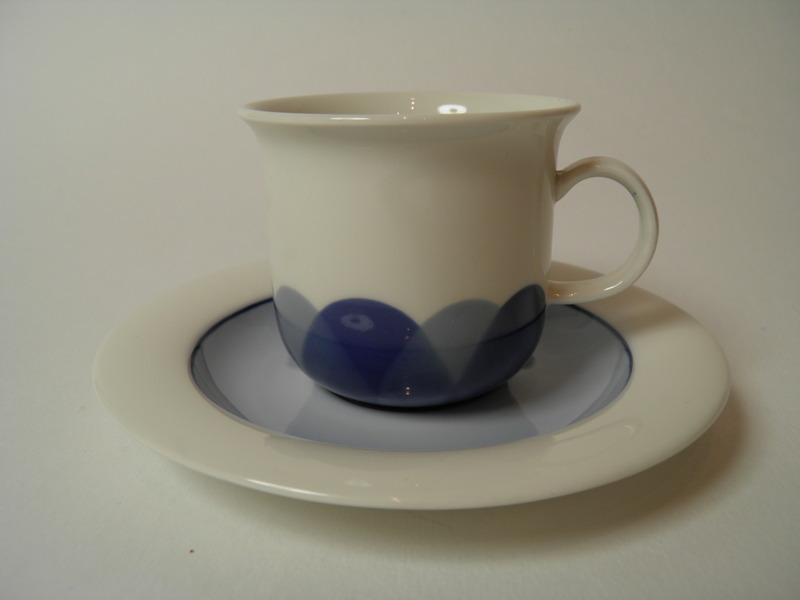 Tuuli coffee cup & saucer, Arabia 1983-1993, Heljä Liukko-Sundström. 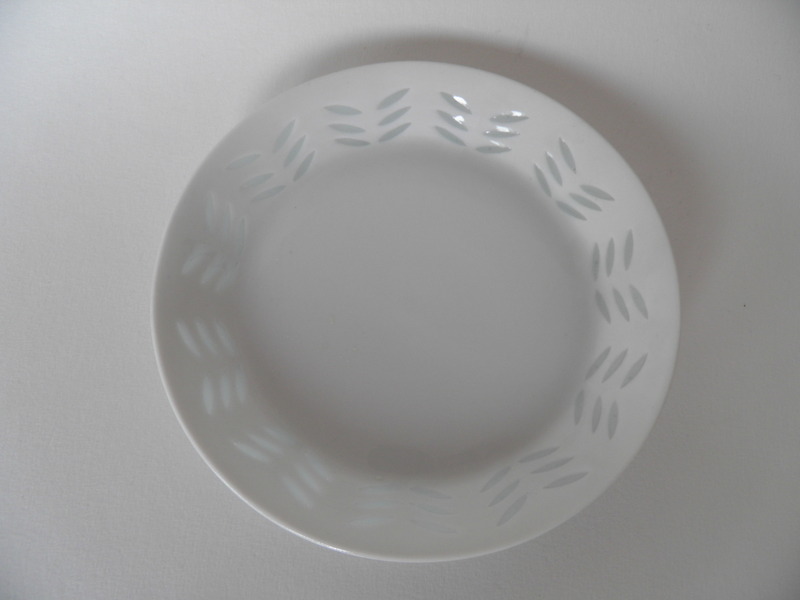 Soup plate by Tuuli -series, Arabia, Heljä Liukko-Sundström. 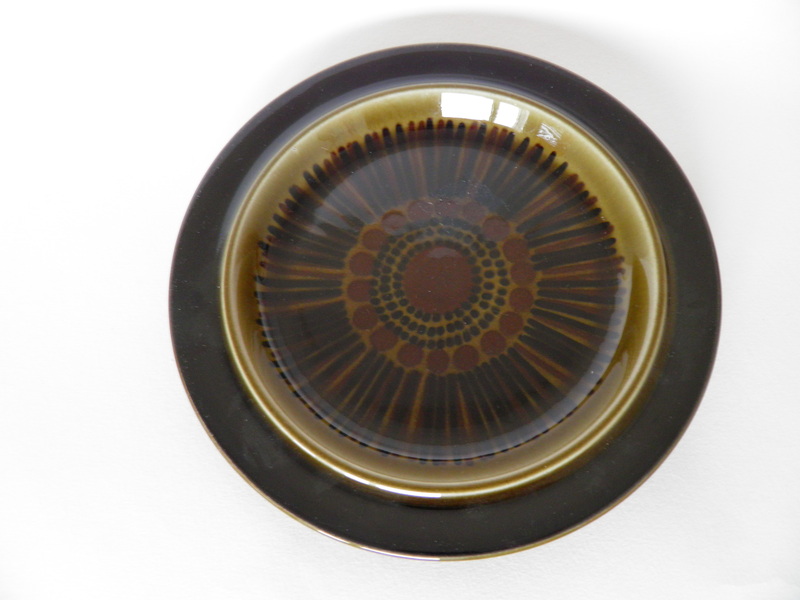 Side plate by Tuuli -series, Arabia, Heljä Liukko-Sundström. Tea cup & saucer by Tuuli (Wind) -series, Arabia, Heljä Liukko-Sundström. 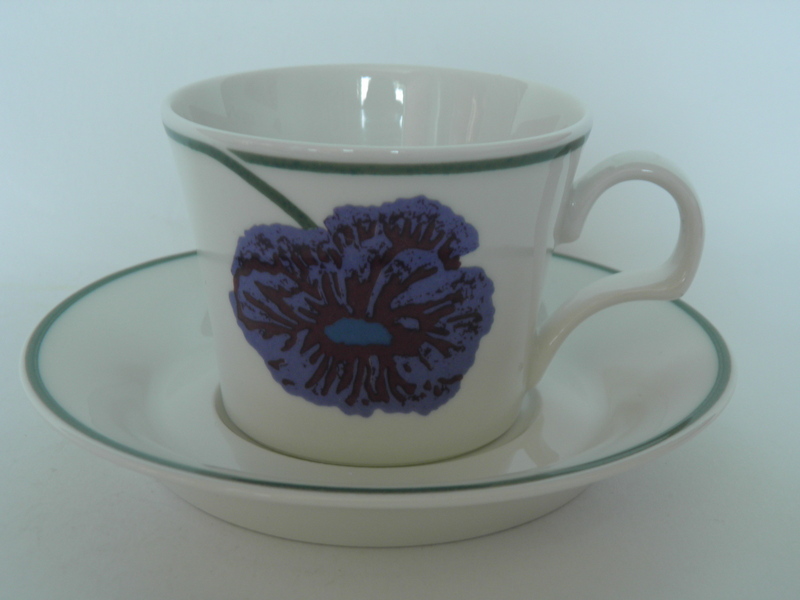 Handpainted Valencia coffee cup & saucer, Arabia, Ulla Procopé. 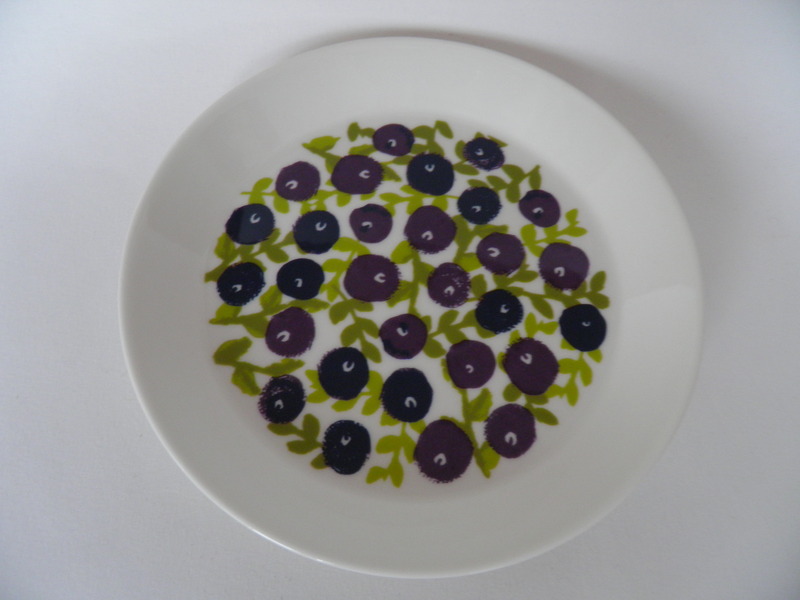 Deep plate by handpainted Valencia -series, Arabia, Ulla Procopé. 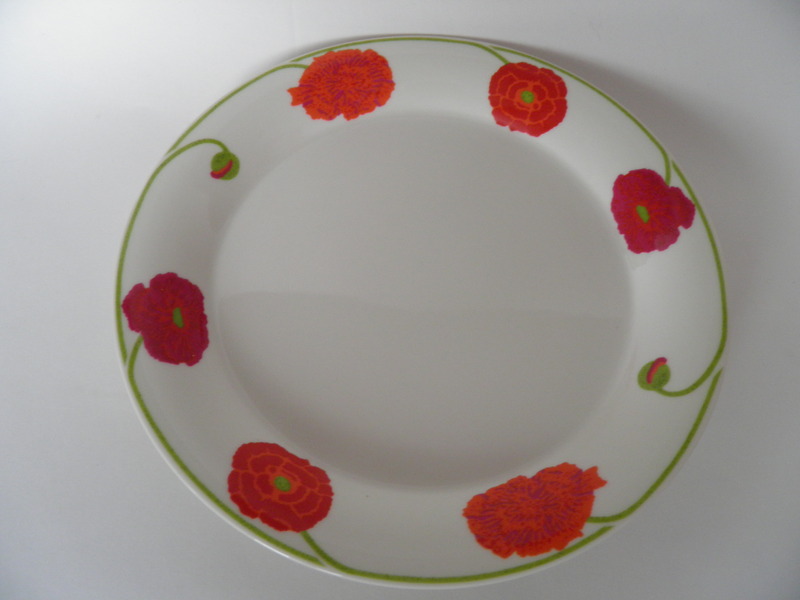 Handpainted Valencia dinner plate, Arabia, Ulla Procopé. 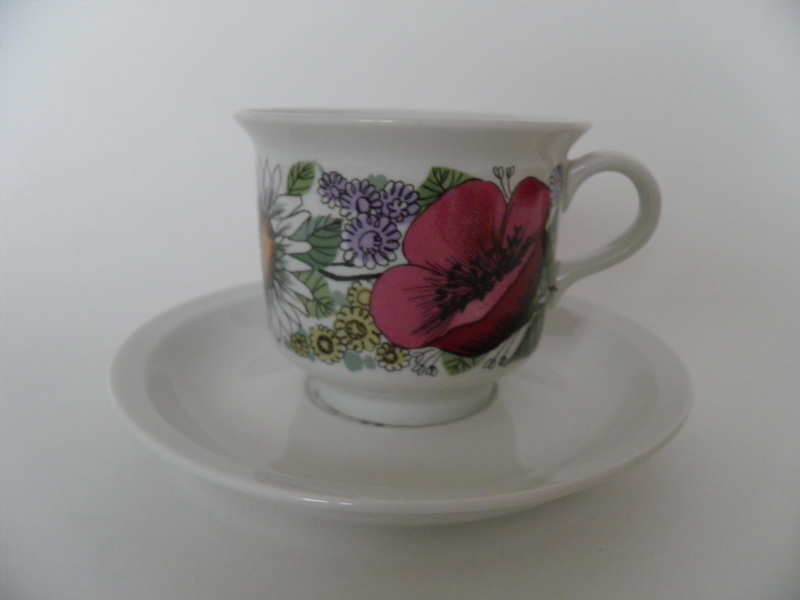 Hand painted small coffee cup & saucer by Valencia -series, Arabia, Ulla Procopé. 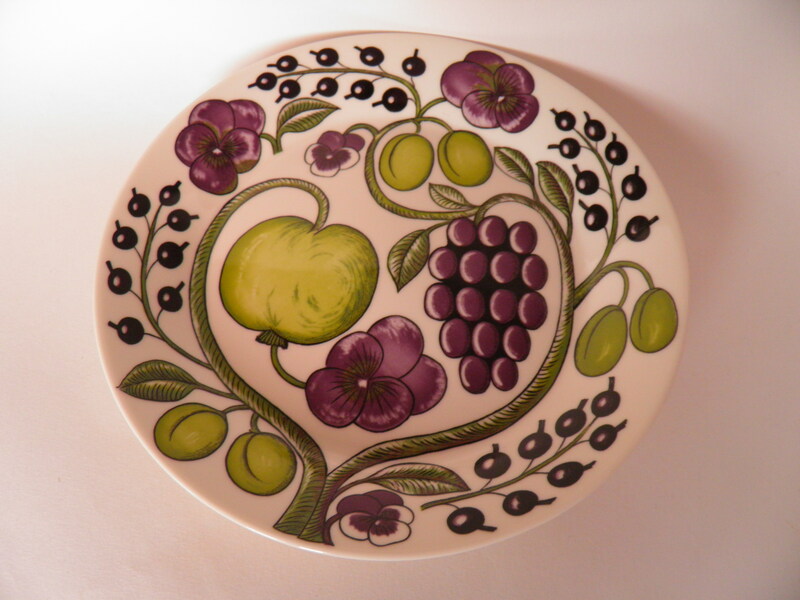 Handpainted side plate by Valencia -series, Arabia, Ulla Procopé. 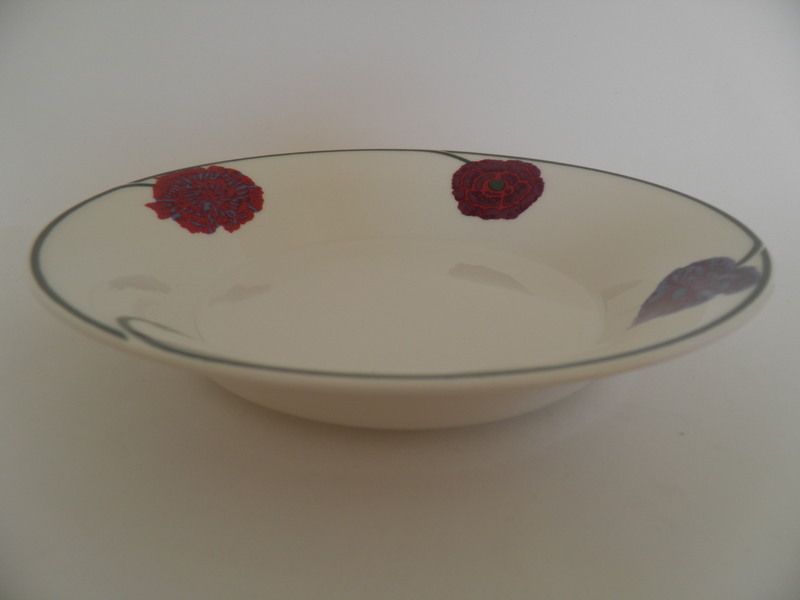 Handpainted Valencia side plate, Arabia, Ulla Procopé. 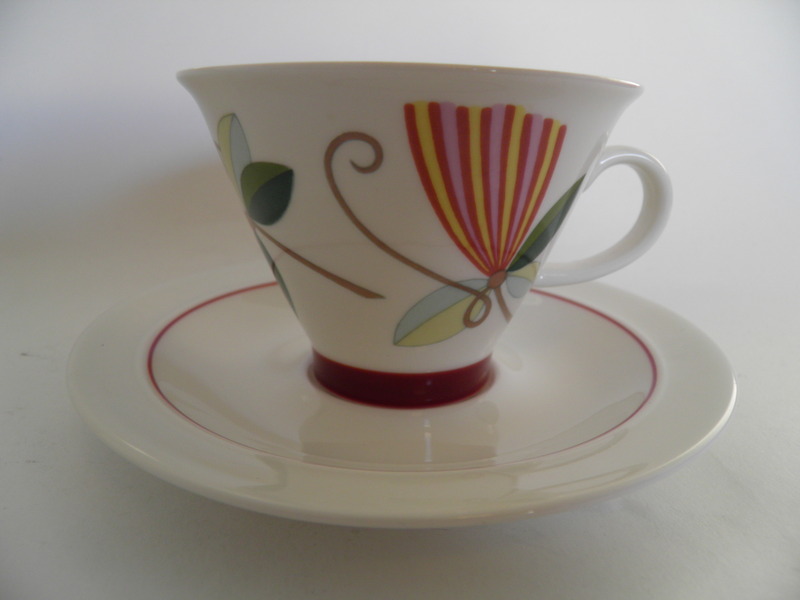 Handpainted Valencia tea cup & saucer, Arabia, Ulla Procopé. 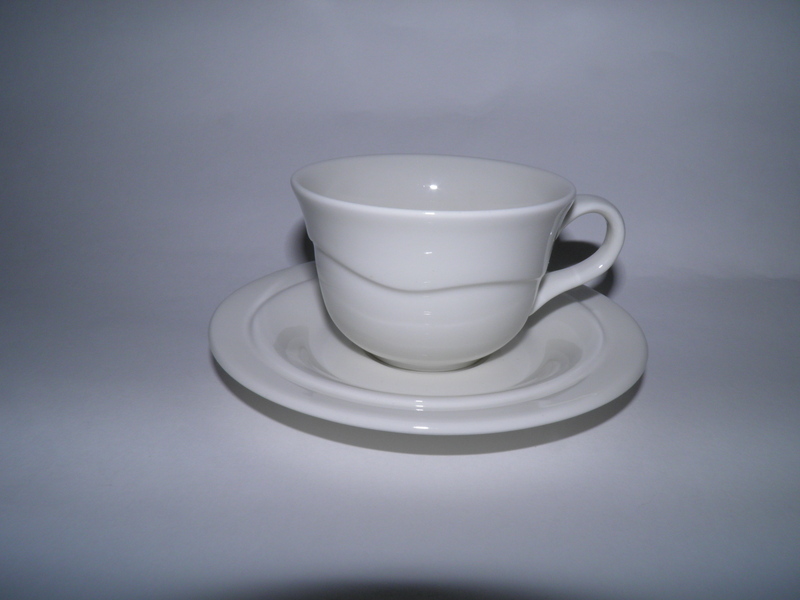 Coffee cup & saucer by Valmu -series, Arabia, Esteri Tomula. 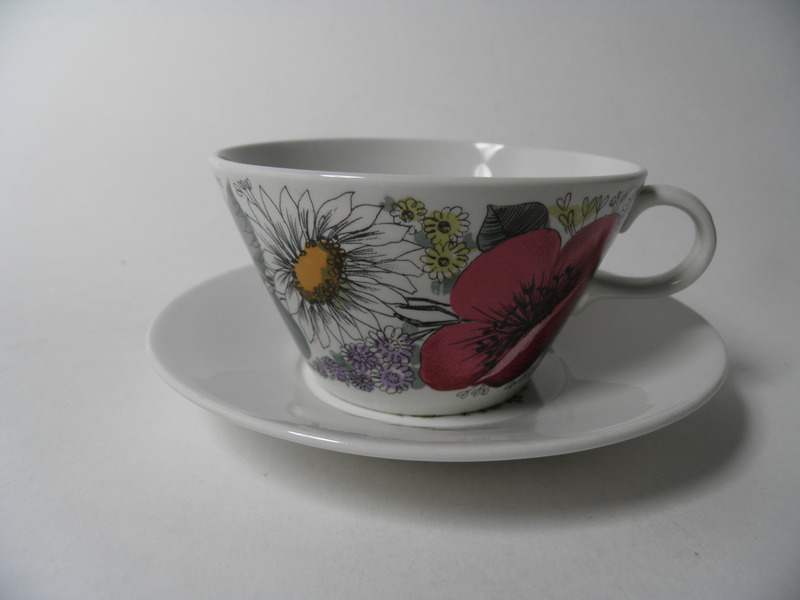 Tea cup & saucer by Valmu -series, Arabia, decoration Esteri Tomula. Veranda coffee cup & saucer, Arabia. Deep plate by Veranda -series, Arabia, decoration Inkeri Leivo. 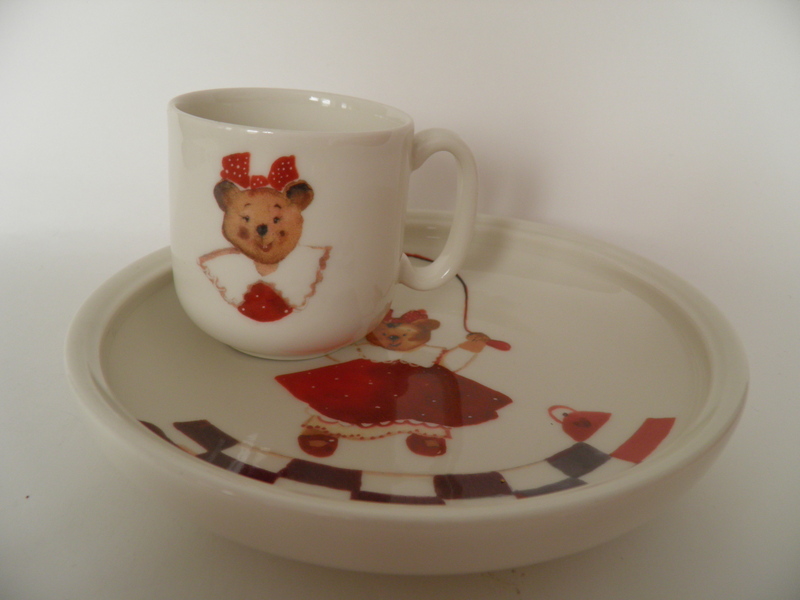 Children's plate & mug Viivi, Arabia, Minna Immonen. 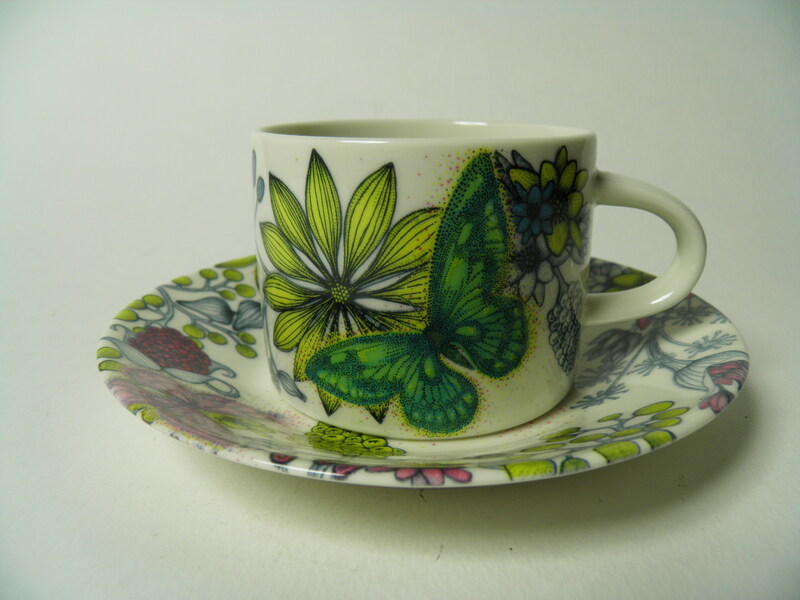 Handpainted mocha cup & saucer by Virva -series, Arabia, Anja Jaatinen-Winquist. 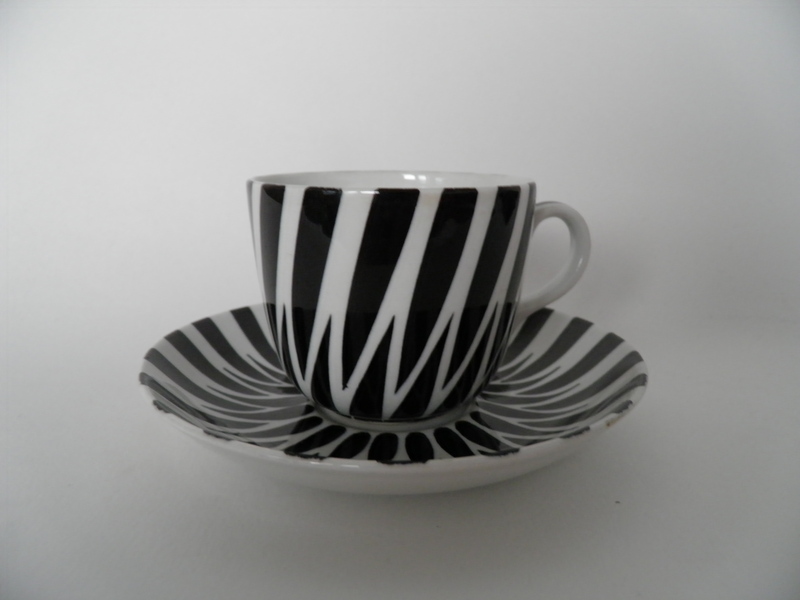 Handpainted Wellamo tea cup & saucer, Arabia, Peter Winqvist. 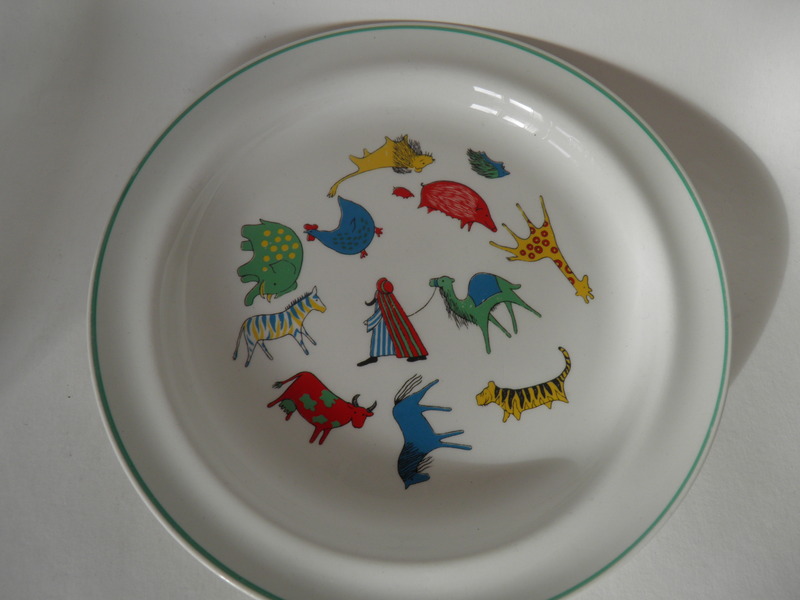 Zoo plate by Arabia. Designed by Anja Juurikkala. Good condition.